The online archives of the Ghetto Fighters’ House have been reconfigured, breaking the links in my former photo collection on the RODOH forum. Therefore I reproduce that collection below, to the extent permitted by my records. 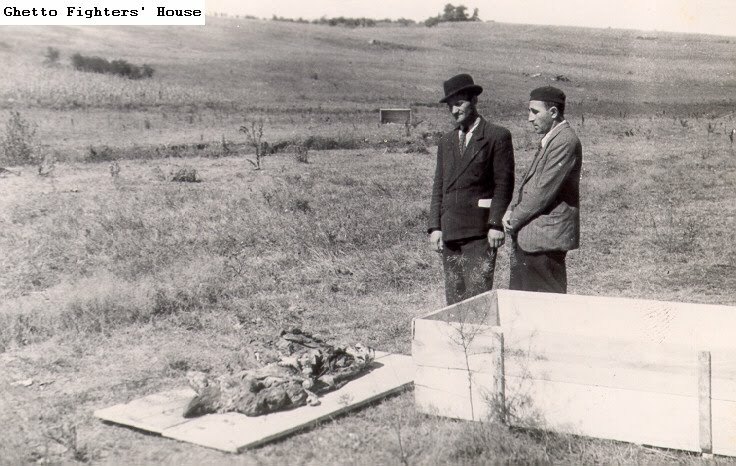 The photo captions are those I copied from the GFH Archives when putting together this collection. Where I'm aware of inaccuracies in a caption, this is pointed out. The images can be enlarged by clicking on them. 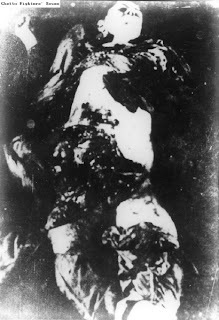 Needless to say, many of the photos are graphic and sensitive persons are advised against watching them. 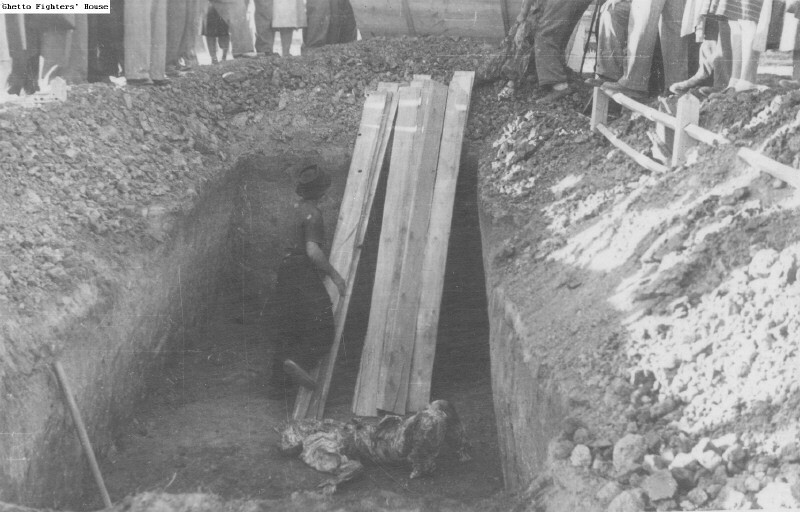 1.1 A body exhumed from a mass grave, being taken for proper burial. 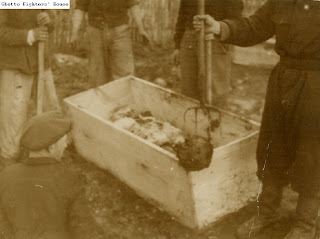 1.2 A body exhumed from a mass grave, being taken for proper burial. 1.3 A body exhumed from a mass grave, being taken for proper burial. 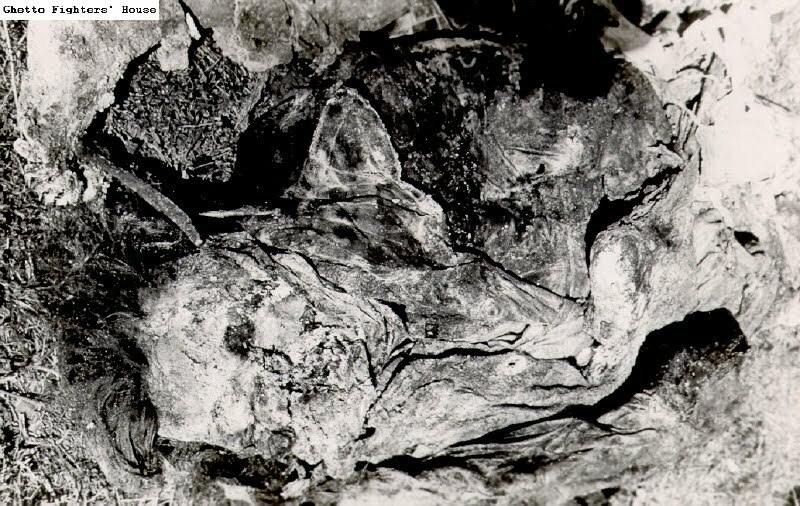 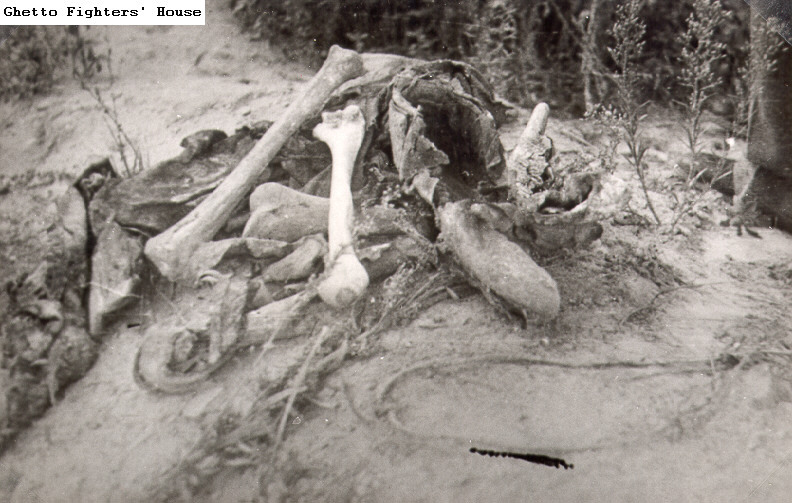 1.4 A body in a mass grave at the Ponary mass extermination site near Vilnius (Vilna). 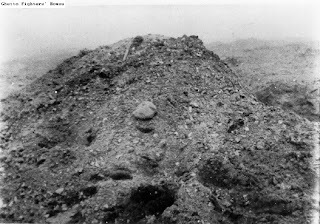 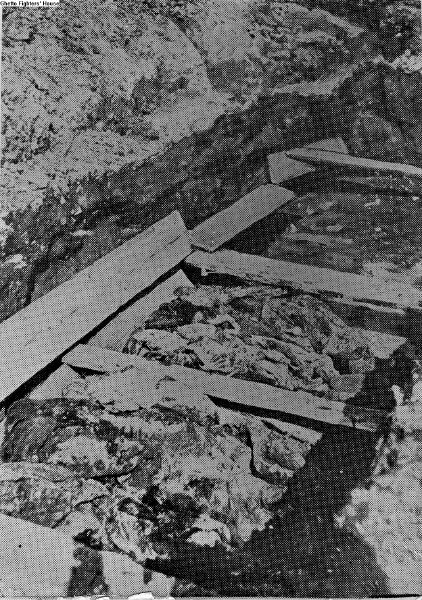 1.5 Corpses exhumed from a mass grave at the Ponary mass extermination site near Vilnius (Vilna). 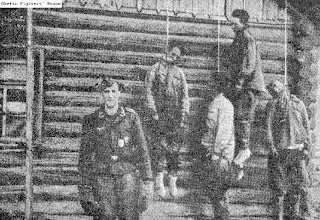 Update, 02.12.2017: This photo was not taken at Ponary but in Kovno, Lithuania. See Mattogno on the Mass Graves at Ponary (Part 3) (image 14). 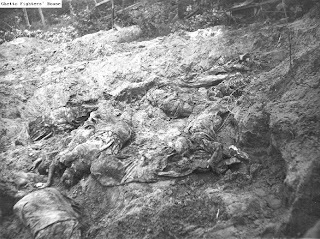 1.6 Corpses exhumed from mass graves at the Ponary mass extermination site near Vilnius (Vilna). 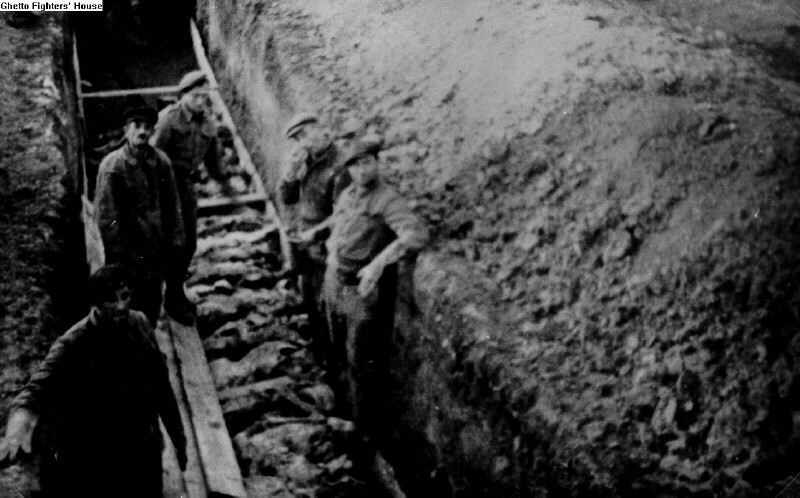 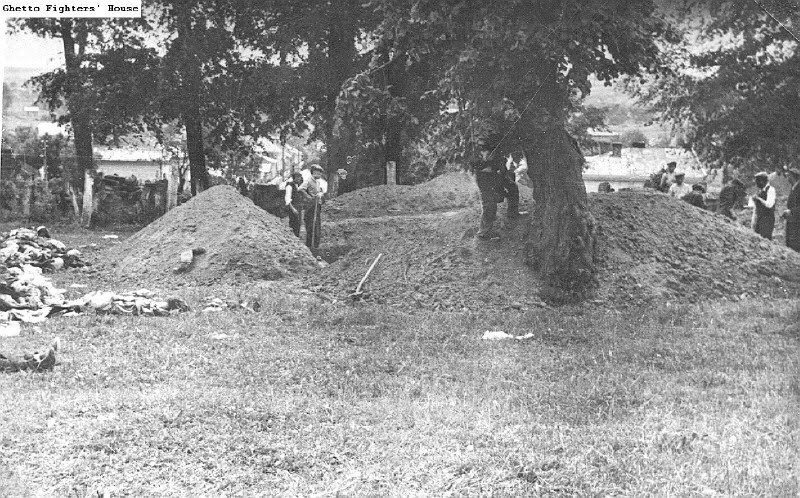 1.7 The excavation of mass graves at the Ponary mass extermination site near Vilnius (Vilna) in July 1944. 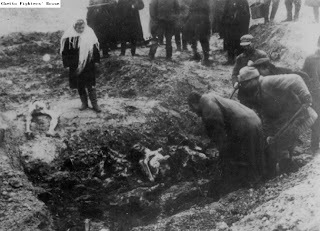 1.8 A German soldier shooting a Jew from Vinnitsa, Ukraine, at the edge of a mass grave. 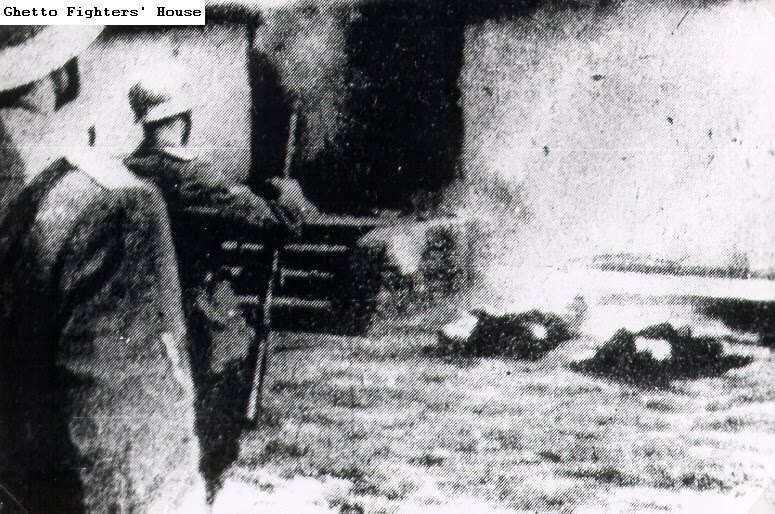 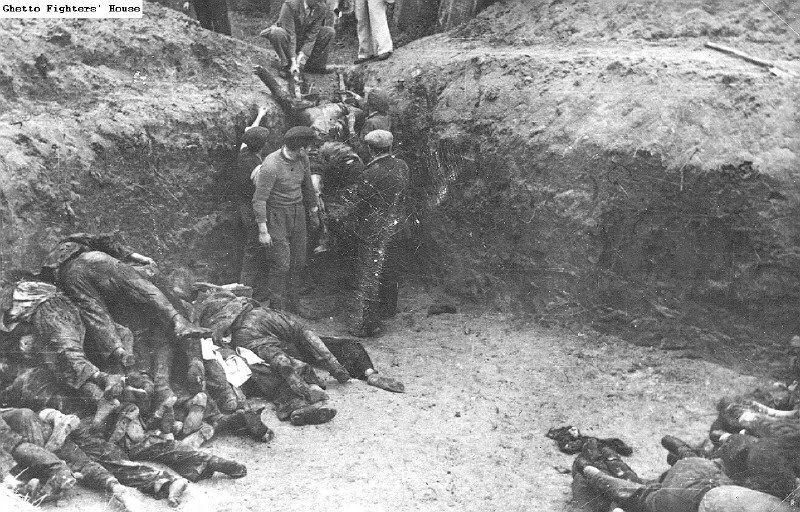 1.9 German soldiers shooting Jews who are still alive in a mass grave in Vinnitsa, USSR. 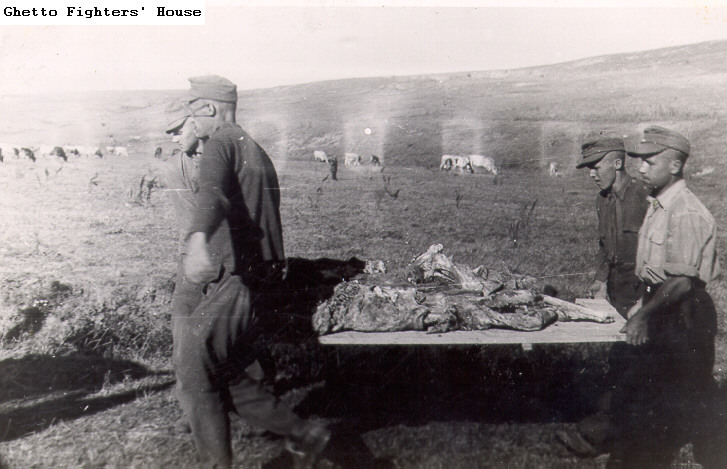 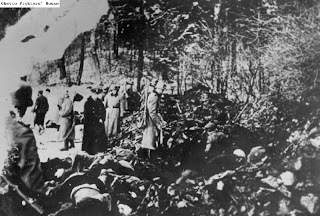 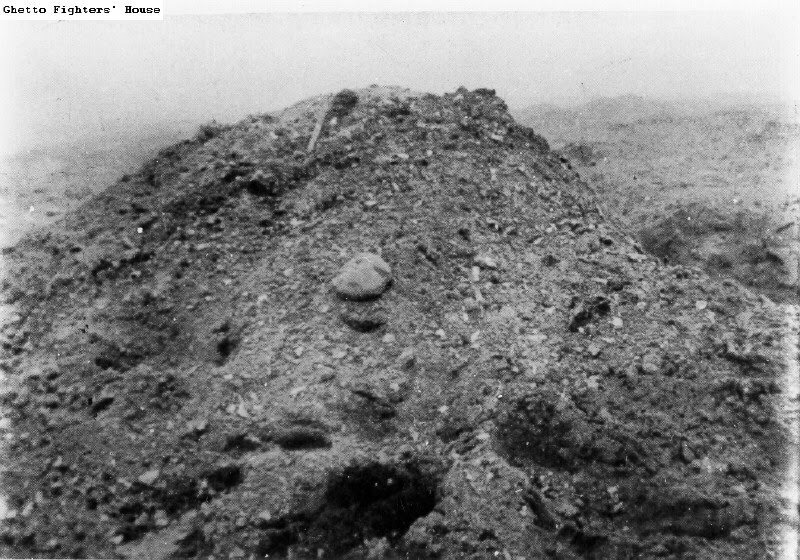 1.10 German soldiers standing amid the bodies lying in the mass grave in Vinnitsa, Ukraine. 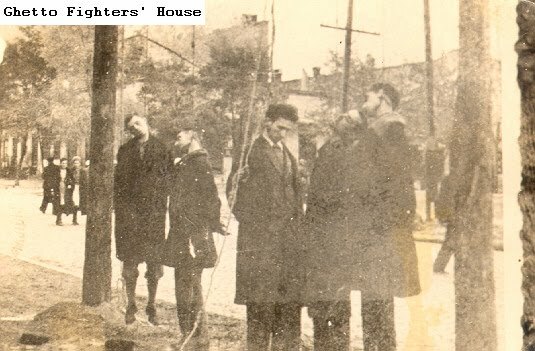 The GFH captions of photos 1.9 and 1.10 are incorrect insofar as the place where these photographs were taken was not Vinnitsa. See the blog Photographic Evidence of Mass Shootings: 1. 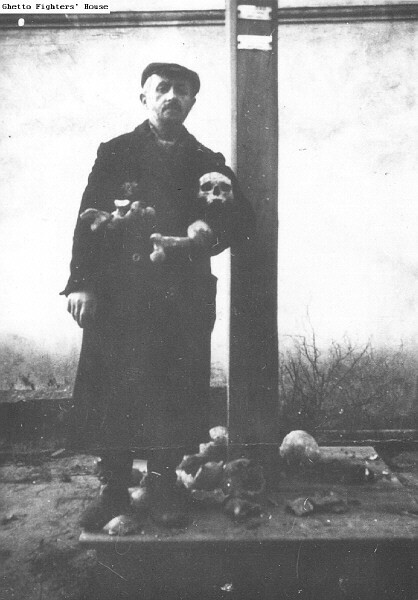 Sdolbunov by Jonathan Harrison, whom I thank for bringing this to my attention. 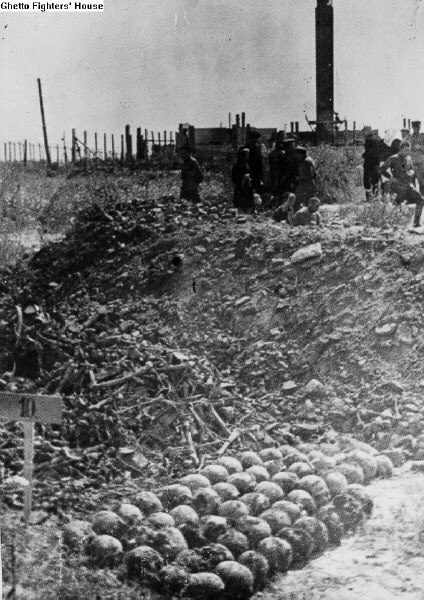 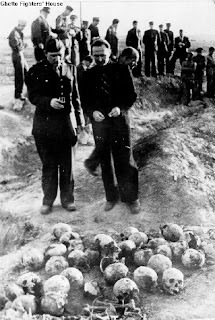 1.11 Two uniformed men beside a vast mass grave containing the bodies of Jews killed in Vinnitsa, Ukraine. 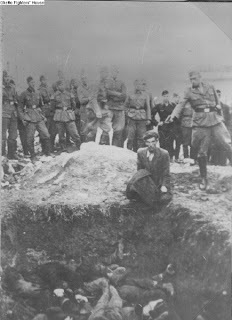 1.12 A Jew burying bodies in a mass grave in the Jewish cemetery in Warsaw. 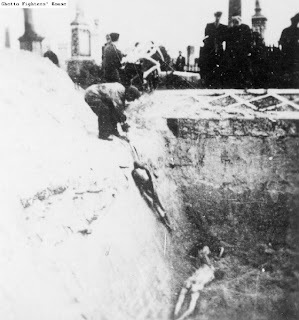 1.13 A Jewish gravedigger laying bodies in a mass grave in the Jewish cemetery in Warsaw. 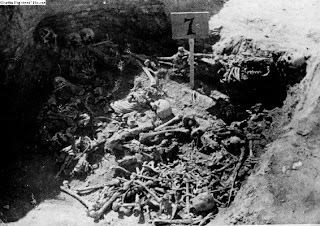 1.14 A mass grave in the Jewish cemetery in Warsaw. 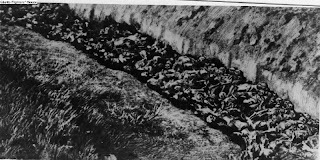 1.15 A mass grave in the Jewish cemetery in Warsaw. 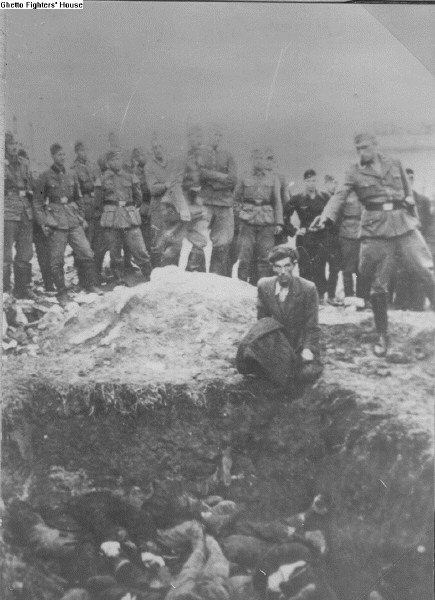 1.16 Bodies being lowered into a large mass grave in the Jewish cemetery in Warsaw. 1.17 Bodies brought on carts, being lowered into a mass grave in the Warsaw Jewish cemetery. 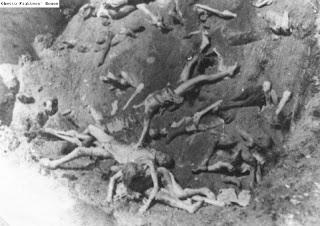 1.18 Bodies in a mass grave in the Jewish cemetery in Warsaw. 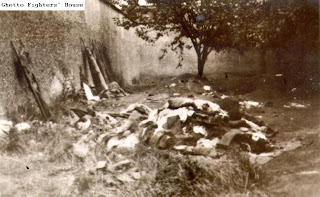 1.19 Bodies in a mass grave in the Jewish cemetery in Warsaw. 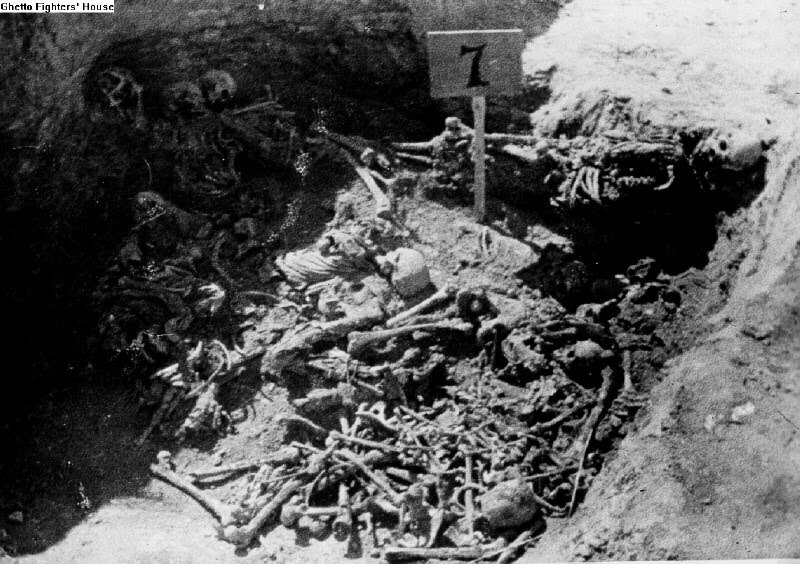 1.20 Bodies in a mass grave in the Jewish cemetery in Warsaw. 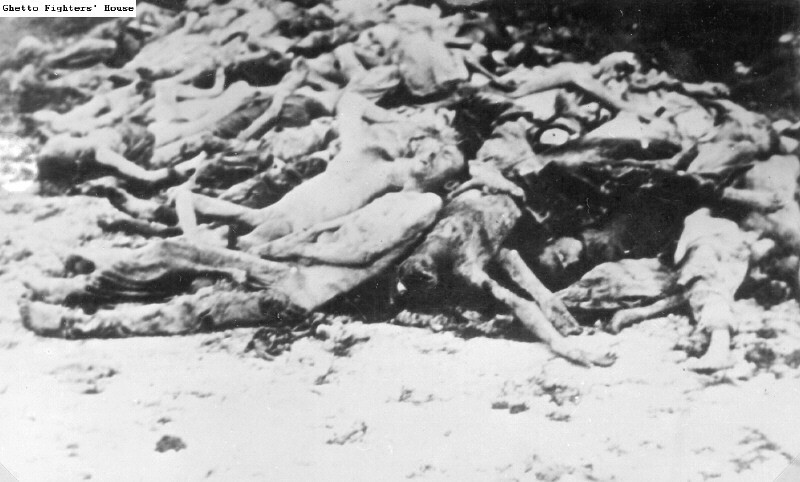 1.21 Bodies in a mass grave in the Jewish cemetery in Warsaw. 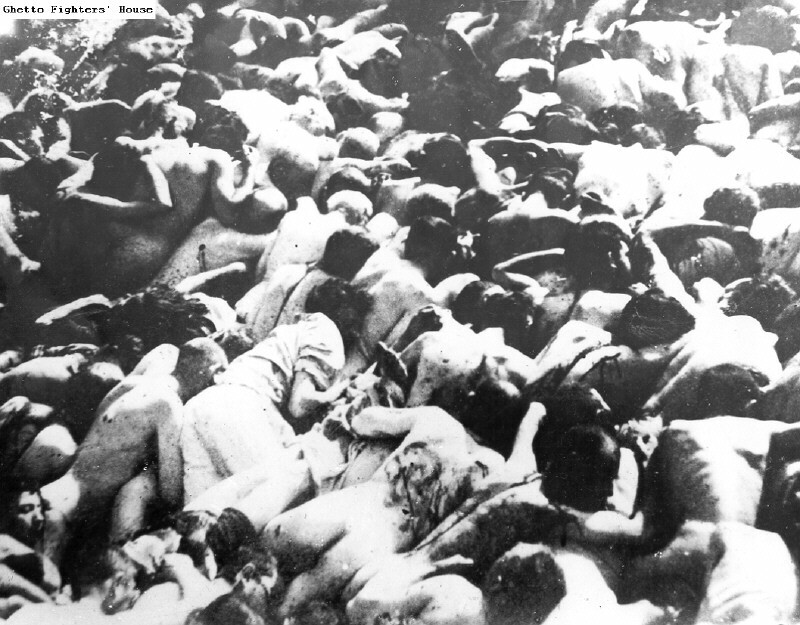 1.22 Bodies in a mass grave in the Warsaw ghetto's Jewish cemetery. 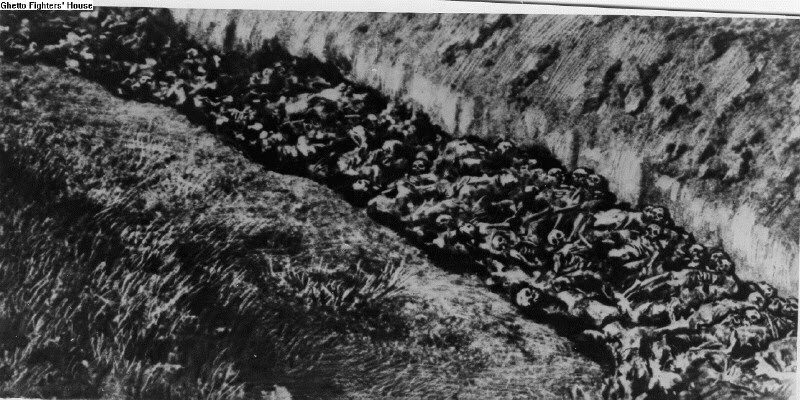 1.23 Bodies lying in a mass grave in the Jewish cemetery in Warsaw. 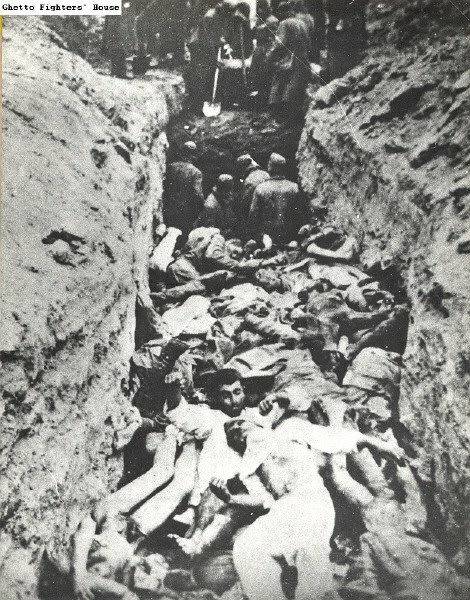 1.24 Bodies lying in a mass grave in the Warsaw ghetto. 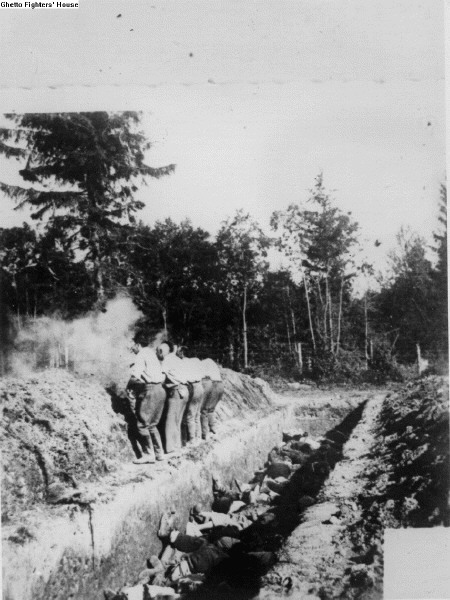 1.25 Gravediggers covering a mass grave in the Jewish cemetery in Warsaw. 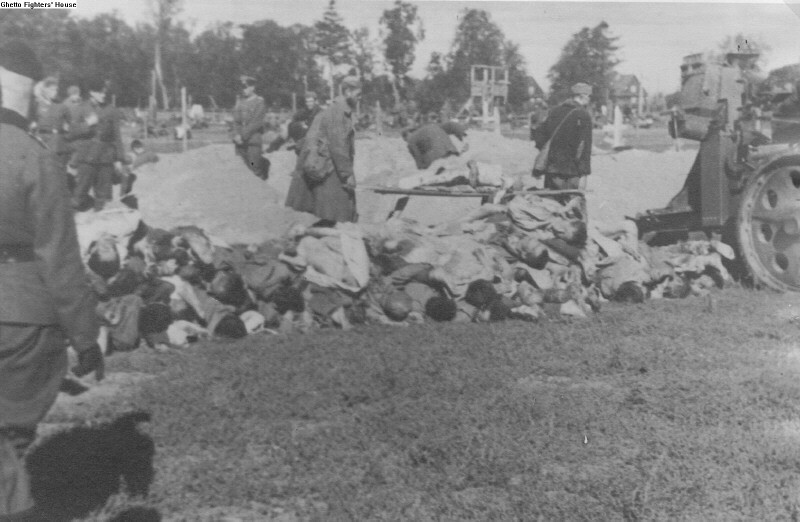 1.26 Gravediggers laying bodies in a mass grave in the Jewish cemetery in Warsaw. 1.27 Gravediggers laying bodies in a mass grave in the Jewish cemetery in Warsaw. 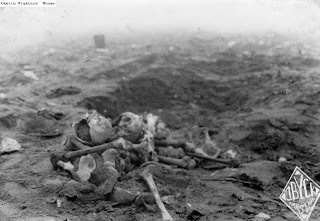 1.28 A mass grave beside the Majdanek camp. 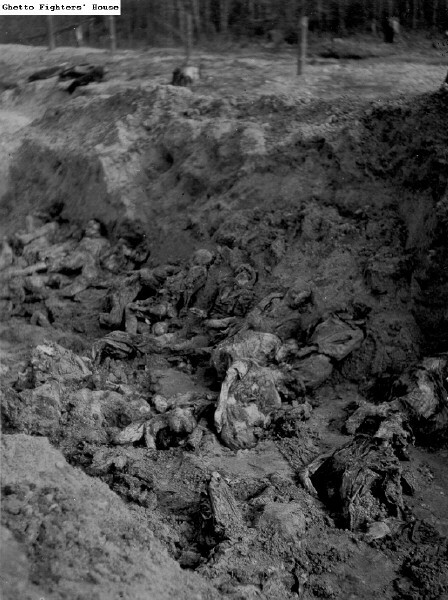 1.29 A mass grave containing the bodies of 230 victims, uncovered in the Majdanek camp. 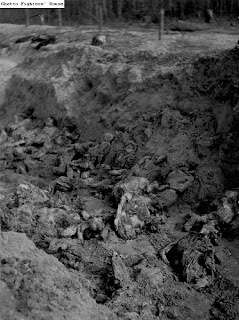 1.30 An uncovered mass grave containing the remains of people killed in the Majdanek camp. 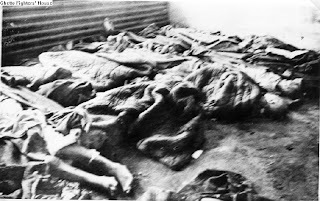 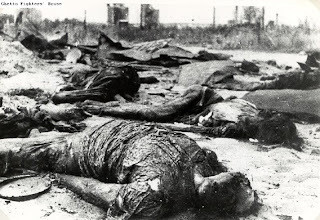 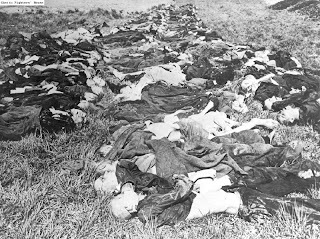 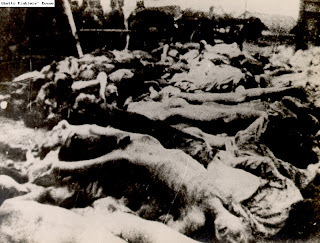 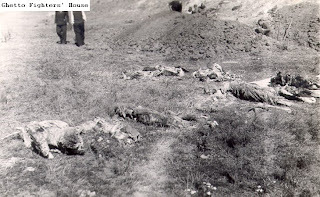 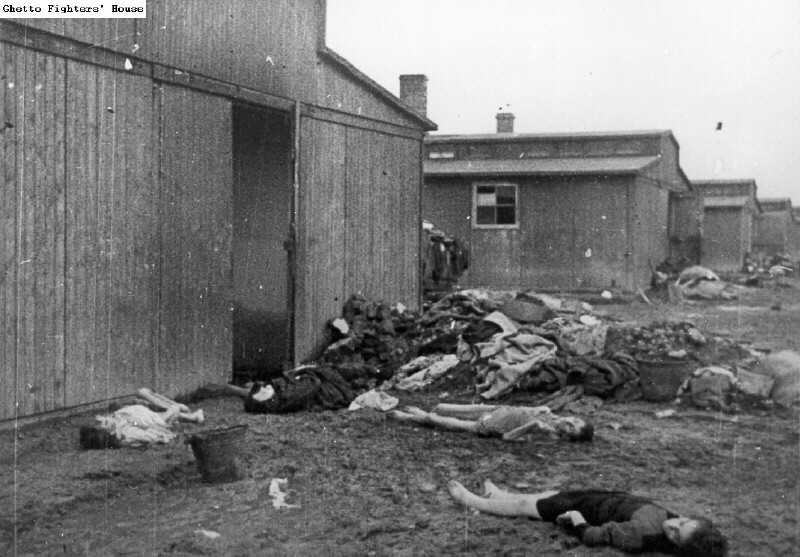 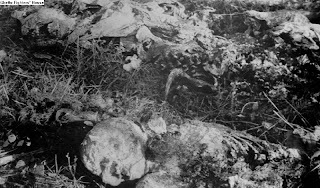 1.31 Bodies in a mass grave uncovered in the Majdanek camp. 1.32 The bones of Majdanek camp victims, uncovered in a mass grave. 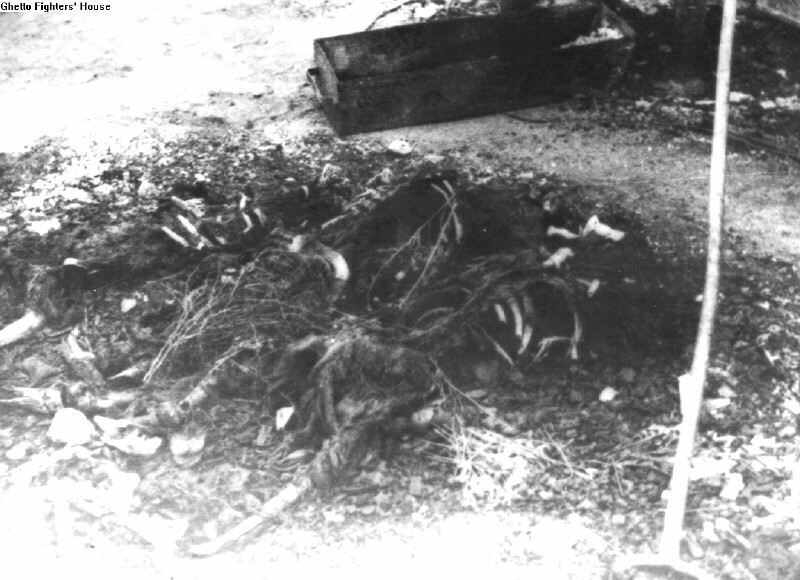 1.33 The remains of bodies in a mass grave in the Majdanek camp. 1.34 The remains of bodies in a mass grave in the Majdanek camp. 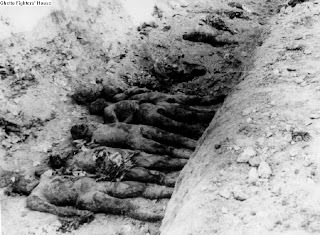 1.35 The remains of victims of the Majdanek camp in a mass grave that was opened. 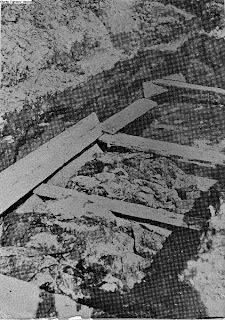 1.36 A mass grave containing the bodies of Janowska camp inmates. 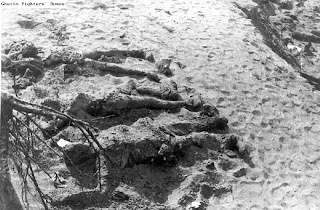 1.37 A mass grave discovered in Iwje, Poland. 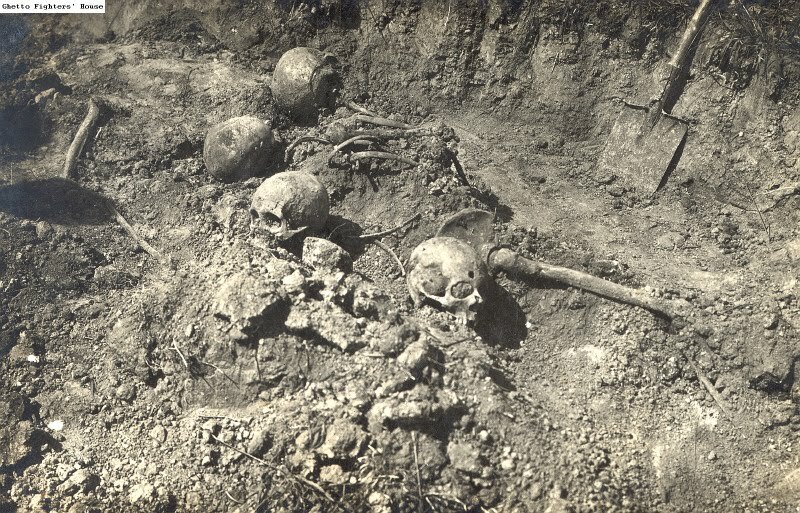 1.38 A mass grave discovered in Iwje, Poland. 1.39 Jews who returned to the town of Iwje, beside a mass grave discovered there. 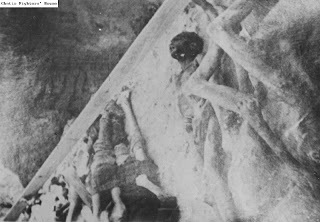 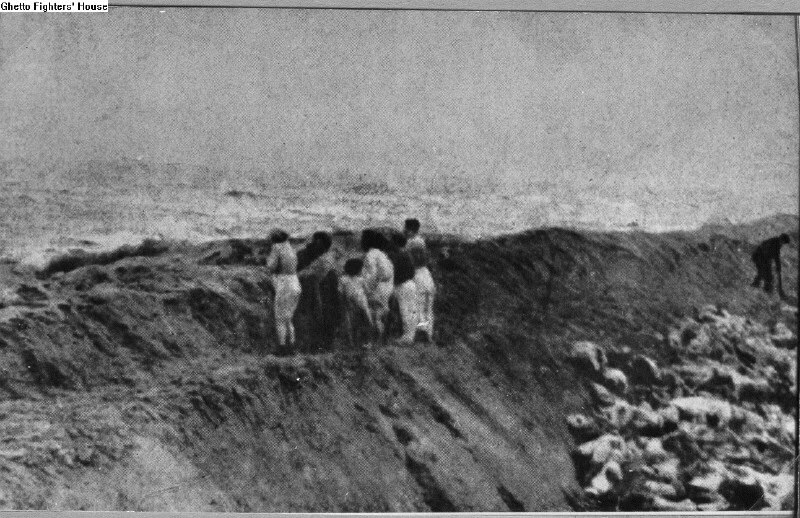 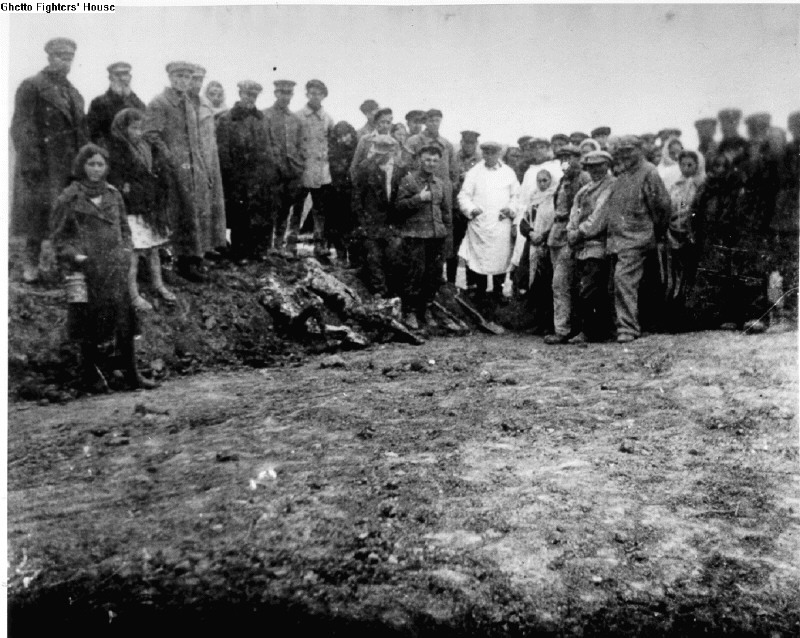 1.40 People viewing the corpses of Jews in a mass grave that was discovered in Iwje. 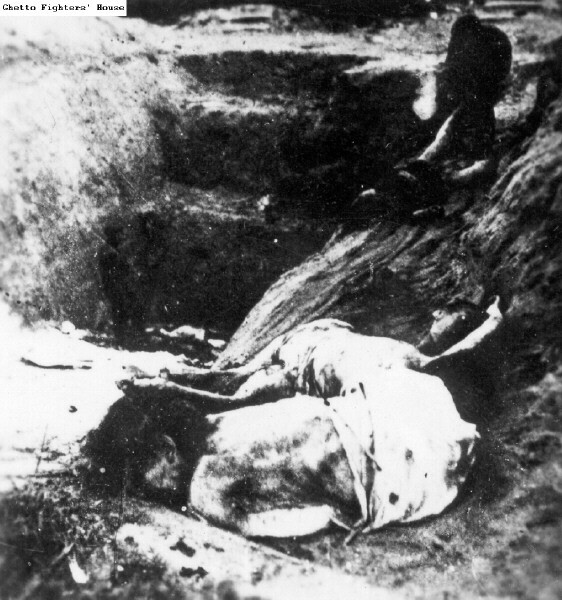 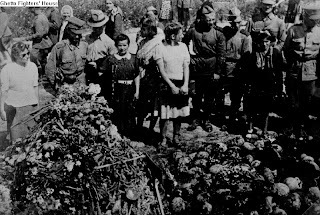 1.41 A mass grave in Drobitski Yar near Kharkov. 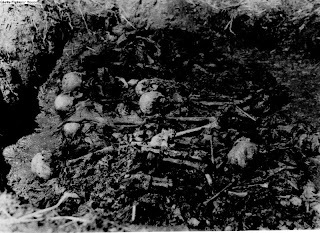 1.42 A mass grave in Drobitski Yar near Kharkov. 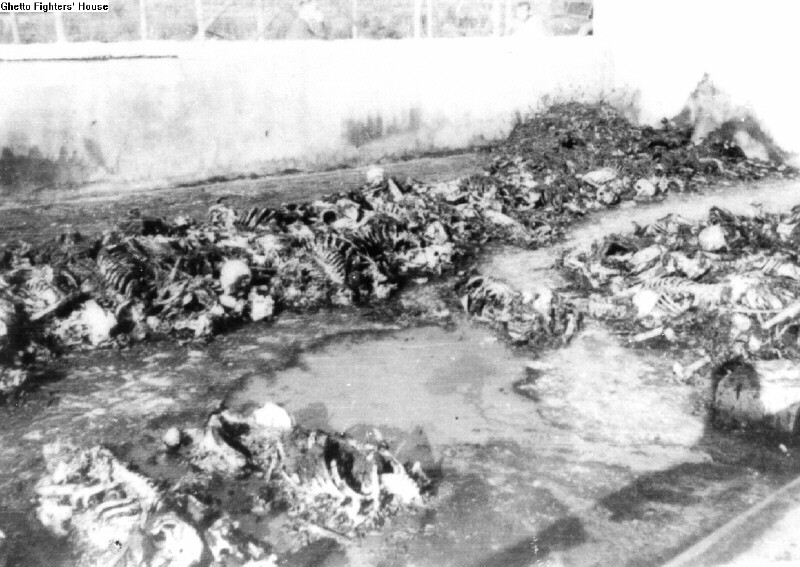 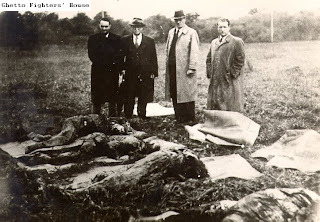 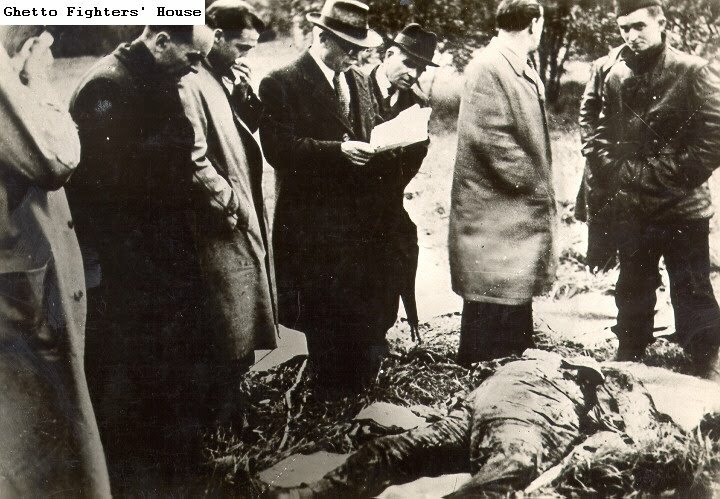 1.43 A mass grave in Kragujevac, Serbia, containing bodies of Jewish men. 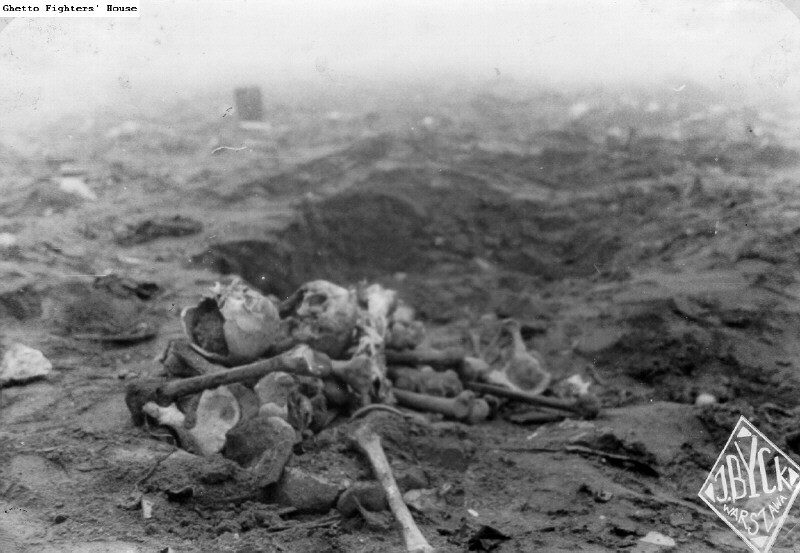 1.44 A mass grave in the Birkenau camp that was uncovered following the camp's liberation. 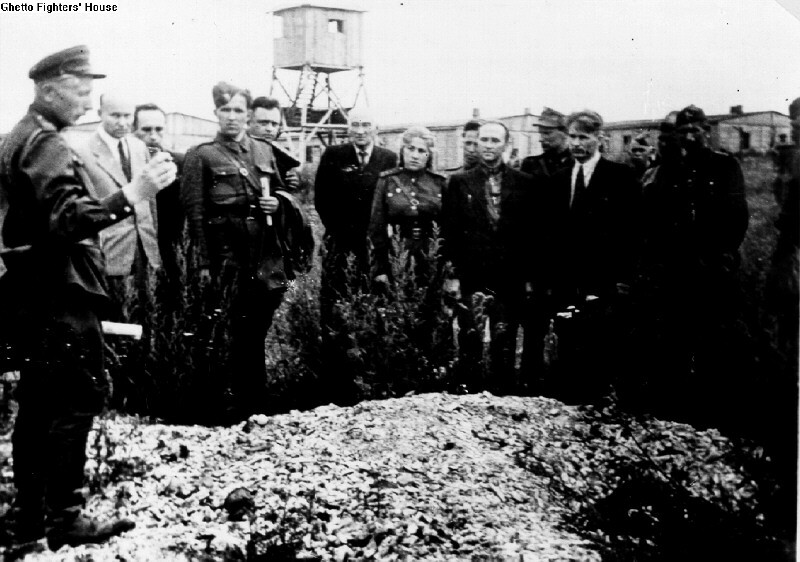 1.45 A mass grave of Lenin Jewry (in the Polesye region, on the Russo - Polish border). 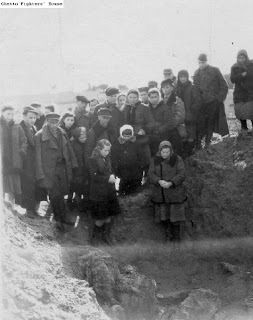 1.46 A Soviet investigating committee beside a mass grave of the Jews of Kozin, which they excavated. 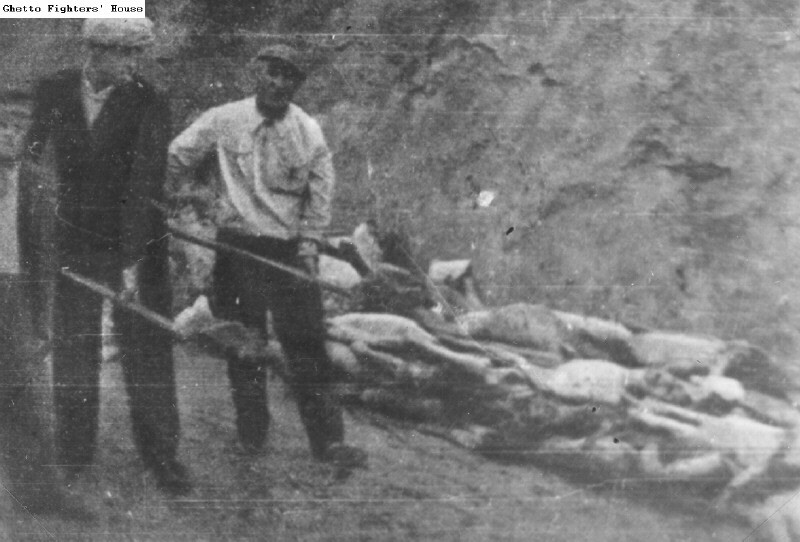 1.47 A Soviet investigating committee excavating a mass grave of the Jews of Kozin. 1.48 A Soviet investigating committee that excavated the three mass graves of Kozin Jewry, standing beside the corpse of the last Jew to be buried. 1.49 Bodies exhumed from a mass grave at an execution site, being given proper burial in a mass grave. 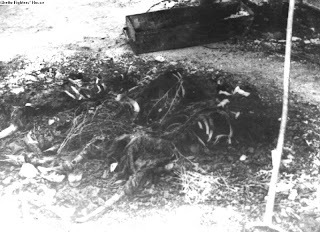 1.50 Bodies exhumed from a mass grave, to be taken for proper burial. 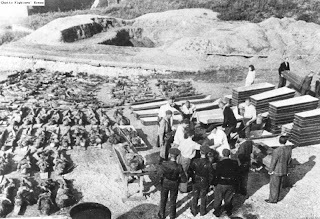 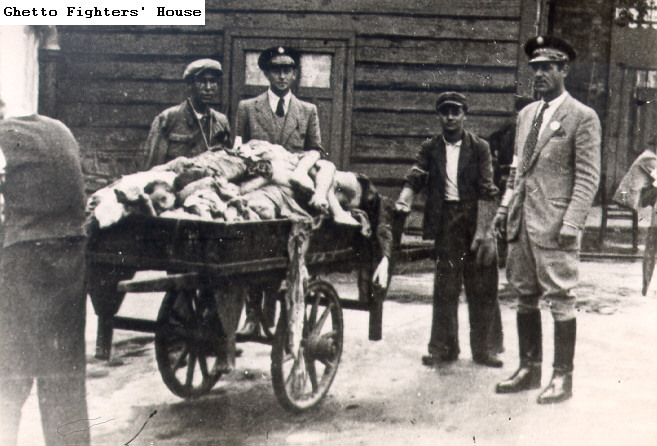 1.51 Bodies exhumed from mass graves, being loaded onto a truck and taken for proper burial. 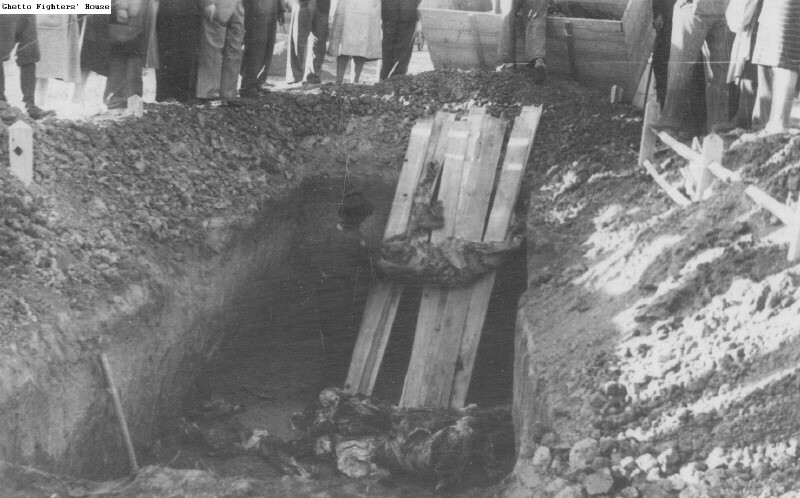 1.52 Bodies exhumed from mass graves, being loaded onto a truck and taken for proper burial. 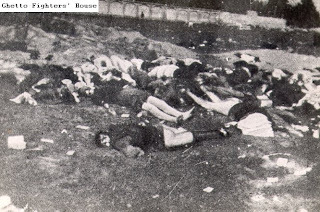 1.53 Bodies in a mass grave. 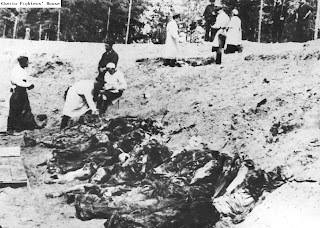 1.54 Bodies in a mass grave. 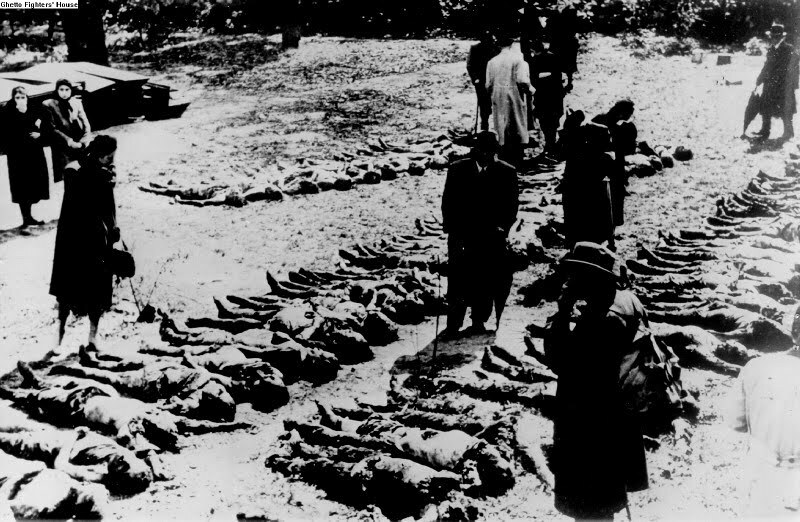 1.55 Bodies laid out in a row, after exhumation from a mass grave. 1.56 Bodies laid out in a row, possibly after exhumation from a mass grave. 1.57 Bodies laid out in a row, possibly after exhumation from a mass grave. 1.58 Bodies taken from a mass grave in Taganrov, Russia. 1.59 Bodies taken out of a mass grave in Banjica, Yugoslavia. 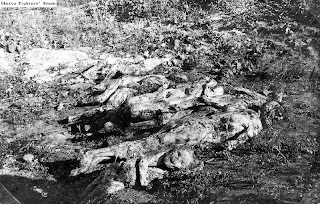 1.60 Bodies that had been exhumed from mass graves, apparently at an execution site. 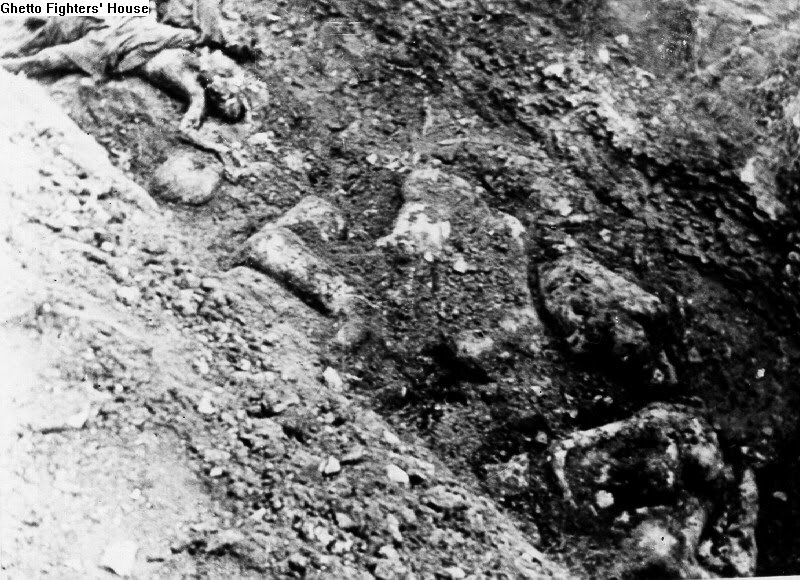 1.61 Bodies that had been exhumed from mass graves, apparently at an execution site. 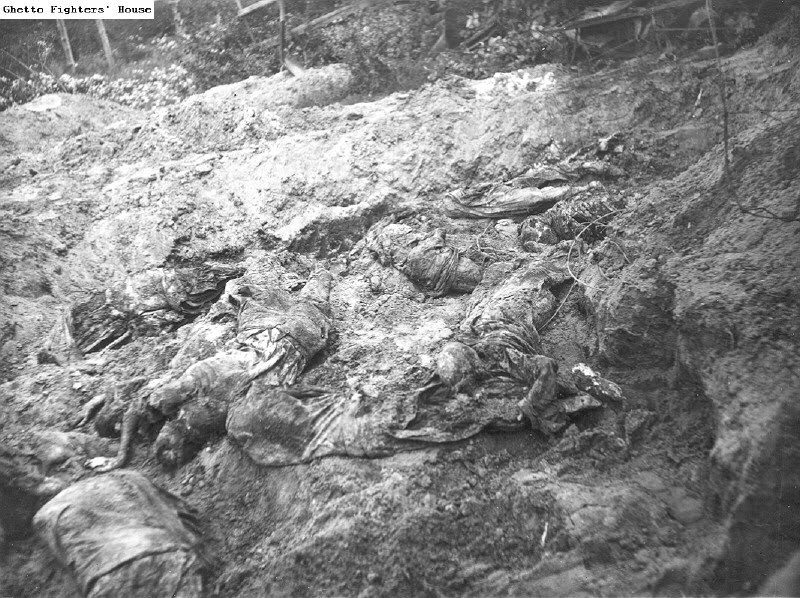 1.62 Bodies that were exposed in a mass grave. 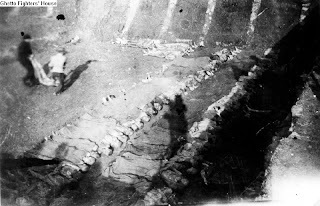 1.63 Bones and skulls that were exposed in a mass grave. 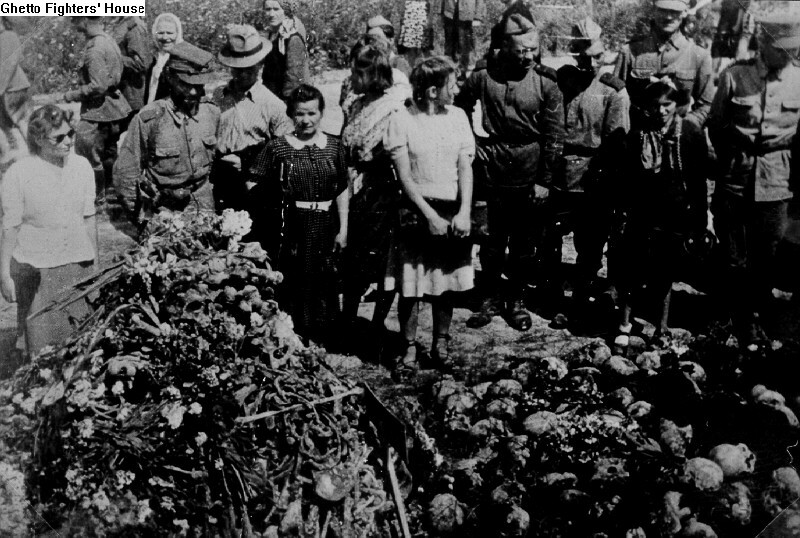 1.64 Civilians standing beside a mass grave of Jews in Zhmerinka, Ukraine. 1.65 The exhumation of Jews' bodies from a mass grave in Zhmerinka, Ukraine. 1.66 Corpses exhumed from a mass grave and laid out in rows. 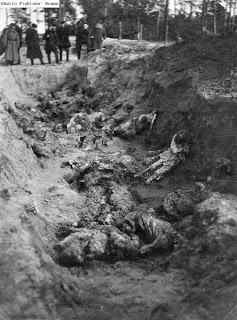 1.67 Corpses exhumed from mass graves and laid out in rows. 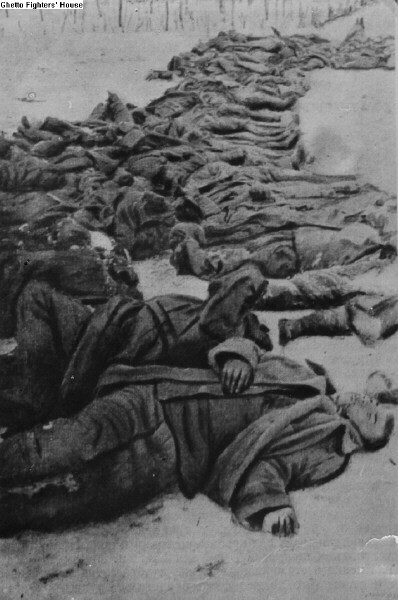 1.68 Bodies of Soviet POW's killed by the Germans. 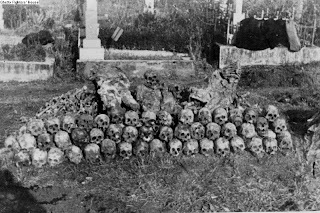 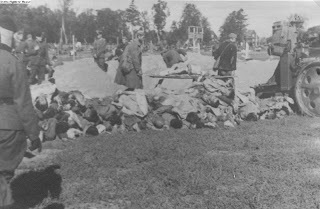 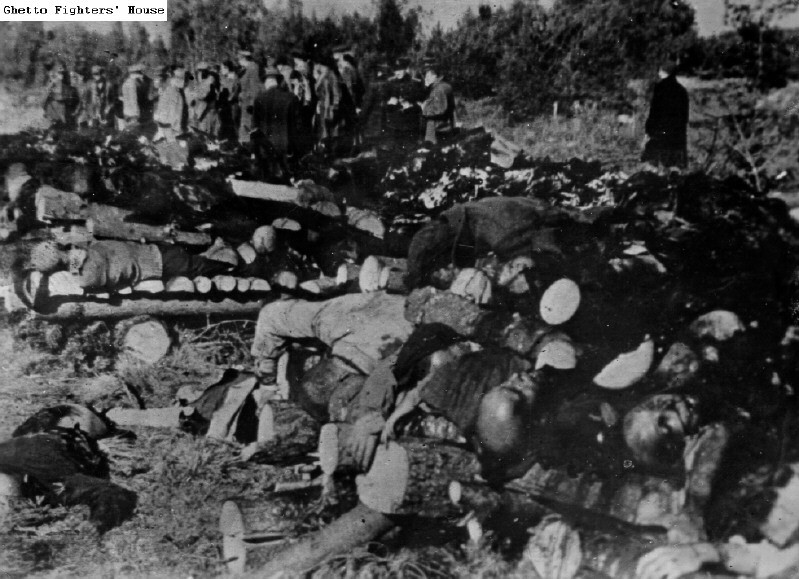 1.69 Corpses lying atop a mass grave in Siauliai, Lithuania. 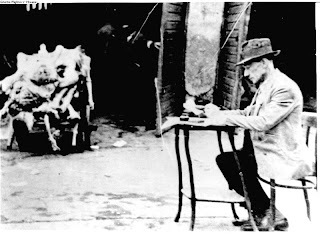 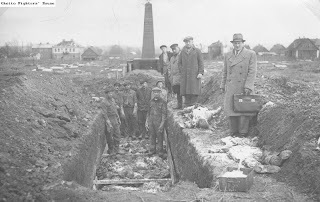 1.70 Digging mass graves before the killing of Lancut Jewry. 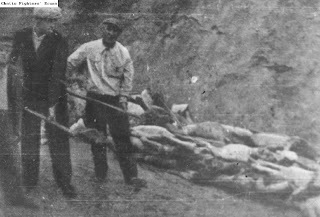 1.71 Gravediggers lowering bodies into a mass grave in Lancut. 1.72 Gravediggers lowering the body of a Jew into a mass grave in Lancut. 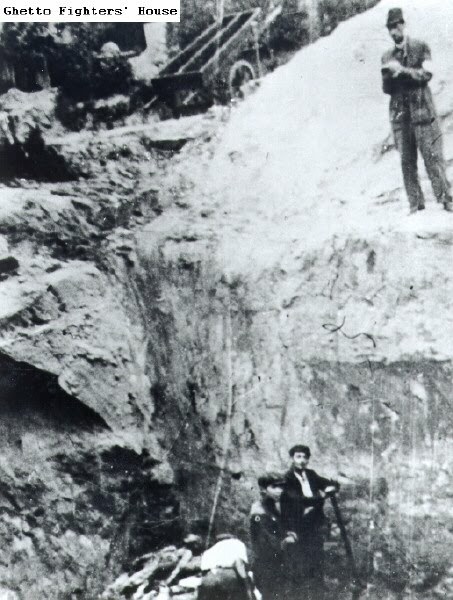 1.73 Jewish activists uncovering the remains of bodies in a mass grave in the area of the Bialystok ghetto. 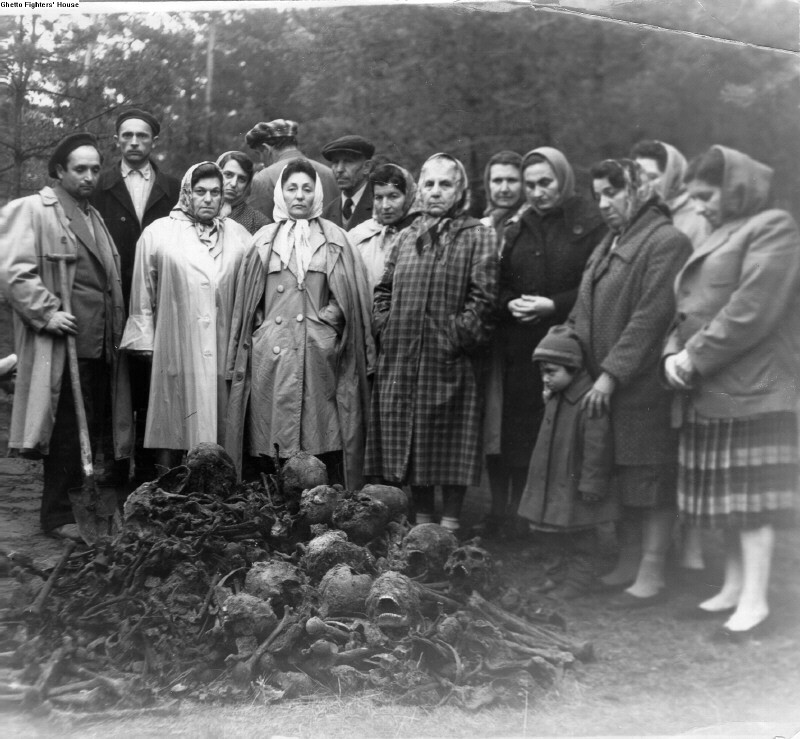 1.74 Members of a kibbutz (communal group) of the Dror youth movement in Bialystok, standing beside a mass grave they had been seeking. 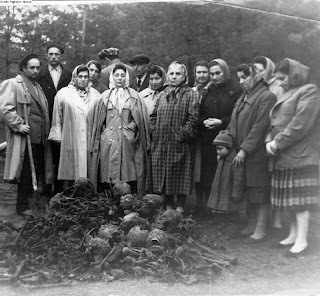 1.75 Members of a kibbutz (communal group) of the Dror youth movement in Bialystok, standing beside a mass grave they had been seeking. 1.76 The excavation of a mass grave containing the remains of 72 fighters from the Bialystok ghetto uprising. 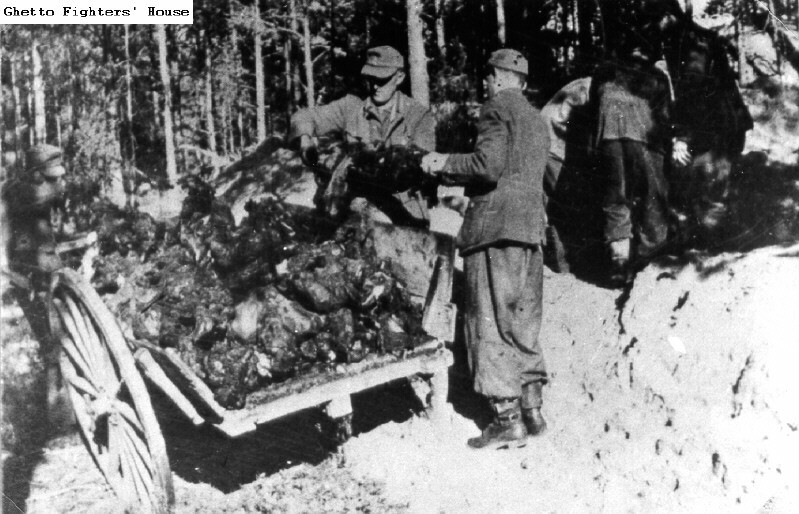 1.77 The exhumation of a mass grave in the city of Bialystok. 1.78 The exhumation of a mass grave in the city of Bialystok. 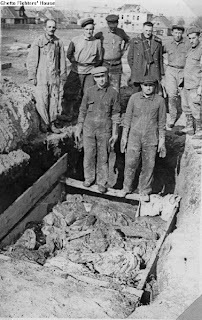 1.79 Jewish gravediggers in a mass grave in the Belzec cemetery. 1.80 Lowering the bodies of Jews into a mass grave, apparently in Poland. 1.81 Lowering the bodies of Jews into a mass grave, apparently in Poland. 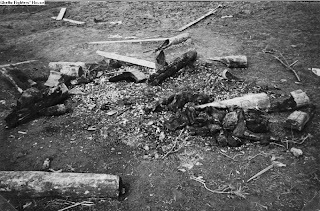 Note, 28.10.2011:: Photo 1.81 is the same as photo 1.49. See my RODOH post 13089. 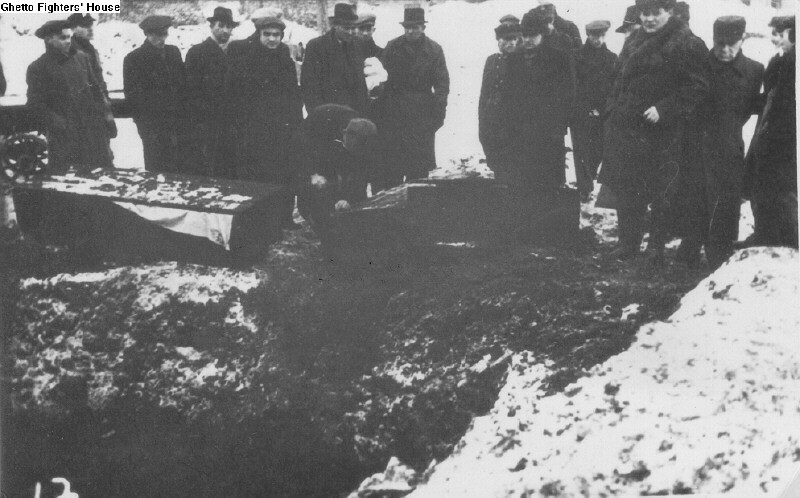 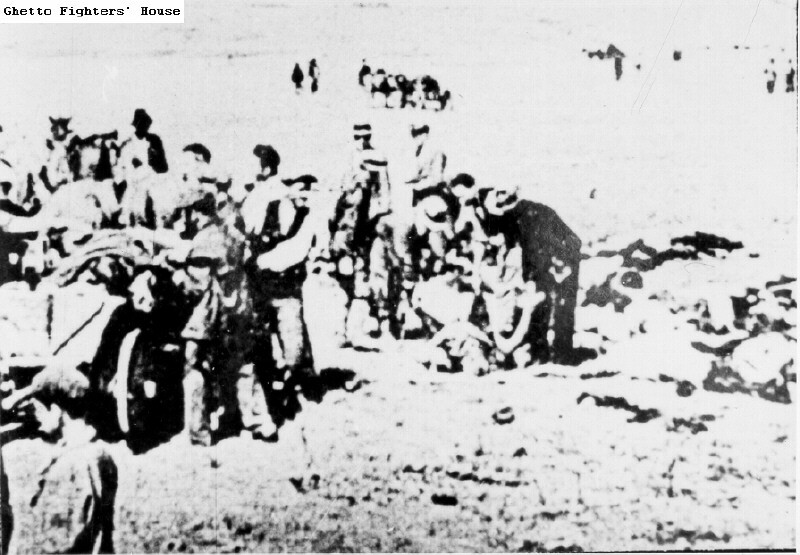 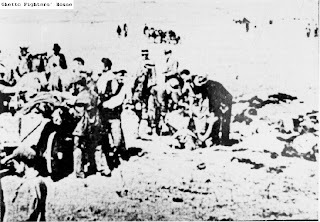 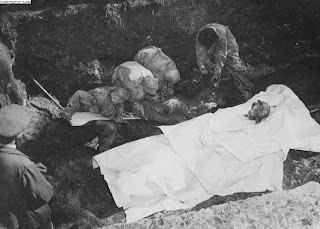 1.82 Public health workers exhuming corpses from a mass grave. 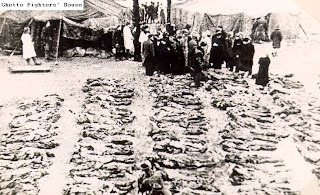 1.83 The bodies of Jews exhumed from a mass grave, to be given proper burial. 1.84 The bodies of Jews exhumed from a mass grave, to be given proper burial. 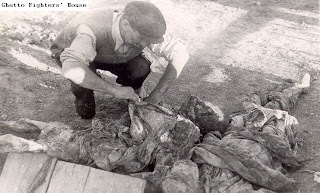 1.85 The bodies of Jews exhumed from a mass grave, to be given proper burial. 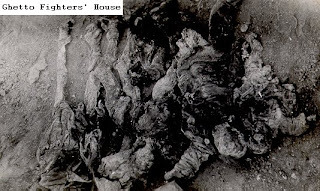 1.86 The bodies of Jews exhumed from a mass grave, to be given proper burial. 1.87 The bodies of Jews exhumed from a mass grave, to be given proper burial. 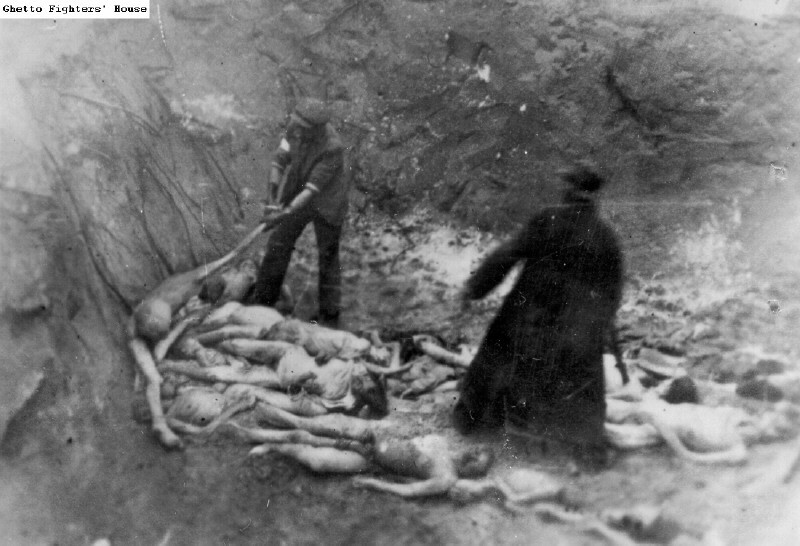 1.88 The bodies of Jews exhumed from a mass grave, to be given proper burial. 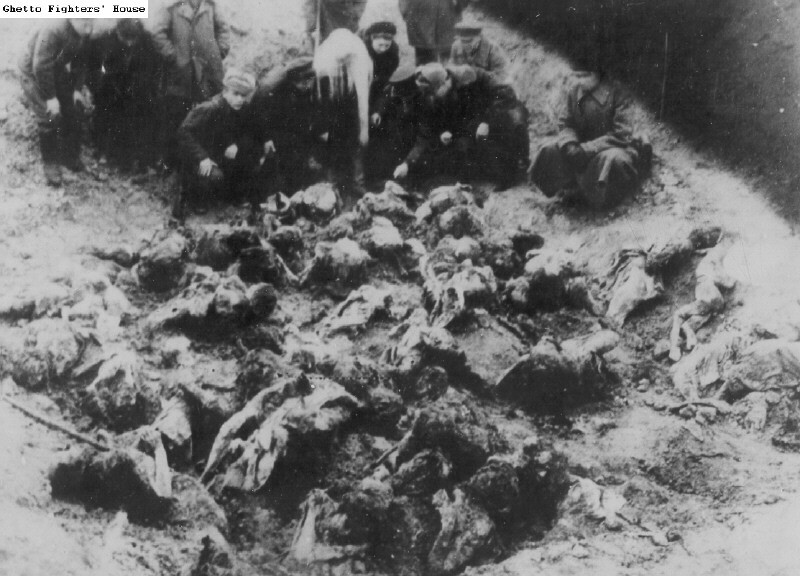 1.89 The bodies of Jews exhumed from a mass grave, to be given proper burial. 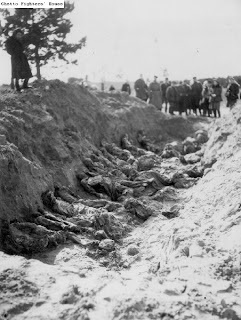 1.90 The bodies of Jews exhumed from a mass grave, to be given proper burial. 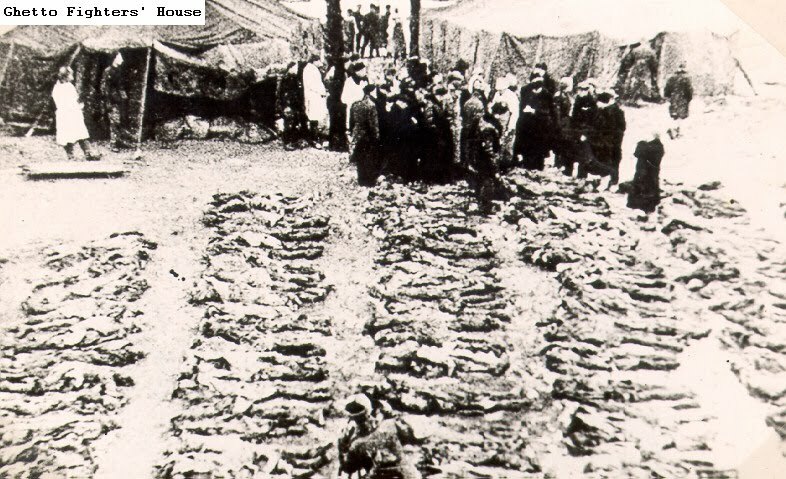 1.91 The bodies of Jews exhumed from a mass grave, to be given proper burial. 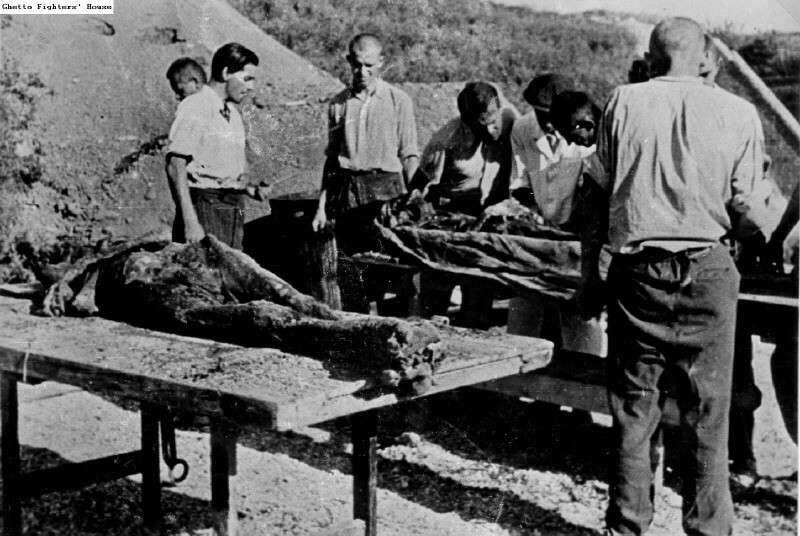 1.92 The bodies of Jews exhumed from a mass grave, to be given proper burial. 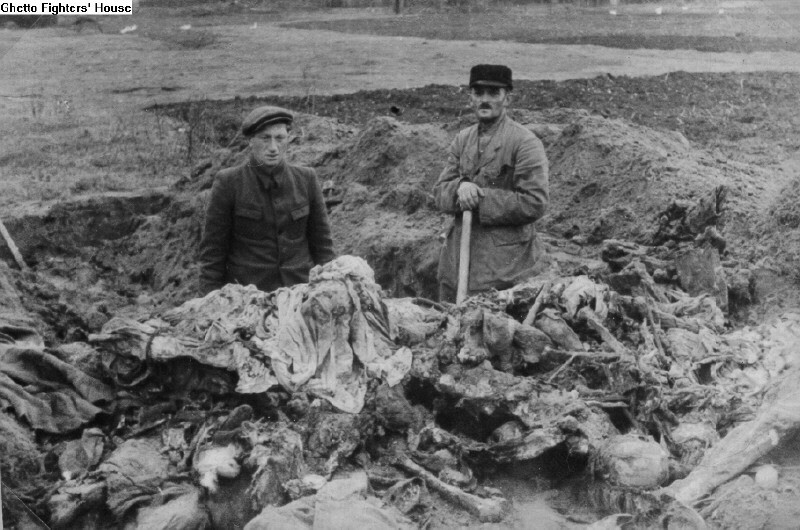 1.93 The bodies of Jews exhumed from a mass grave, to be given proper burial. 1.94 The bodies of Jews from the Zolochev (Zloczow) ghetto, in a mass grave. 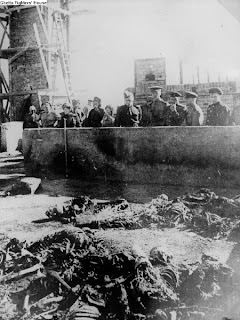 1.95 The bodies of Jews from the Zolochev (Zloczow) ghetto, exhumed from a mass grave after the liberation. 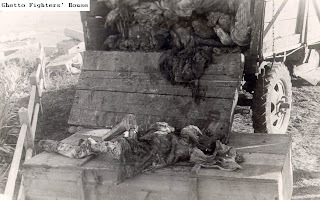 1.96 The bodies of Jews from the Zolochev (Zloczow) ghetto, exhumed from a mass grave after the liberation. 1.97 The bodies of Jews in an unidentified ghetto, exhumed from a mass grave. 1.98 The bodies of Jews in an unidentified ghetto, exhumed from a mass grave. 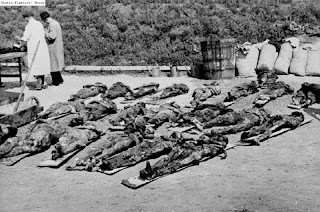 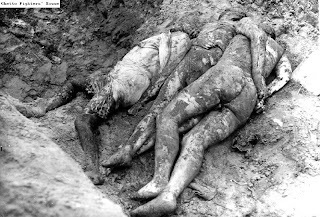 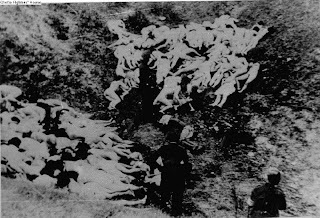 1.99 The bodies of victims in a mass grave. 1.100 The bodies of victims of the Nazis in Zbaraz, exhumed from mass graves after the liberation. 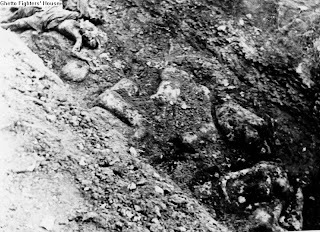 1.101 The remains of victims of the Nazis in Zbaraz, uncovered when mass graves were excavated after the liberation. 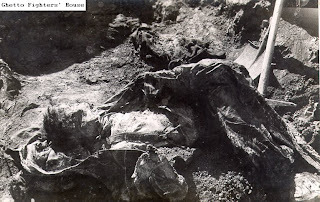 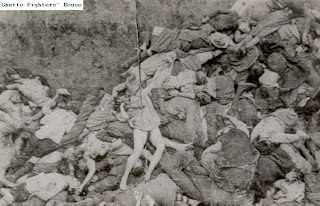 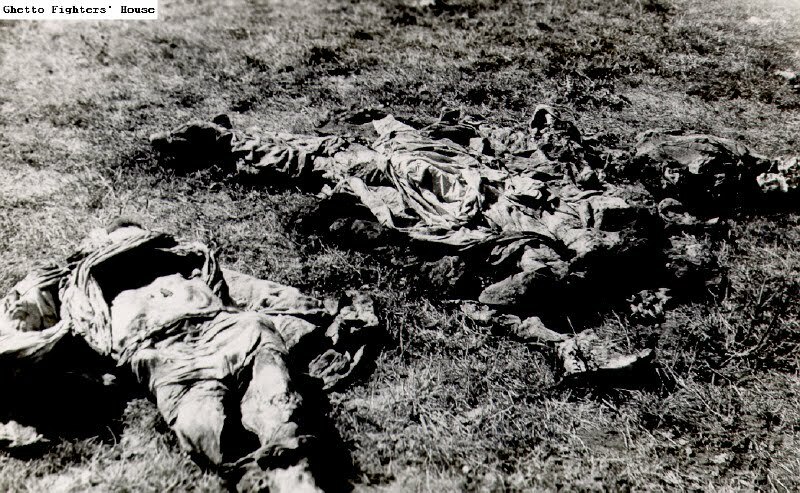 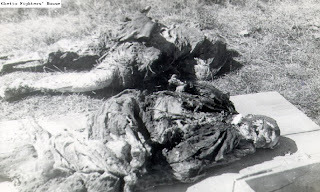 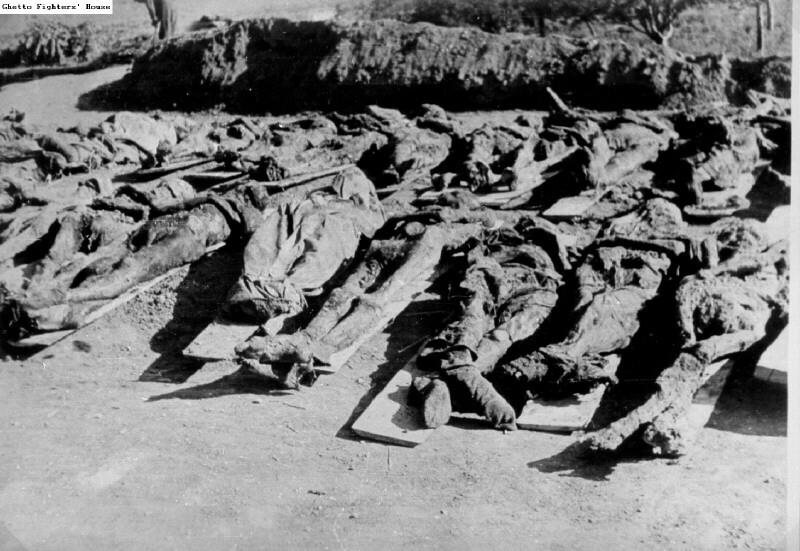 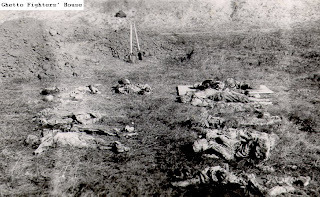 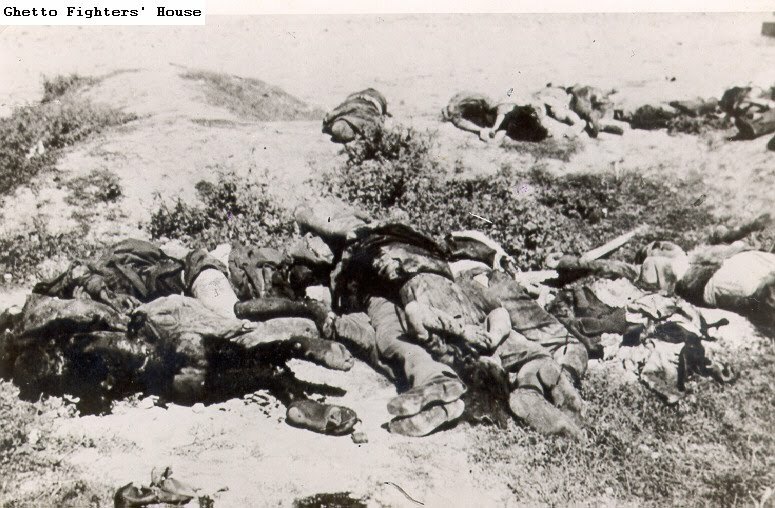 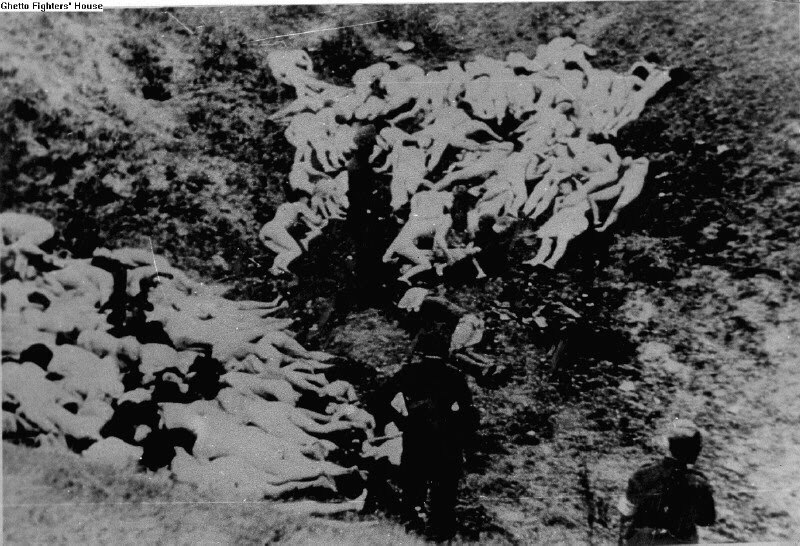 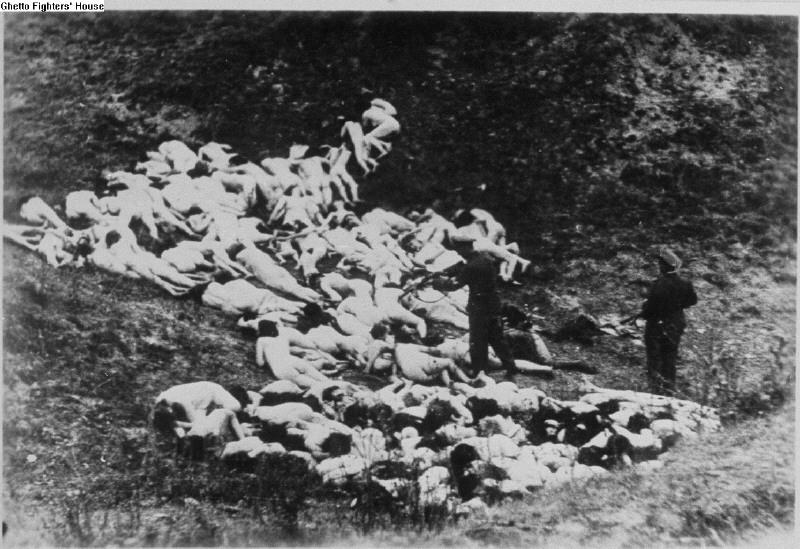 1.102 The bodies of women killed by the German army, in a mass grave in Kerch. 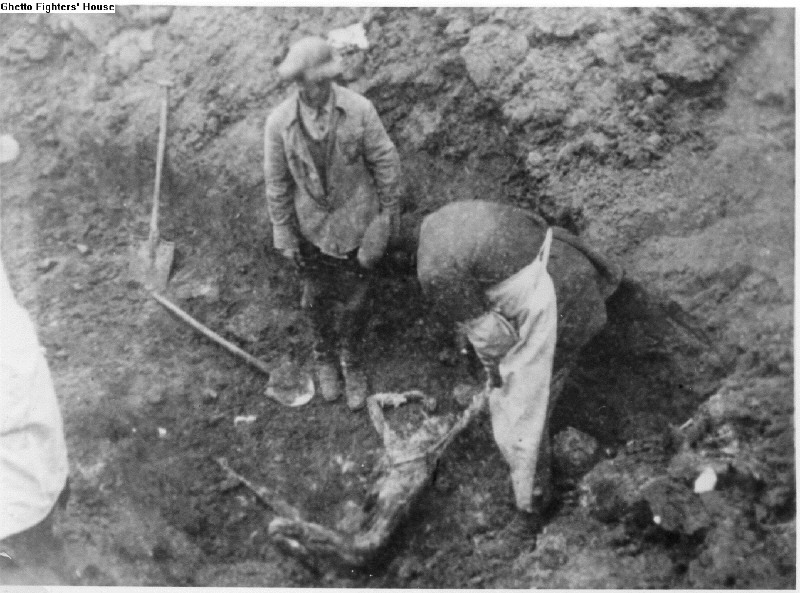 1.103 The body of a Jew exhumed from a mass grave in order to be given a proper burial. 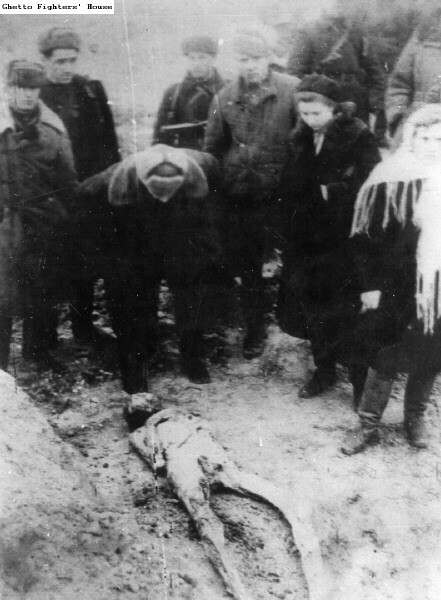 1.104 The body of a Jew exhumed from a mass grave in order to be given a proper burial. 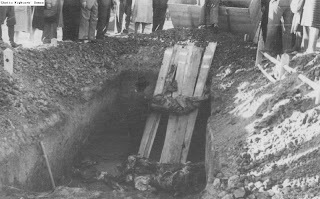 1.105 The body of a Jew exhumed from a mass grave in order to be given a proper burial. 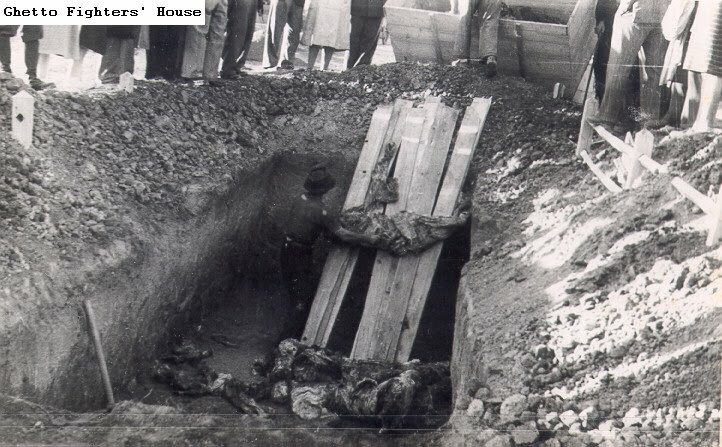 1.106 The body of a Jew exhumed from a mass grave in order to be given a proper burial. 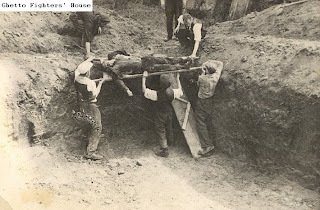 1.107 The body of a Jew exhumed from a mass grave in order to be given a proper burial. 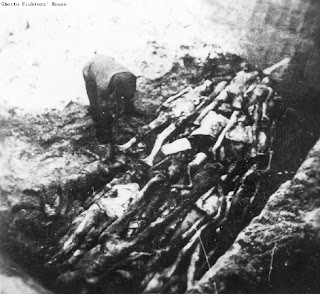 1.108 The bones of Jews exhumed from a mass grave at Utena (Utian), Lithuania. 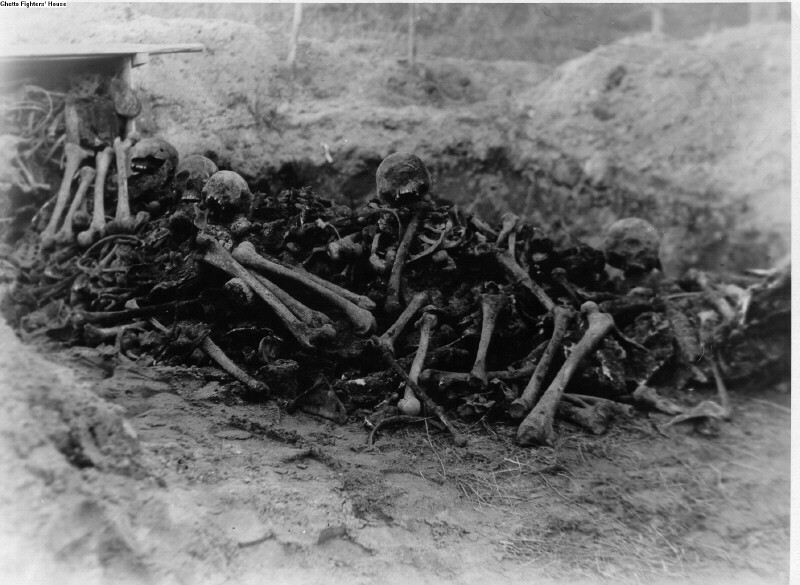 1.109 Women and men beside the bones of Jewish victims exhumed from a mass grave at Utena (Utian), Lithuania. 1.110 The bones of Jews, exhumed from a mass grave in the town of Meina. 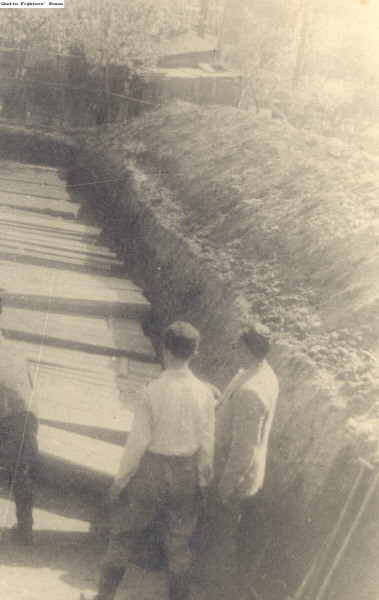 1.111 The coffins of thirty - five Jews in a mass grave in Nowe Miasto. 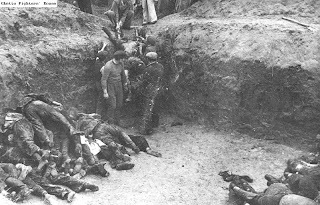 1.112 The execution of civilians at the edge of a mass grave in the USSR. 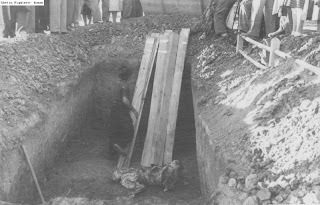 1.113 The exhumation of the remains of Jews from a mass grave in Mlawa, for proper burial in coffins. 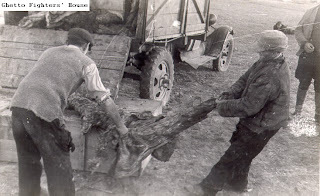 1.114 The exhumation of the remains of Jews from a mass grave in Mlawa, for proper burial in coffins. 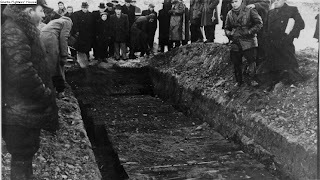 1.115 The exhumation of the remains of Jews from a mass grave in Mlawa, for proper burial in coffins. 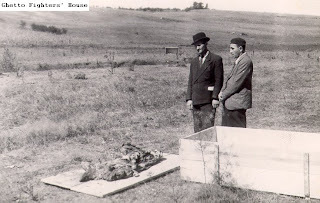 1.116 The exhumation of the remains of Jews from a mass grave in Mlawa, for proper burial in coffins. 1.117 The reburial of Jewish bodies that had been exhumed from mass graves in Czestochowa. 1.118 The reburial of the remains of Czestochowa Jews whose bodies had been disinterred from mass graves. 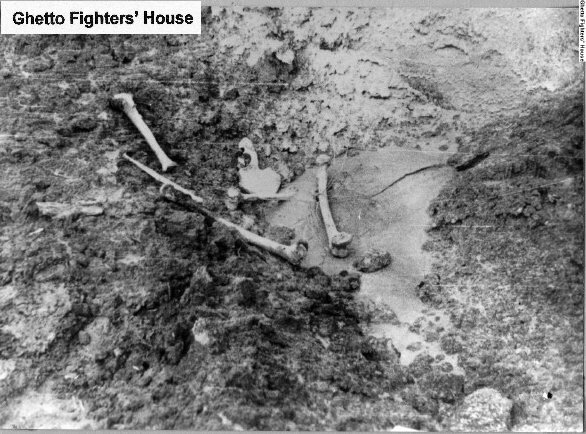 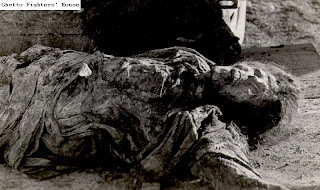 1.119 The remains of a body that had been exhumed from a mass grave. 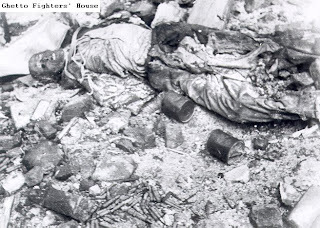 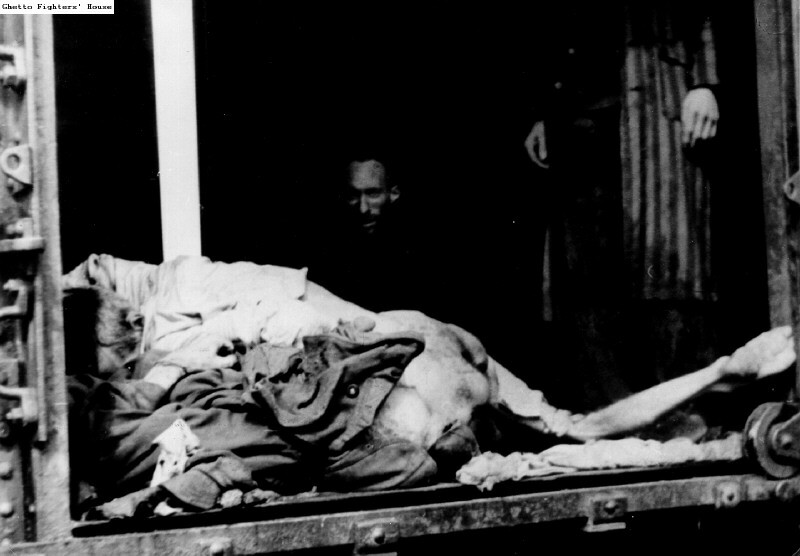 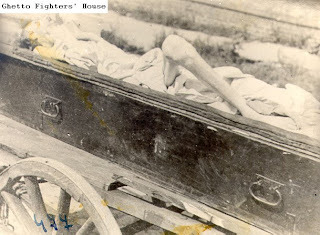 2.1 A body in the doorway of a wagon used for transporting the dead in the Warsaw ghetto. 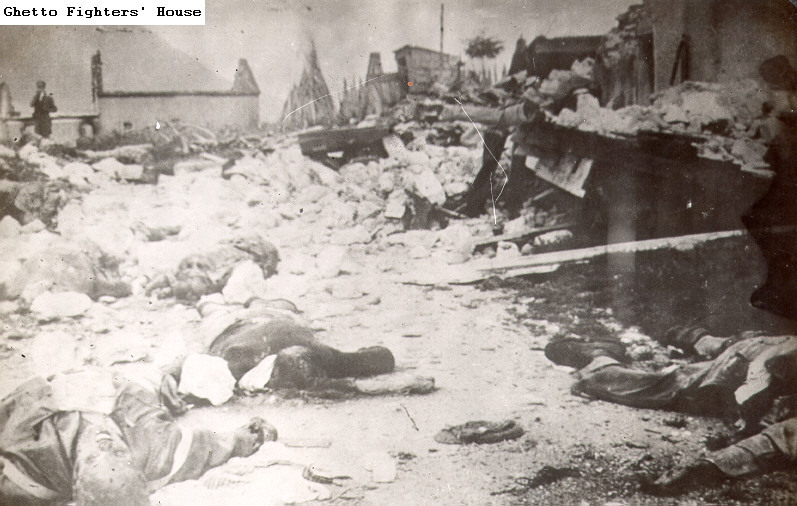 2.2 A body lying amid the ruins of Nalewki Street in Warsaw. 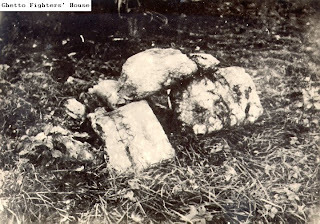 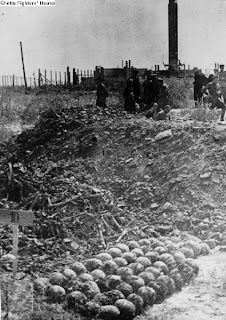 2.3 A body lying among ruins in Warsaw. 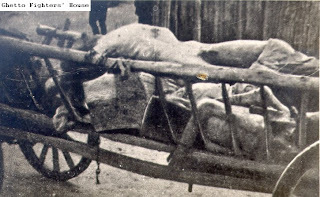 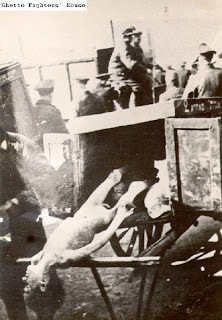 2.4 A body on an open cart for transporting the dead in the Warsaw ghetto. 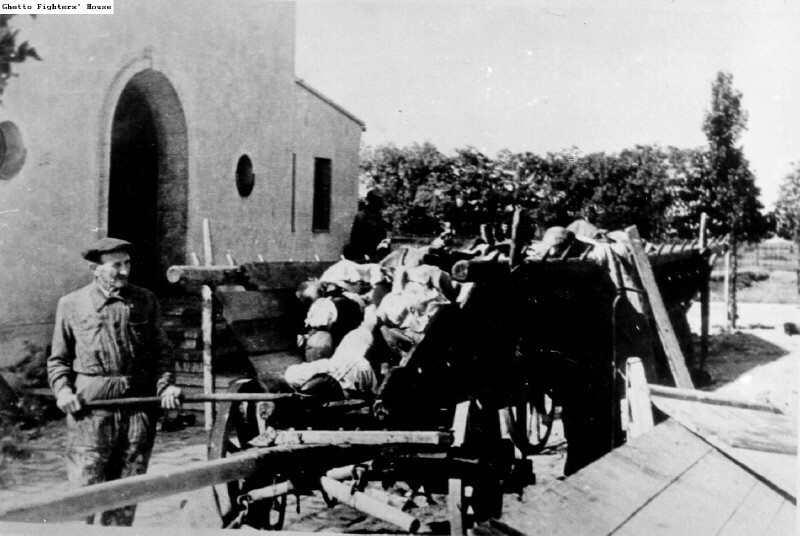 2.5 A Jew loading the bodies of victims of starvation and epidemics onto a cart, in the Warsaw ghetto. 2.6 A Jew lying on a sidewalk next to a wall in the Warsaw ghetto. 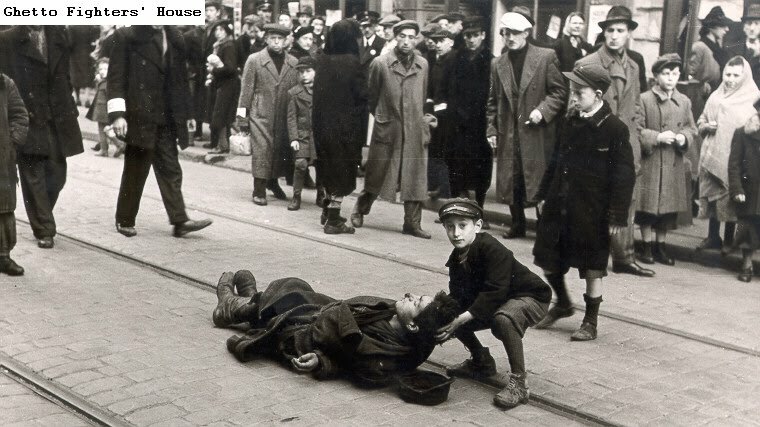 2.7 A Jew taking away the bodies of dead babies in the Warsaw ghetto. 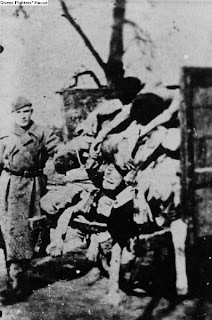 2.8 A Jew wearing an armband, taking away the body of a woman in the Warsaw ghetto. 2.9 A Judenrat mortuary department worker in the Warsaw ghetto, moving bodies from a wagon to coffins. 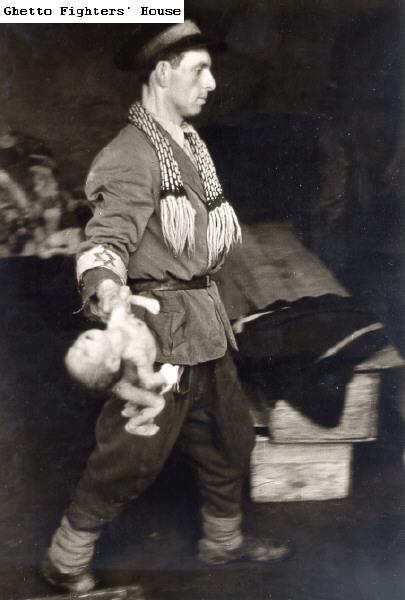 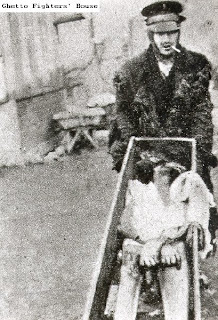 2.10 A Judenrat mortuary department worker taking away the body of an infant in the Warsaw ghetto. 2.11 A line of bodies of the victims of starvation and diseases, laid out in a Warsaw ghetto street. 2.12 A line of covered bodies in the Warsaw ghetto. 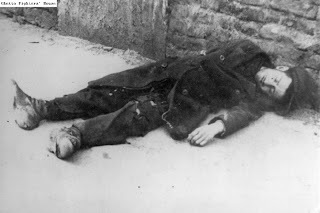 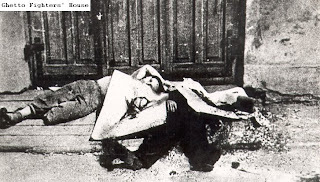 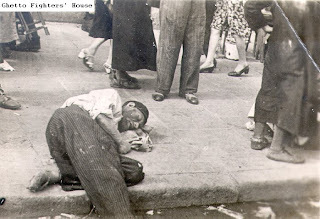 2.13 A man's body lying in a Warsaw ghetto street. 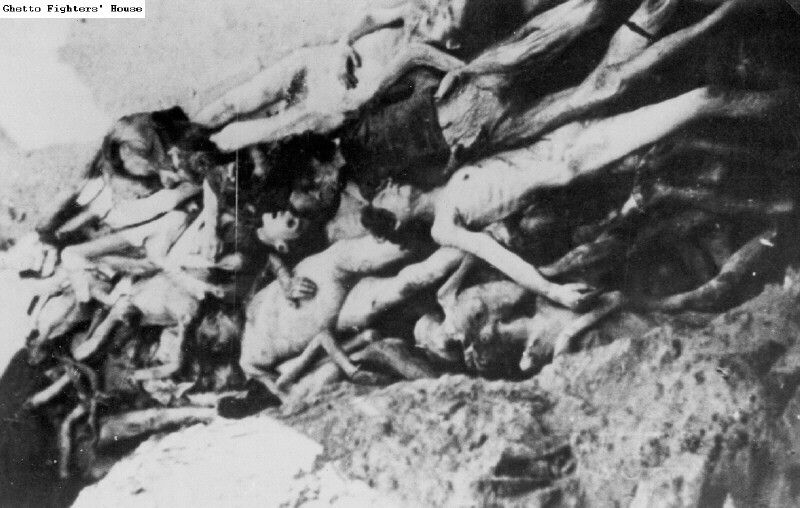 2.14 A pile of bodies in the Warsaw ghetto. 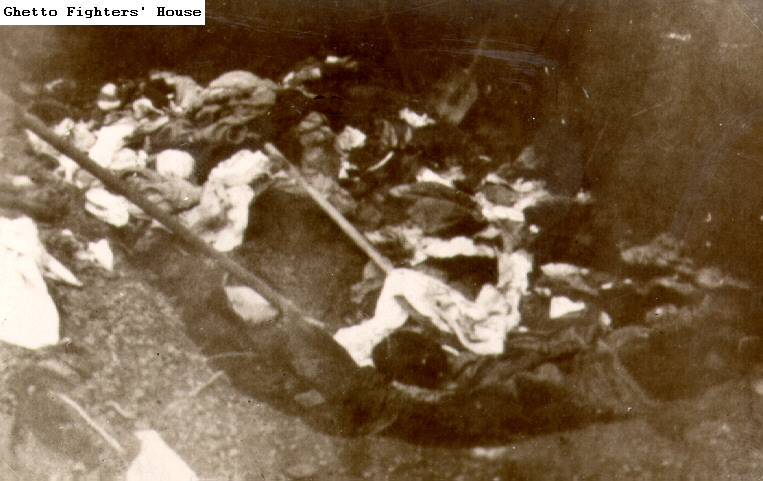 2.15 A pile of bodies on a pallet in the Warsaw ghetto. 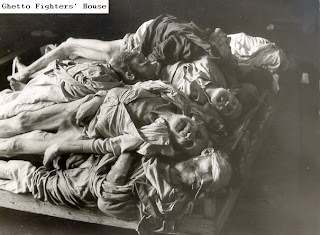 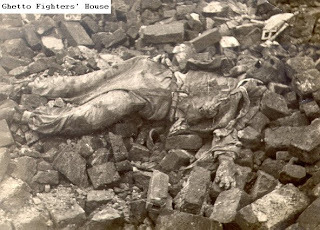 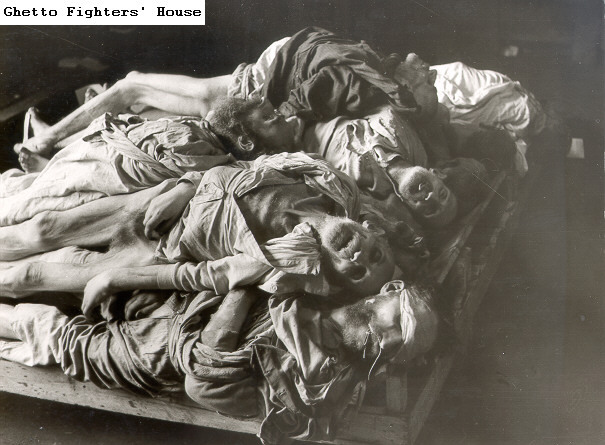 2.16 A pile of bodies on a pallet in the Warsaw ghetto. 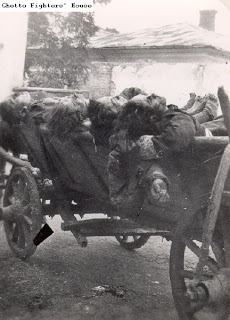 2.17 A two - wheeled cart loaded with the bodies of victims of starvation and diseases in the Warsaw ghetto. 2.18 A wagon loaded with bodies, during the Great Aktion (mass deportations) of the summer of 1942 in the Warsaw ghetto. 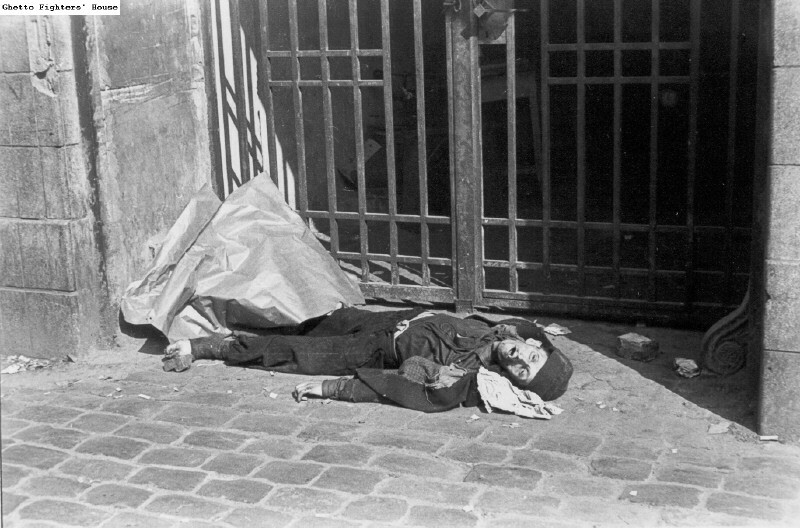 2.19 A woman's body on a sidewalk in the Warsaw ghetto. 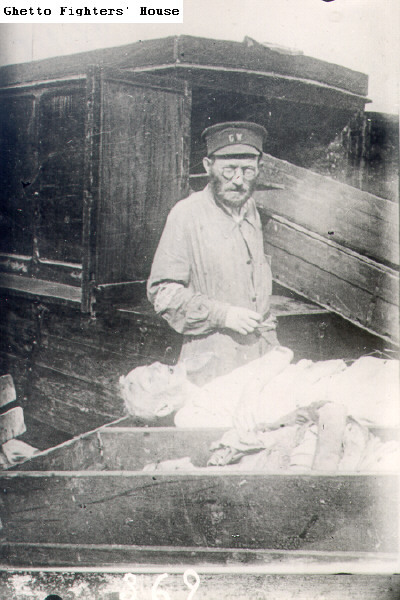 2.20 A worker of the Warsaw ghetto's mortuary department, holding an open coffin with a body in it. 2.21 A young Polish woman weeping over the body of her sister, killed by machine gun fire from German planes over Warsaw. 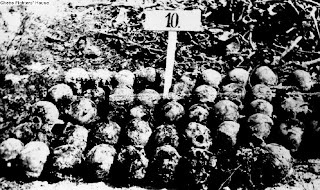 Seven Polish women were collecting potatoes in a field near Warsaw. 2.22 An open cart loaded with the bodies of victims of starvation and diseases in the Warsaw ghetto. 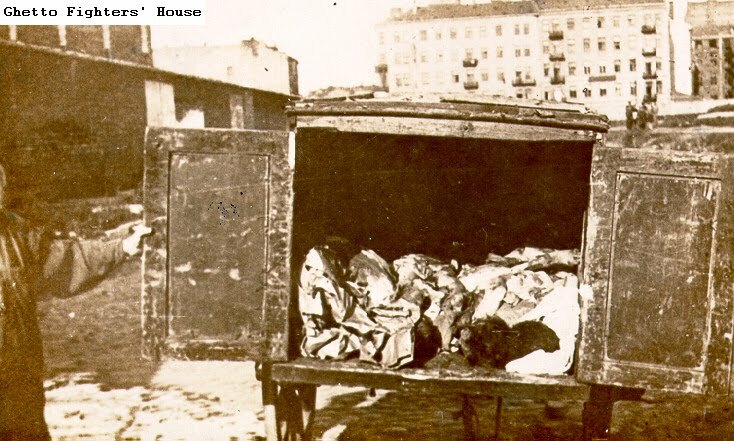 2.23 An open wagon loaded with the bodies of victims of starvation and epidemics, in the Warsaw ghetto. 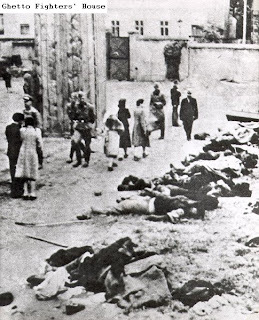 2.24 Bodies lying in front of a building in the Warsaw ghetto. 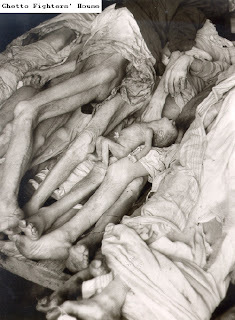 2.25 Bodies of the victims of starvation and diseases in the "bet tohorah" of the Jewish cemetery in the Warsaw ghetto. 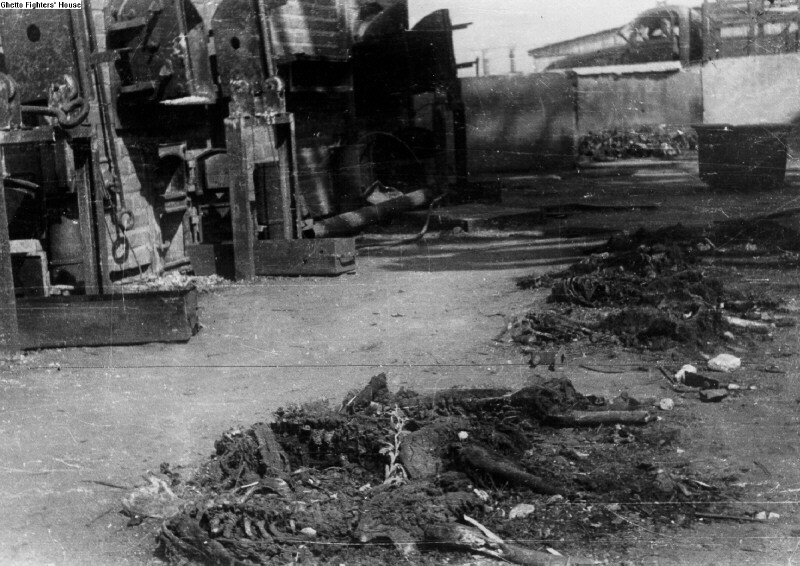 2.26 Bodies of the victims of starvation and diseases in the "bet tohorah" of the Warsaw ghetto cemetery. 2.27 Carting away bodies in the Warsaw ghetto. 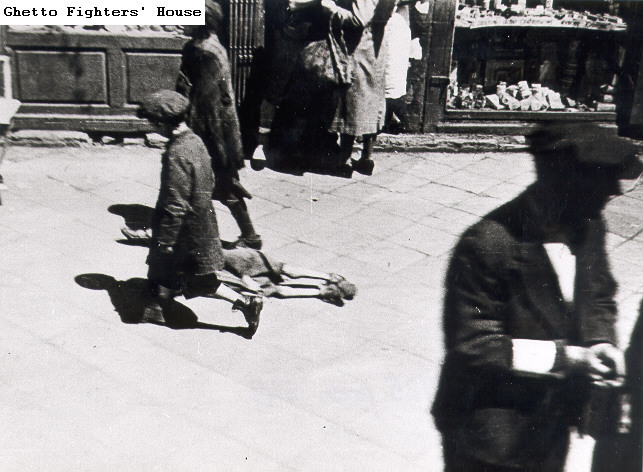 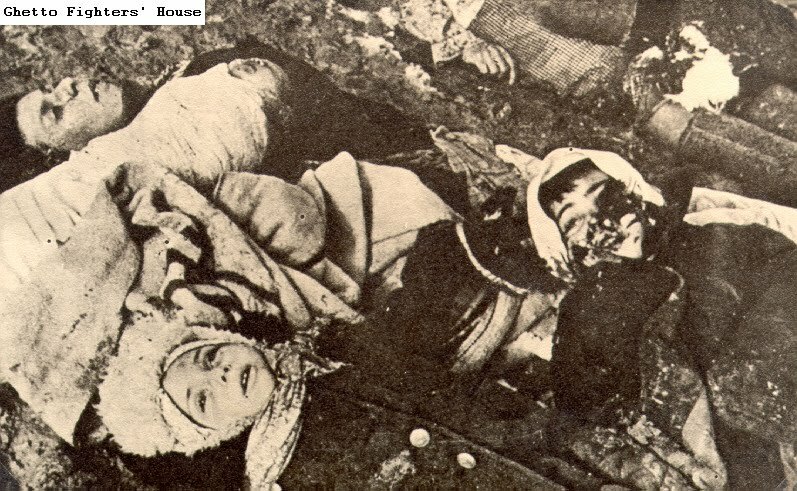 2.28 Children beside the body of a man lying in the street in the Warsaw ghetto. 2.29 Children walking by the body of another child lying on a sidewalk in the Warsaw ghetto. 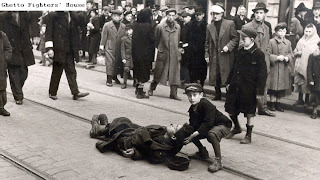 2.30 From the photographs of Willi Georg: A body lying in a street in the Warsaw ghetto. 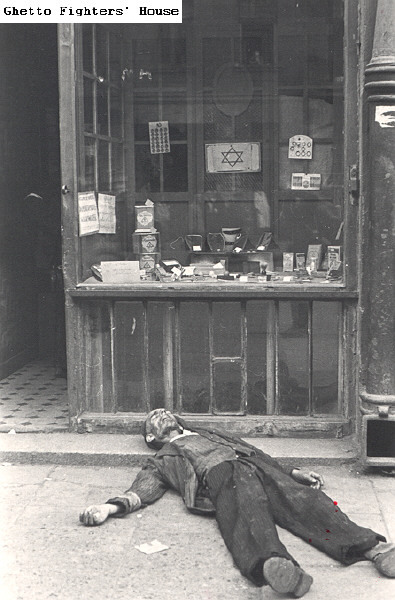 2.31 From the photographs of Willi Georg: The body of a man lying in front of a shop in the Warsaw ghetto. 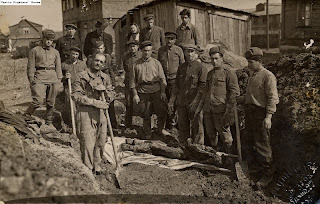 2.32 Gravediggers in the Warsaw ghetto. 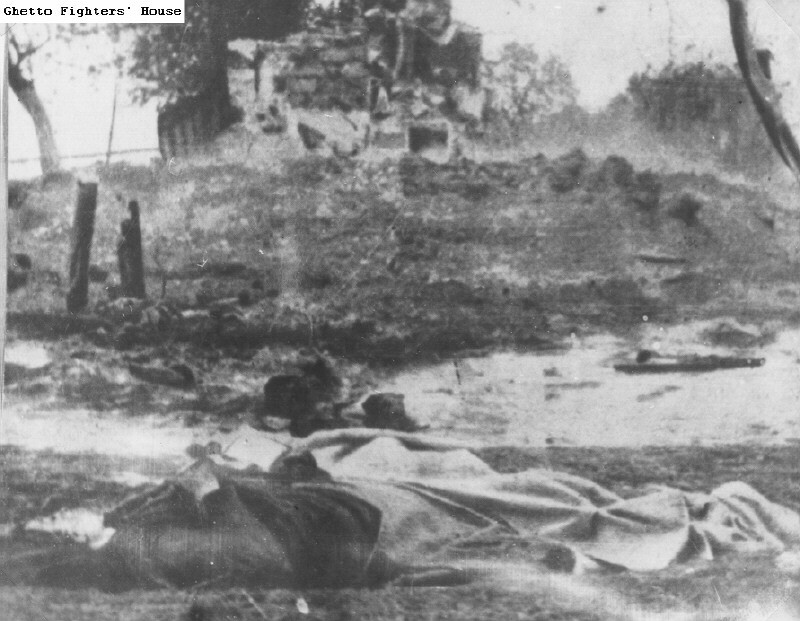 2.33 A body lying beside the ruins of a house in the Polish village of Szarajowka, near Przemysl, after a German retaliatory strike. 2.34 A body lying on the ground in the Lodz ghetto. 2.35 Jews killed during the "Gehsperre" Aktion of September 1942, in the cemetery of the Lodz ghetto. 2.36 Jews killed during the "Gehsperre" Aktion of September 1942, in the cemetery of the Lodz ghetto. 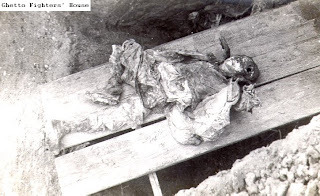 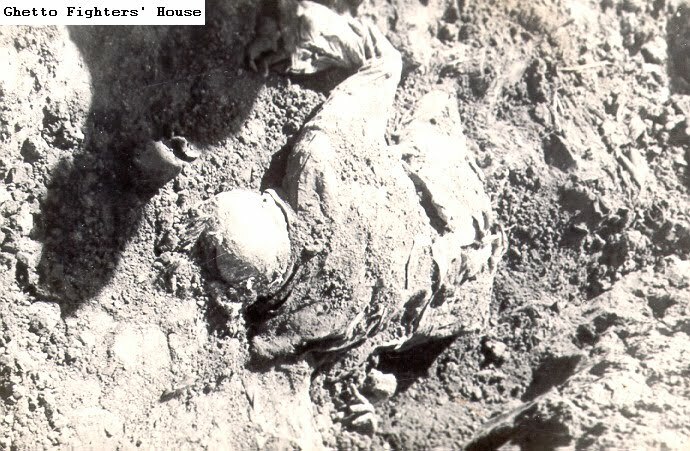 2.37 A body that was exhumed, apparently at an execution site. 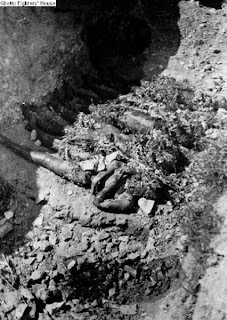 2.38 A body that was exhumed, apparently at an execution site. 2.39 A body that was exhumed, apparently at an execution site. 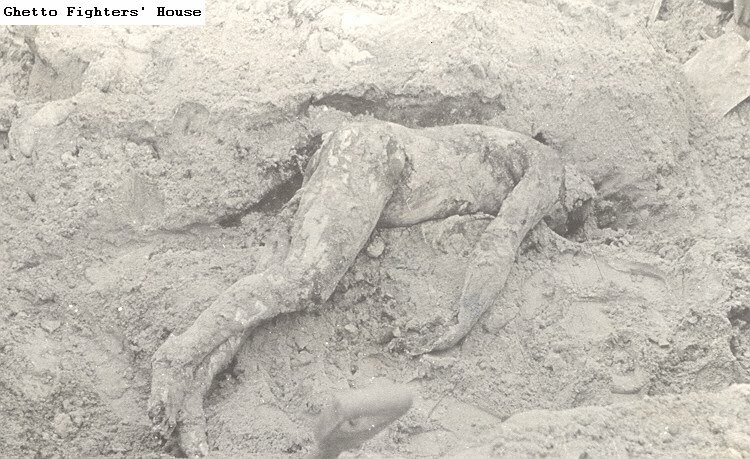 2.40 A body that was exhumed, apparently at an execution site. 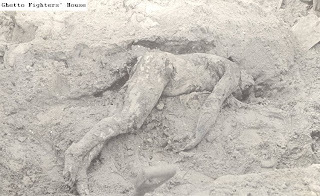 2.41 A body that was exhumed, apparently at an execution site. 2.42 A body that was exhumed, apparently at an execution site. 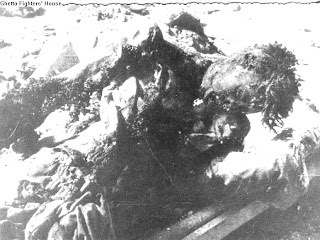 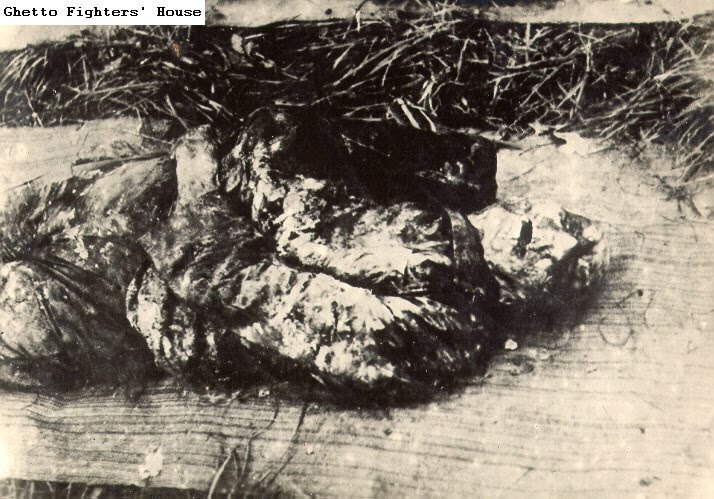 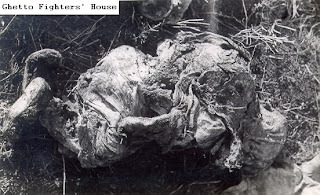 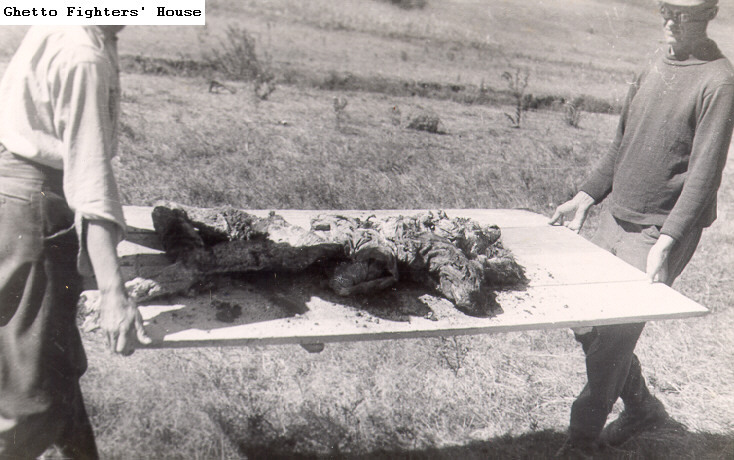 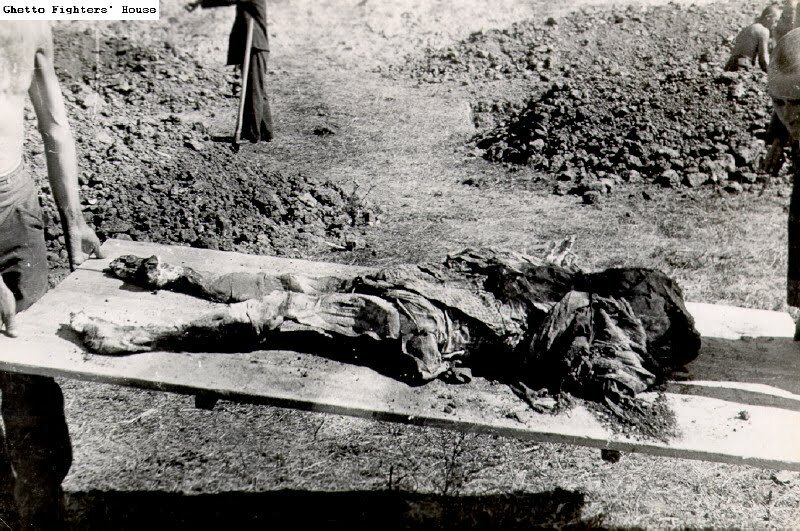 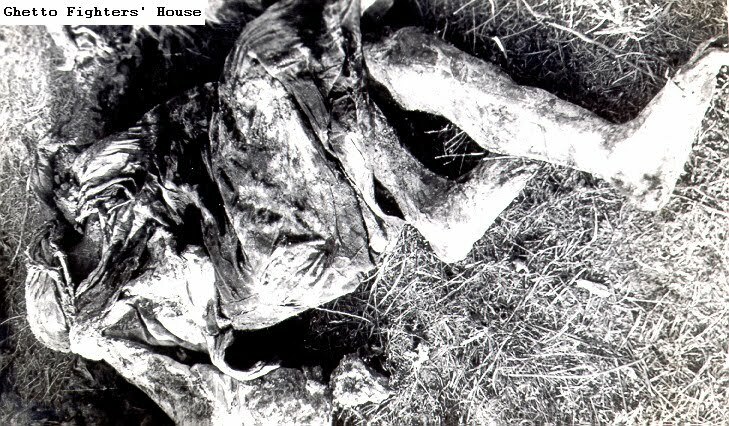 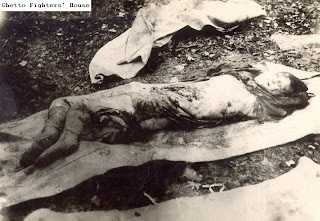 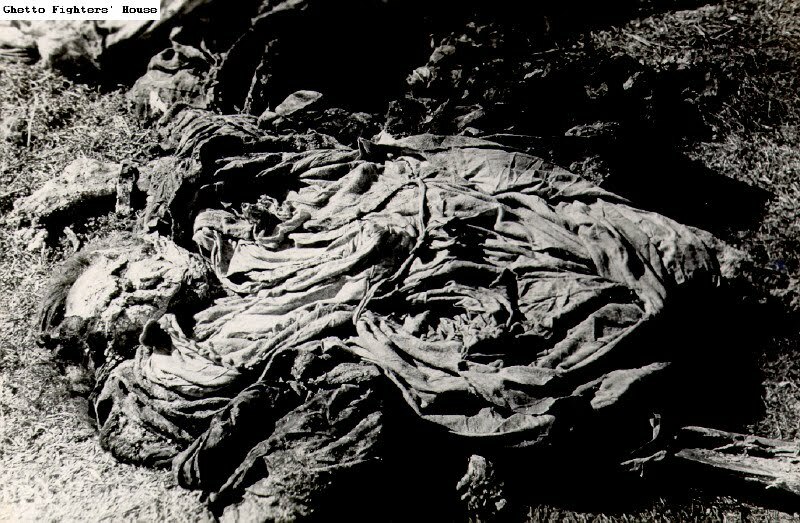 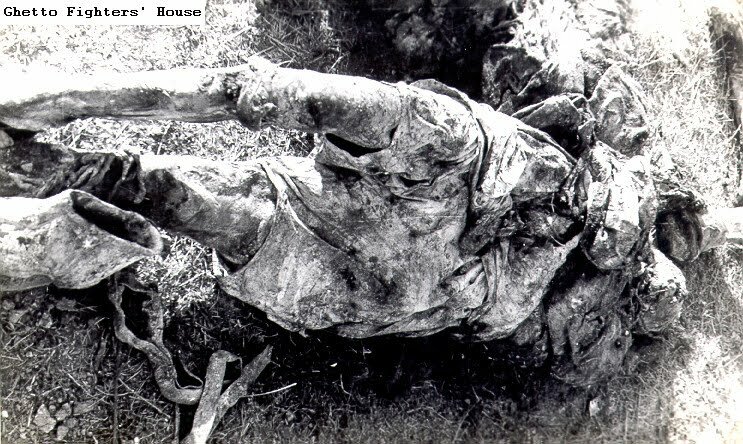 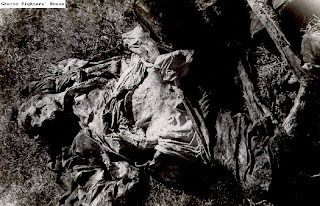 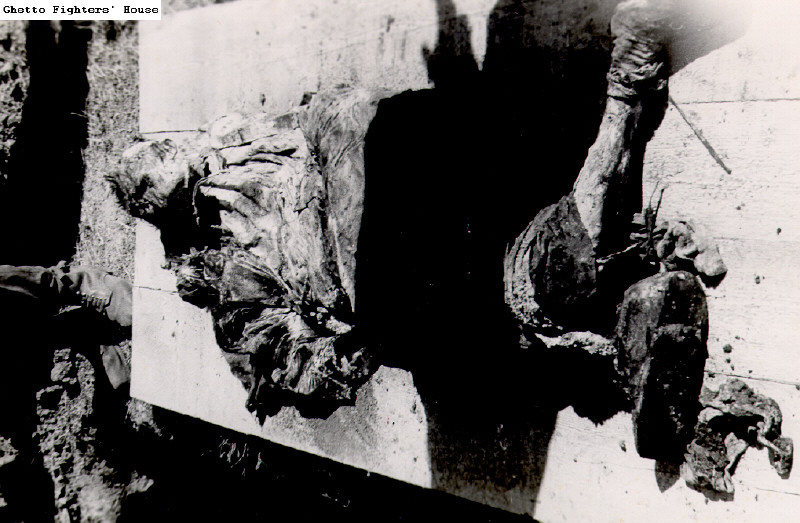 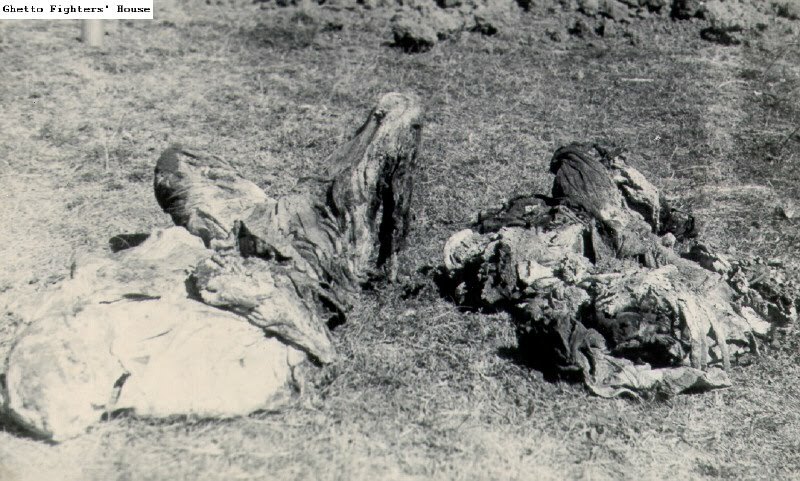 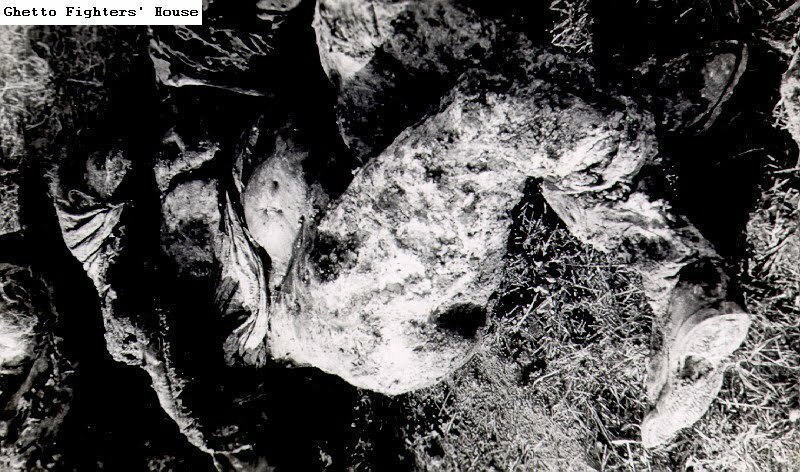 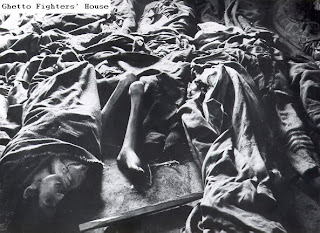 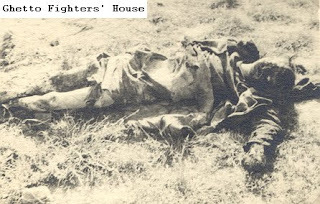 2.43 A corpse in the Jasenovac camp, torn to pieces. 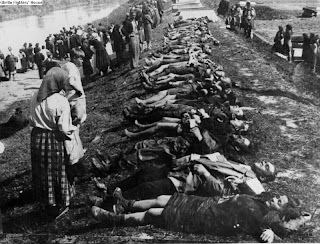 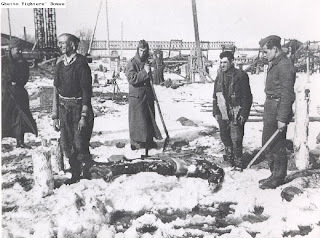 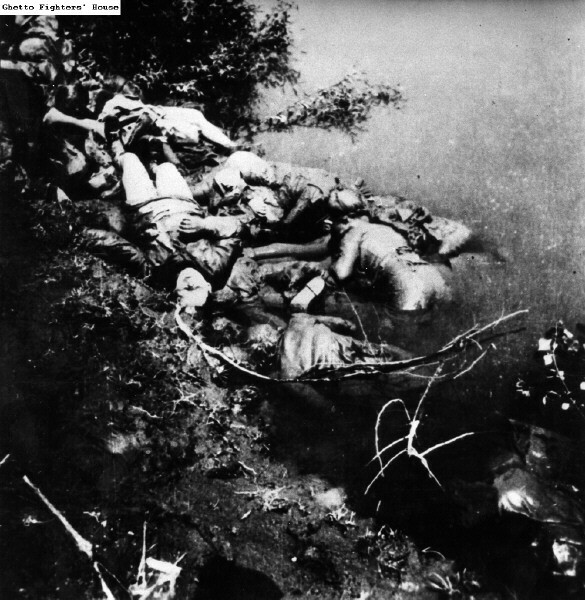 2.44 Bodies of Jasenovac camp inmates on the banks of the Sava River. 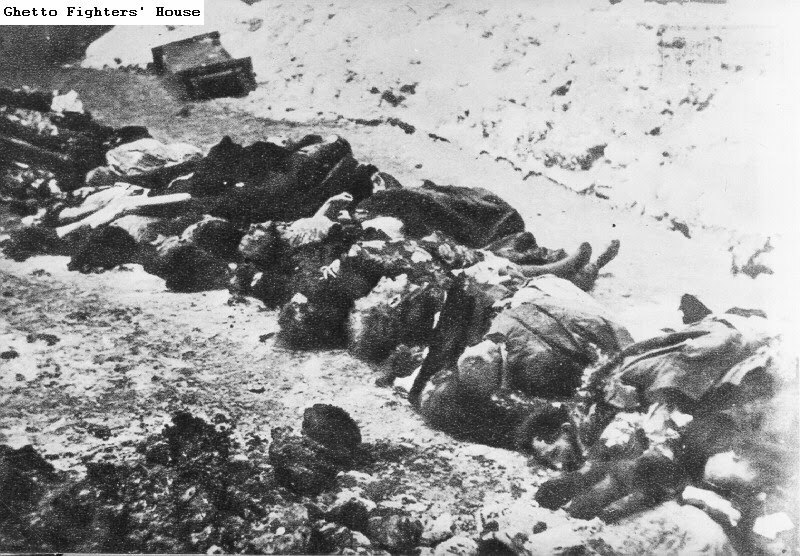 2.45 A family in the USSR killed by the Germans. 2.46 A family in the USSR killed by the Germans. 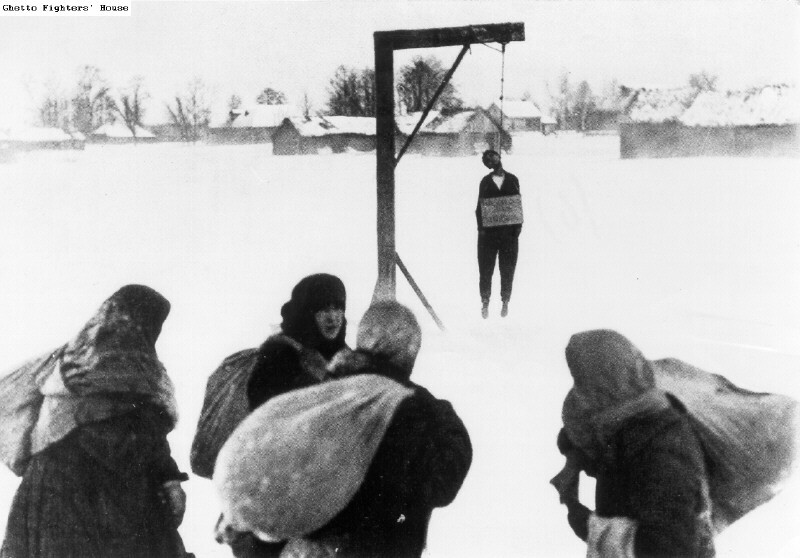 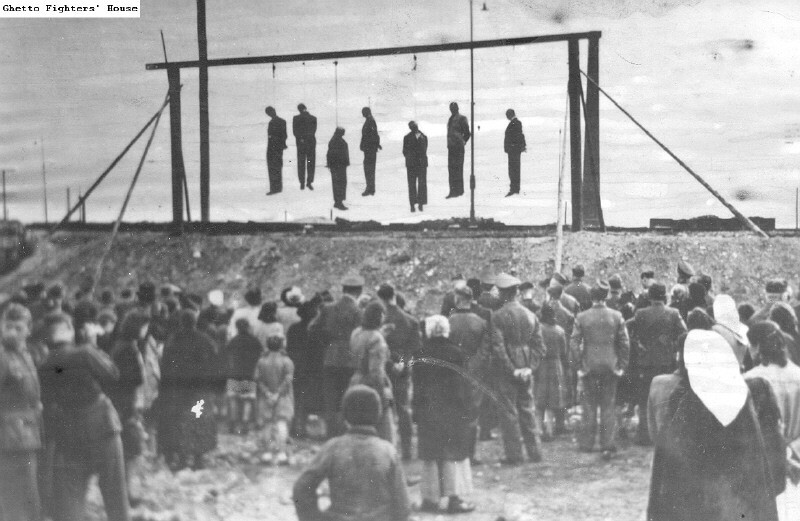 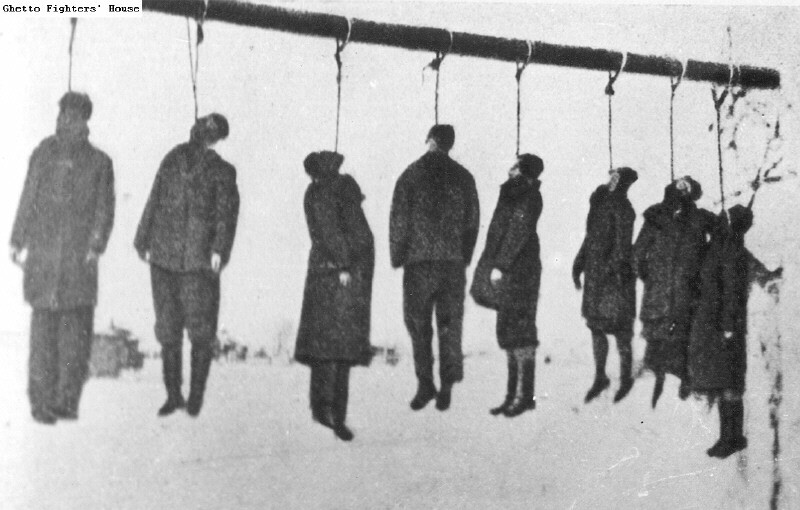 2.47 A gallows in a village in the USSR, on which a man has been hanged by the Germans in the winter. 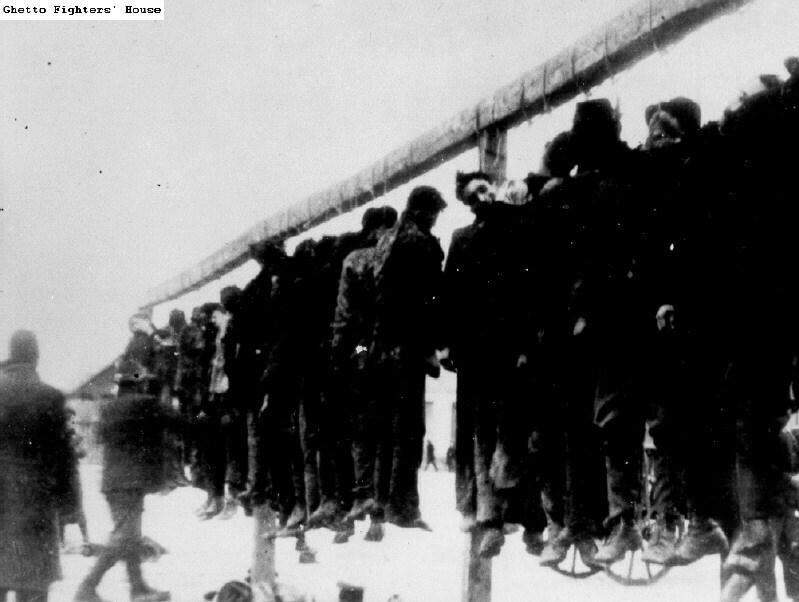 2.48 A gallows on which seven partisans have been hanged. 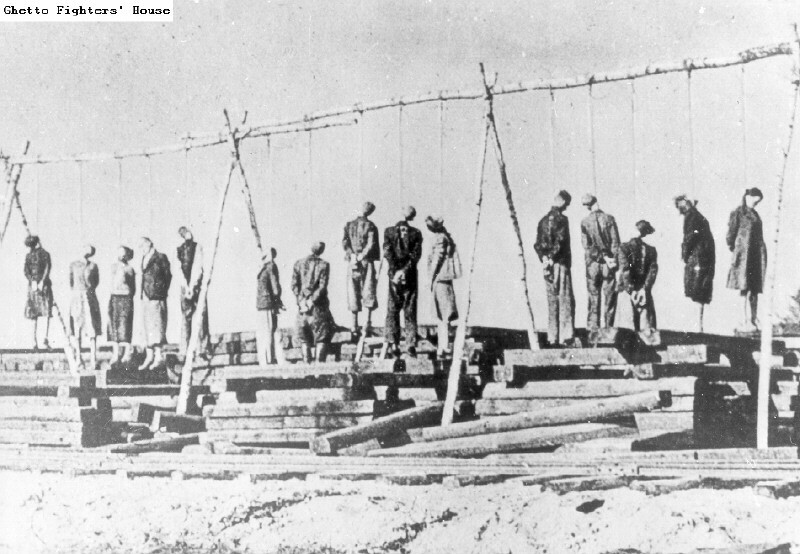 2.49 A gallows on which six men were hanged. 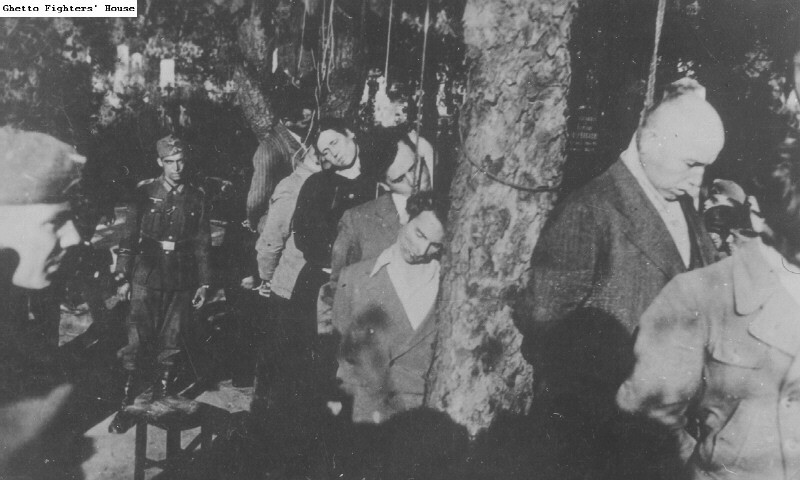 2.50 A gallows on which three men have been hanged. 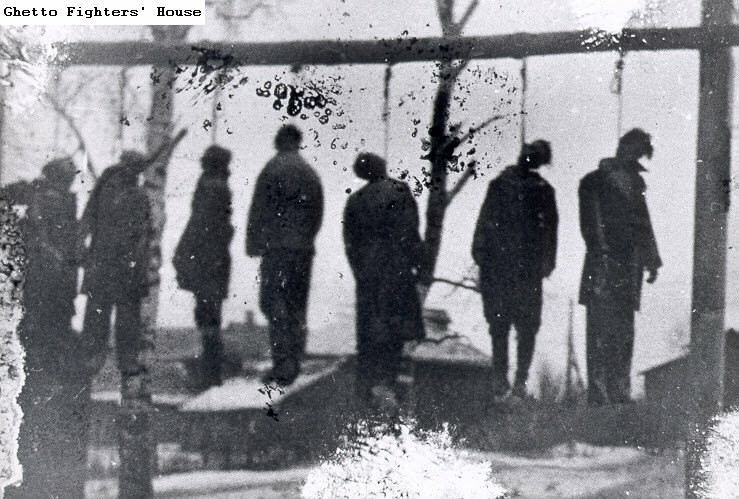 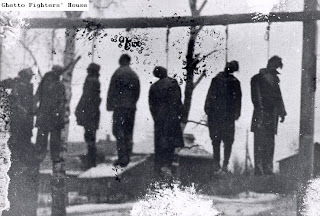 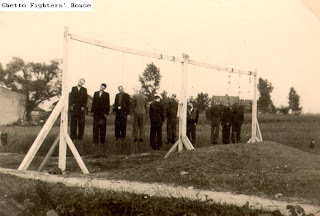 2.51 A gallows with men's bodies hanging on them. 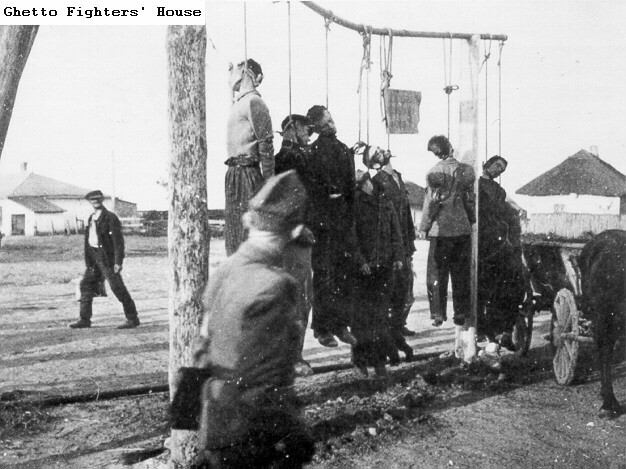 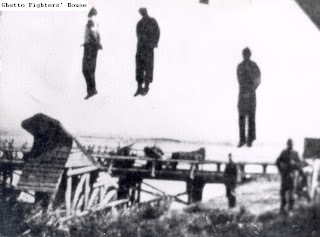 2.52 A gallows with men's bodies hanging on them. 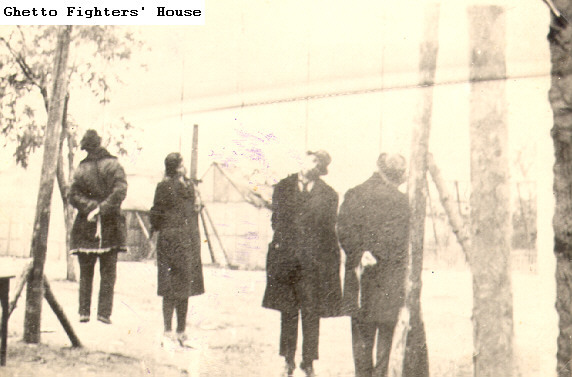 2.53 A gallows with multiple nooses. Some of the people have already been hanged and others are standing with nooses around their necks. 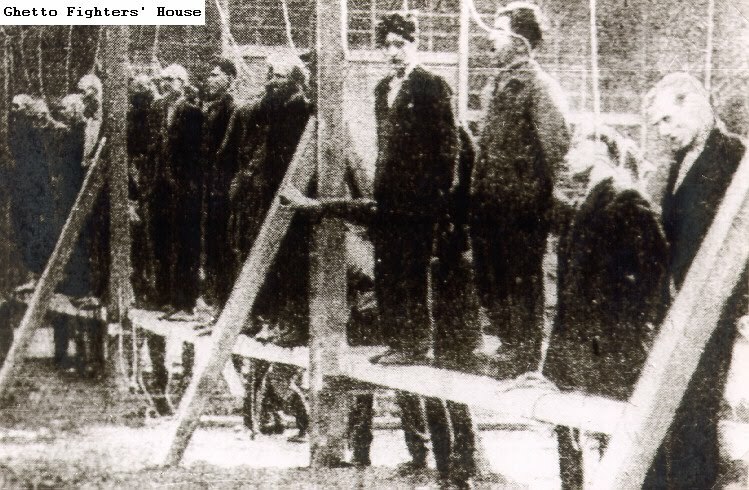 2.54 A gallows with the bodies of Jewish men hanging on them. 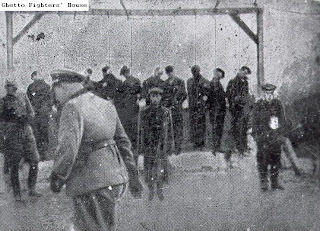 2.55 A gallows with the bodies of Polish civilians. 2.56 A gallows with the bodies of Polish civilians. 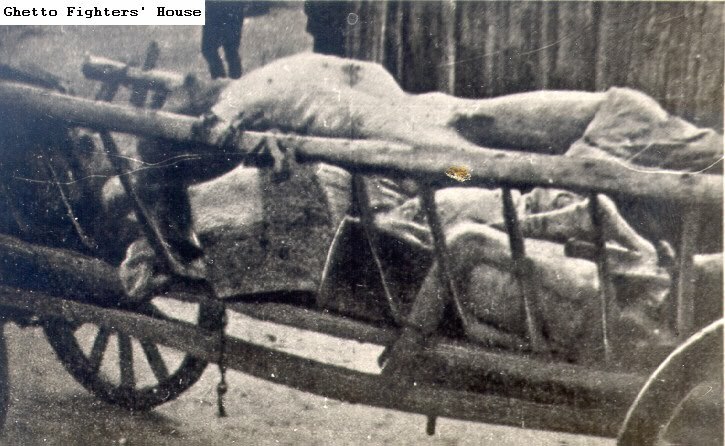 2.57 A gallows with the bodies of Polish civilians. 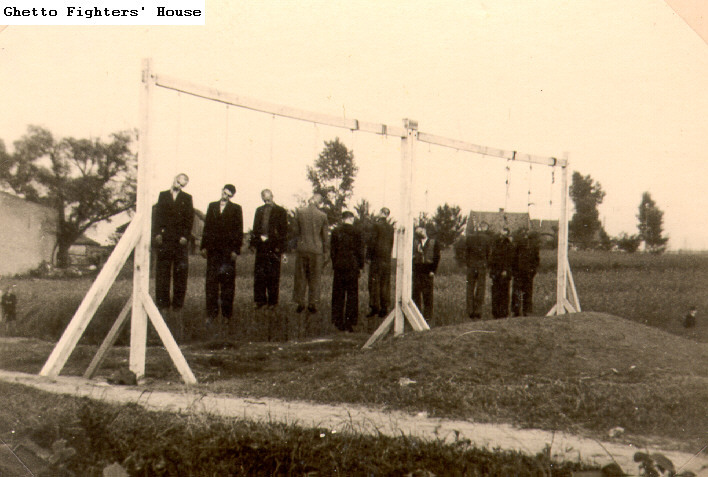 2.58 A gallows with the bodies of ten Polish civilians. 2.59 A German soldier beside a gallows upon which seven men have been hanged. 2.60 A German soldier beside the bodies of Yugoslav civilians hanged on an improvised gallows between two trees in a forest. 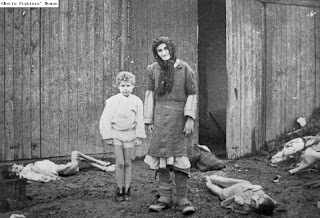 2.61 A German soldier beside the body of a Jewish woman he shot. 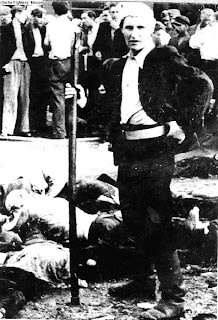 2.62 A German soldier in the Krakow ghetto, standing beside the bodies of Jews laid out in a row. 2.63 Jews hanged on a gallows in the Podgorze quarter of Krakow. 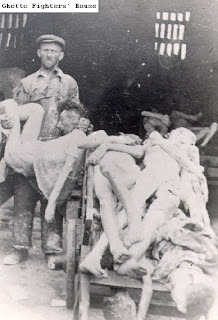 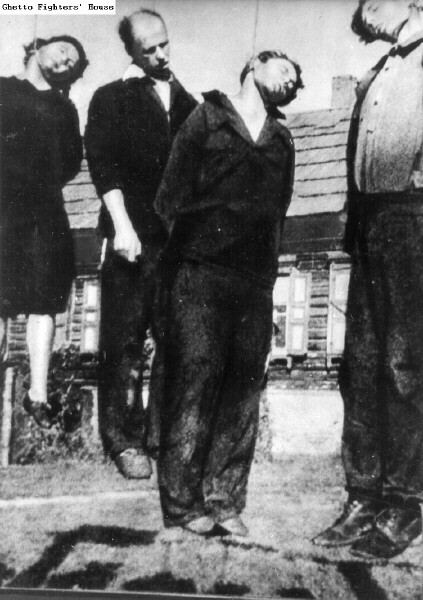 2.64 A German soldier standing beside three bodies. 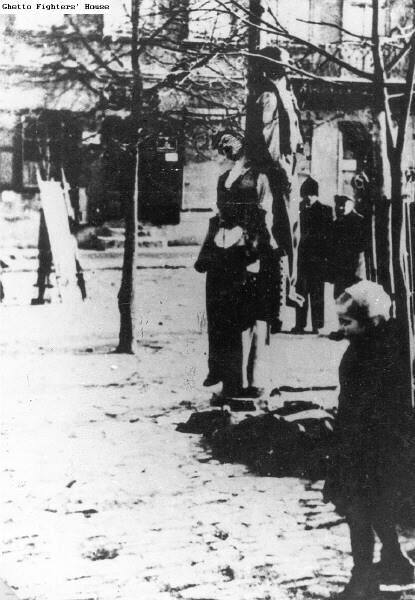 2.65 A German soldier standing next to the hanged bodies of four men beside a wooden building. 2.66 A German soldier stands beside a gallows on which a Soviet partisan has been hanged. 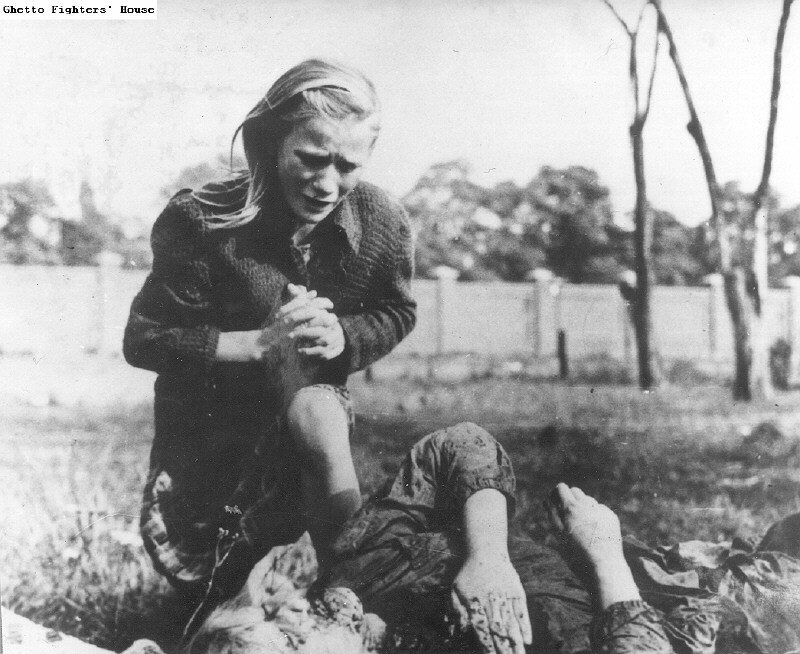 2.67 A girl murdered by the Germans. 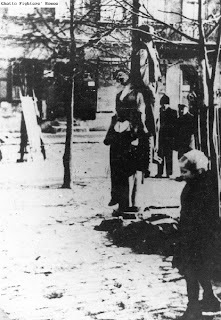 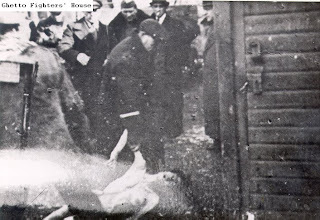 2.68 A girl walking past the bodies of two Jews hanged on a post in a street in Rzeszow. 2.69 A group of German soldiers beside a tree on which two Soviet civilians have been hanged. 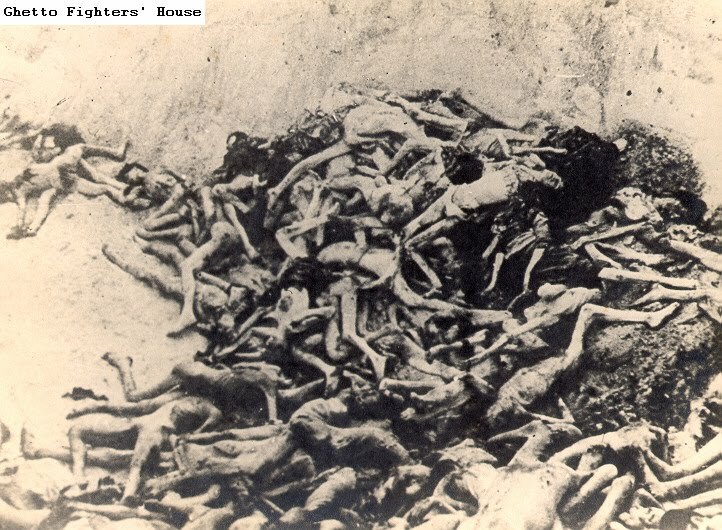 2.71 A pile of corpses in the Auschwitz camp. 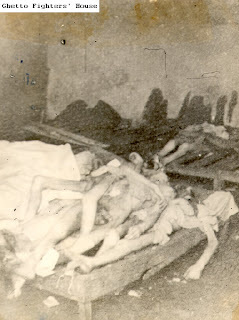 2.72 A prison cell in Block 11 in the Auschwitz camp on the day of the camp's liberation. 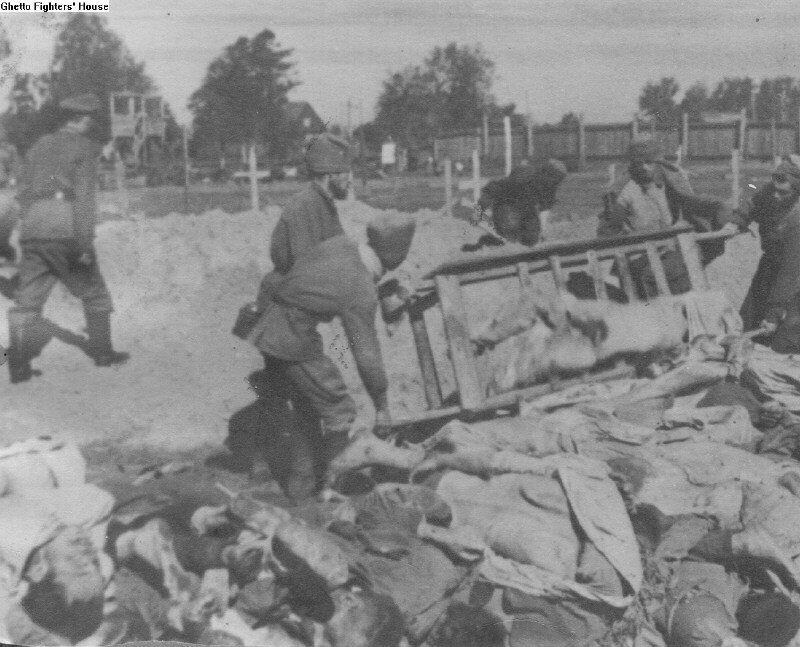 2.74 Collecting the bodies of victims in the Birkenau camp. 2.75 Corpses being incinerated outside the area of the Birkenau camp crematorium. 2.76 A woman and child, survivors of Birkenau, stand among the bodies of inmates on the day of the camp's liberation. 2.77 Bodies and piles of clothing in Birkenau on the day of the camp's liberation. 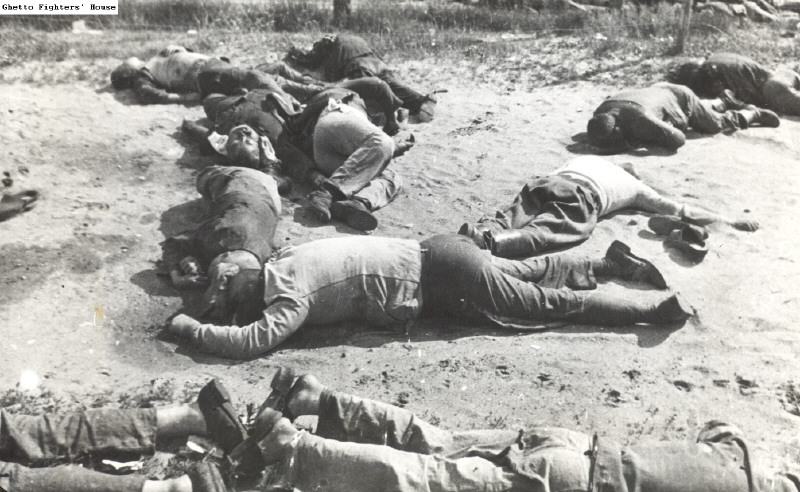 2.78 Bodies in Birkenau on the day of the camp's liberation. 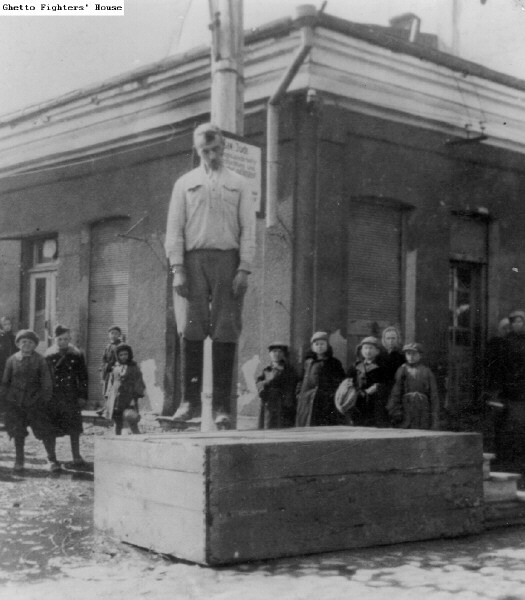 2.79 A Jew hanged from an electricity pole in the Kovel ghetto. 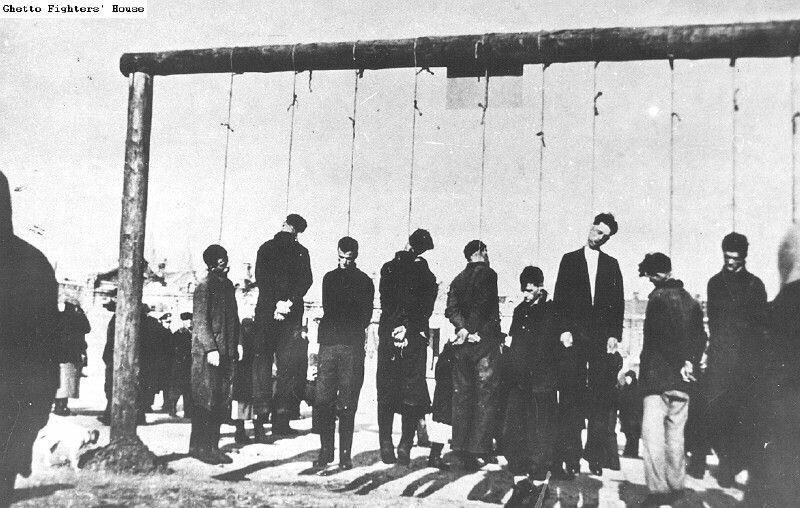 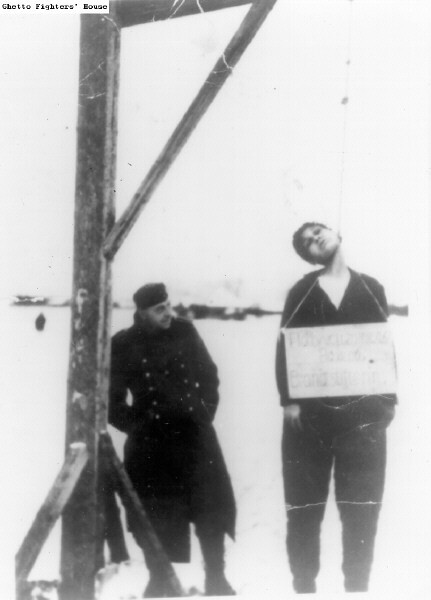 2.80 A Jew hanged on a gallows in Kovel. 2.81 A Jew hanged on a gallows in Kovel. 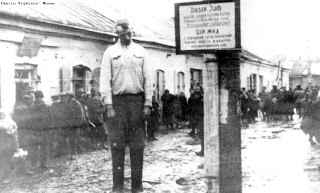 2.82 A Jew hanged on an electricity pole on a street in Kovel. 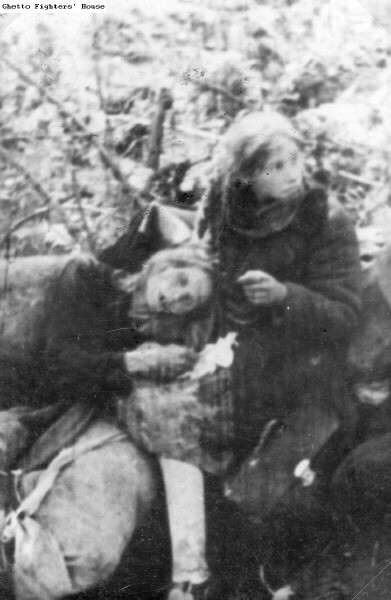 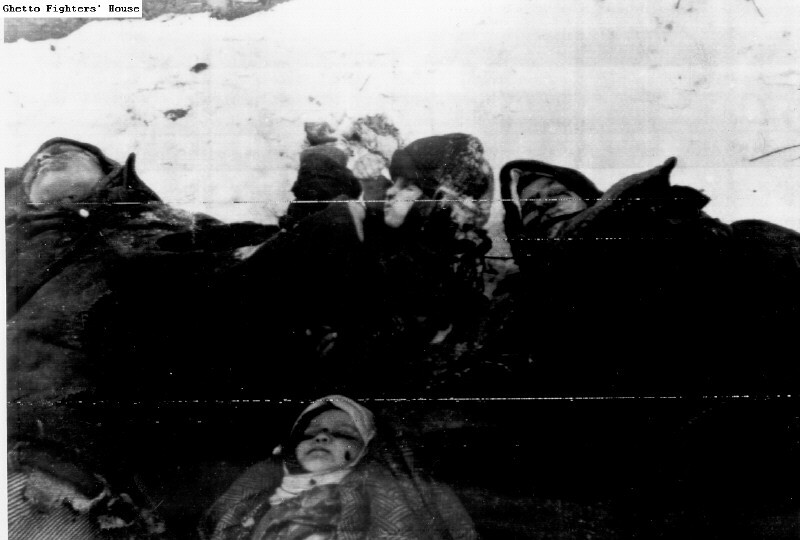 2.83 A Jewish girl sitting beside the body of her mother in the Borislav ghetto. 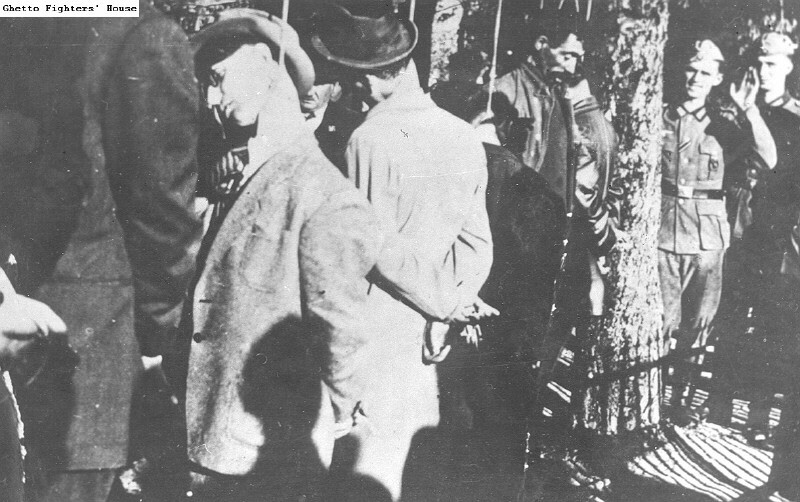 2.84 A Lithuanian armed with an iron bar, who took part in the pogrom in Kaunas (Kovno), posing beside the bodies of Jews. 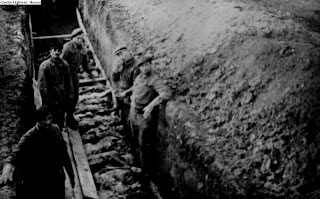 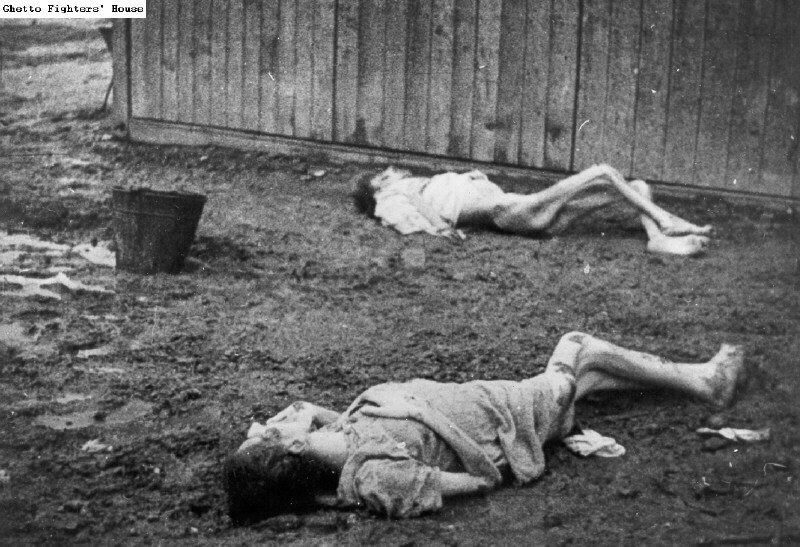 2.85 German POWs on a work detail, uncovering the bodies of Jews who died of asphyxiation in bunkers in the Kaunas (Kovno) ghetto. 2.86 Human remains uncovered in the Kaunas (Kovno) ghetto after the war. 2.87 A man in uniform, posing for a photo amid the corpses at a mass murder site. 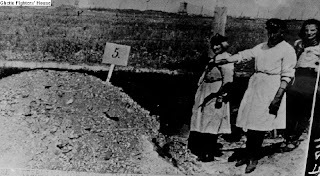 2.88 A mass extermination site on the grounds of a cemetery. 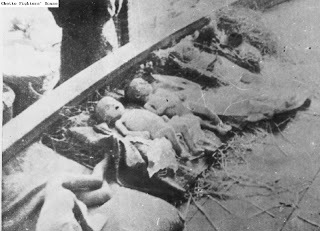 2.89 A mother and her children who were murdered. 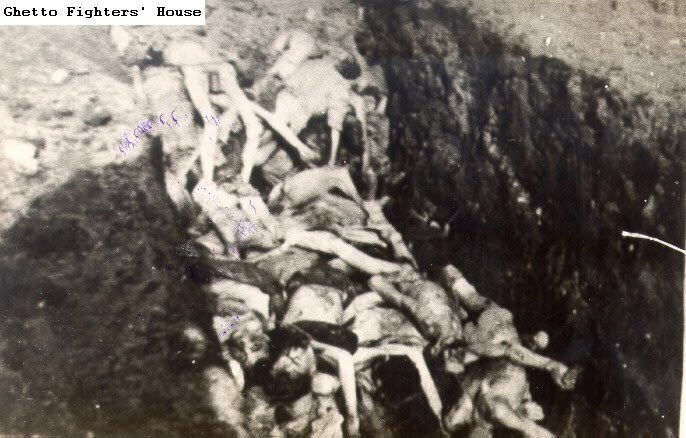 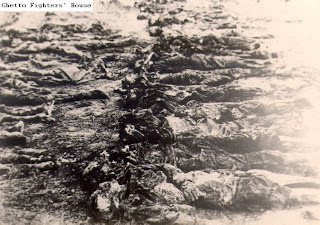 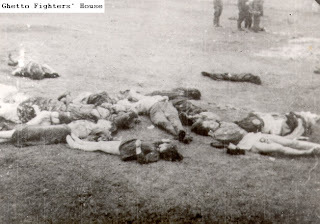 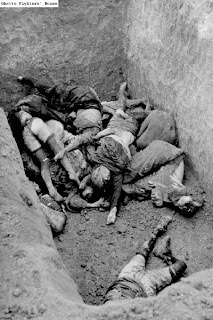 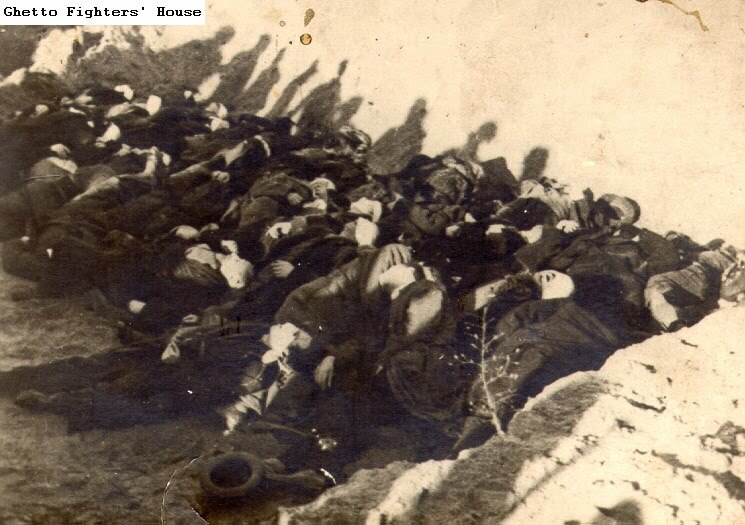 2.90 A pile of bodies, apparently of POWs, in Helmeu, Romania. 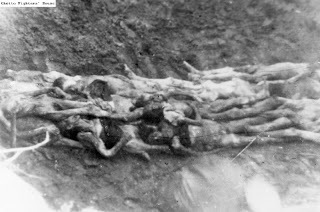 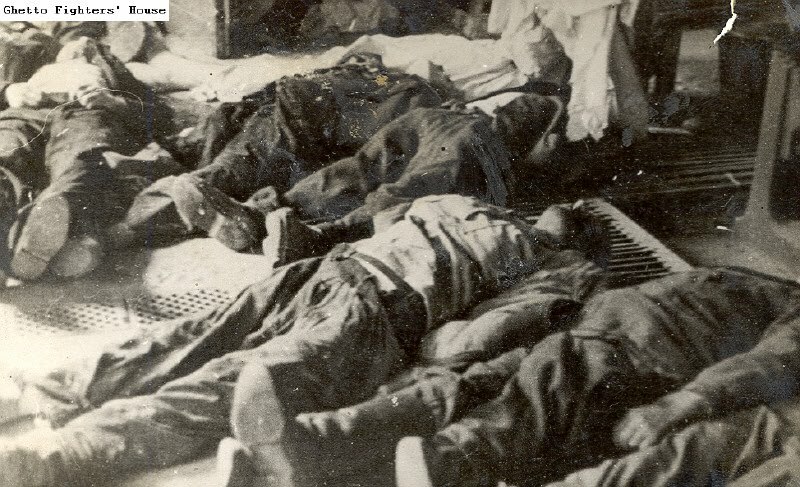 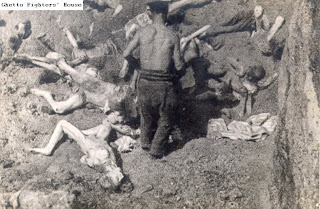 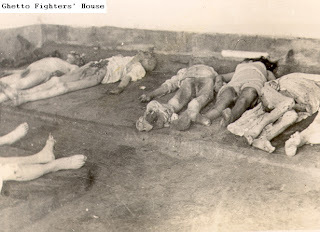 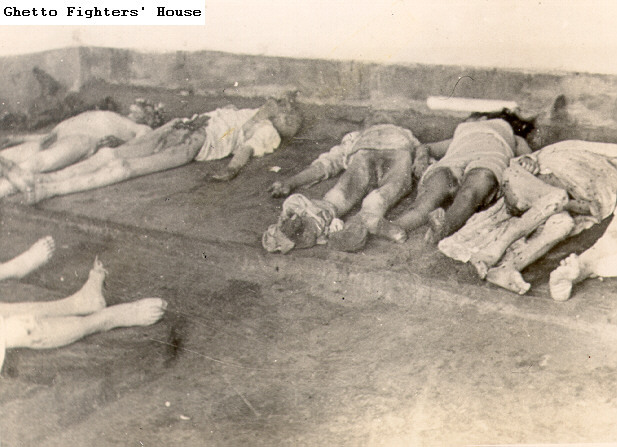 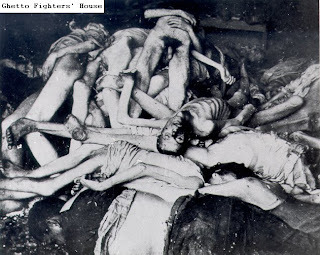 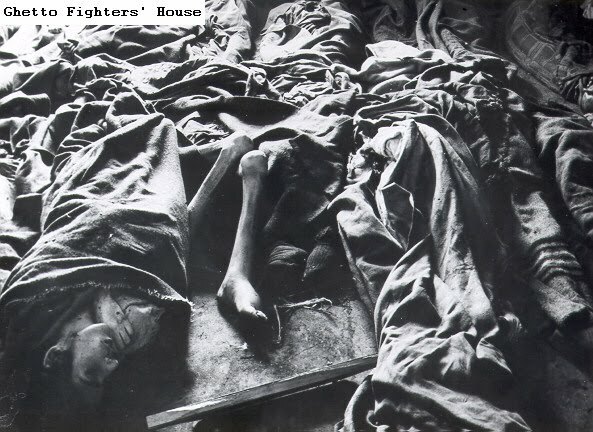 2.91 A row of bodies, apparently photographed in a POW camp. 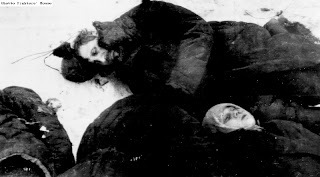 2.92 Bodies of POWs in the Zimovniki POW camp, near Stalingrad. 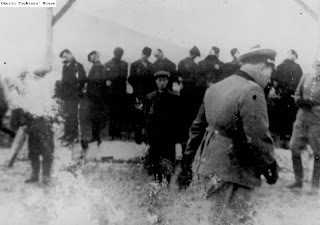 2.93 Burial of the slain in the Dzialdowo POW camp. 2.94 A public hanging of ten Jews in the Belchatow ghetto. 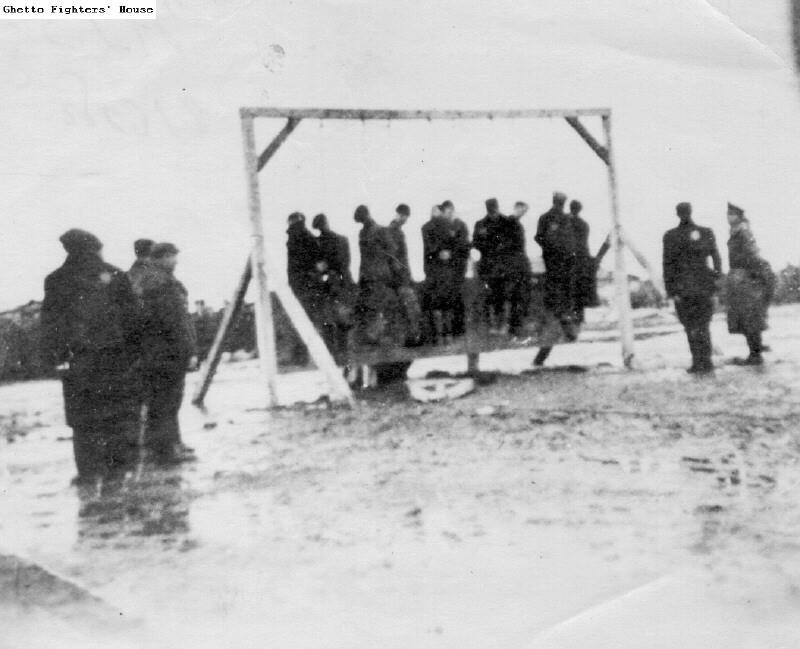 2.95 A public hanging of ten Jews in the Belchatow ghetto. 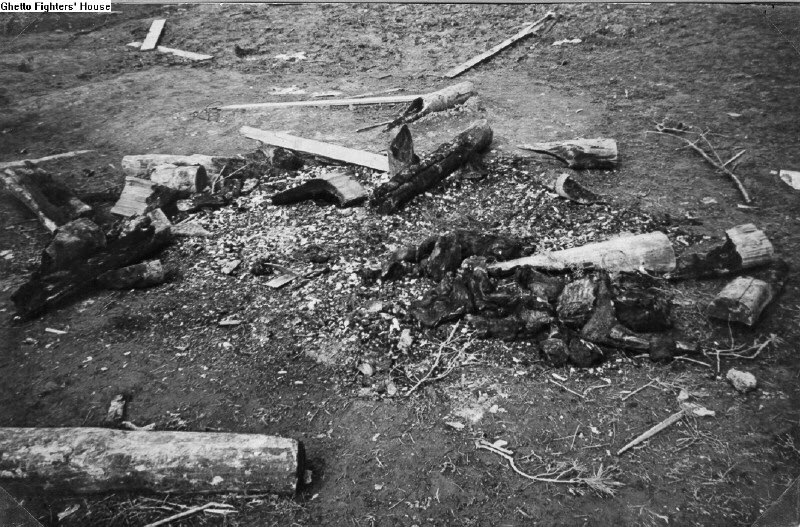 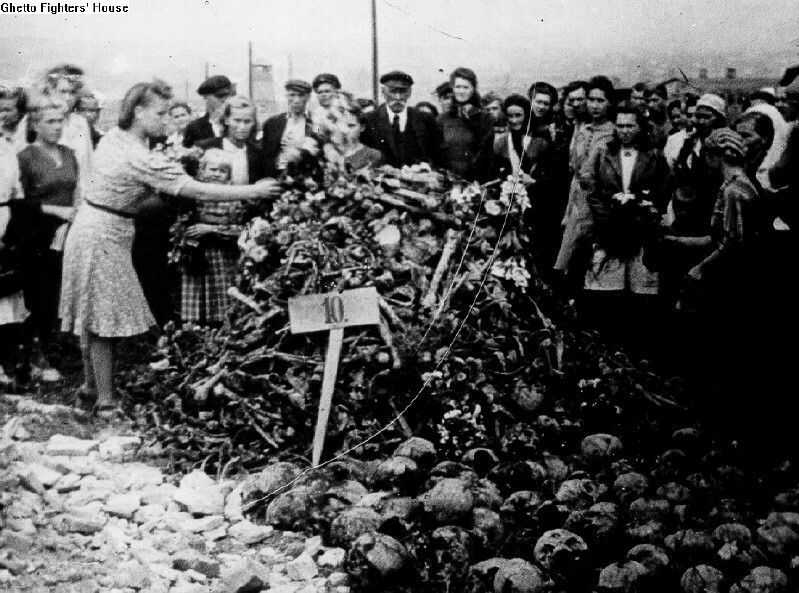 2.96 A pyre on which the corpses of Klooga camp inmates had been burned. 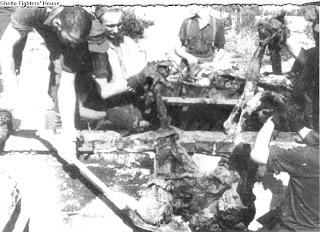 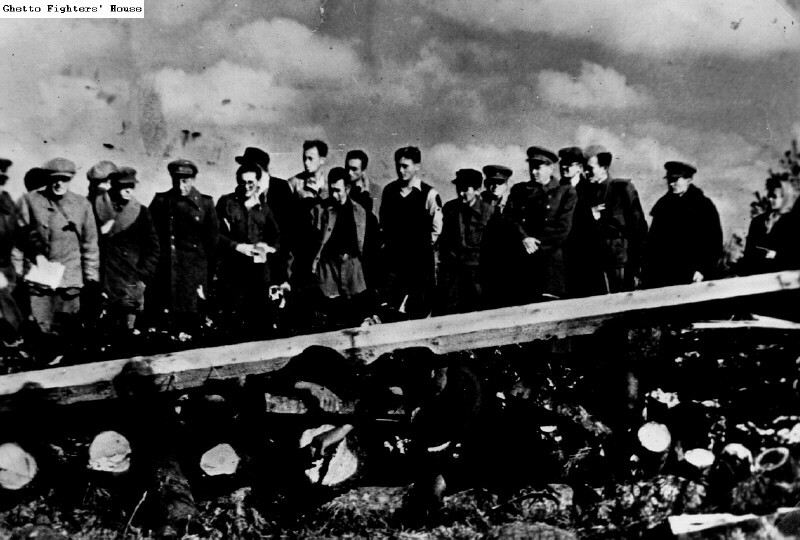 2.97 A Soviet investigating committee beside a pyre stacked with the bodies of victims in the Klooga camp. 2.98 A Soviet investigative commission inspecting the Klooga camp, standing beside one of the pyres that had not been set afire. 2.99 A Soviet investigative commission inspecting the Klooga camp, standing beside a pyre stacked with the corpses of inmates. 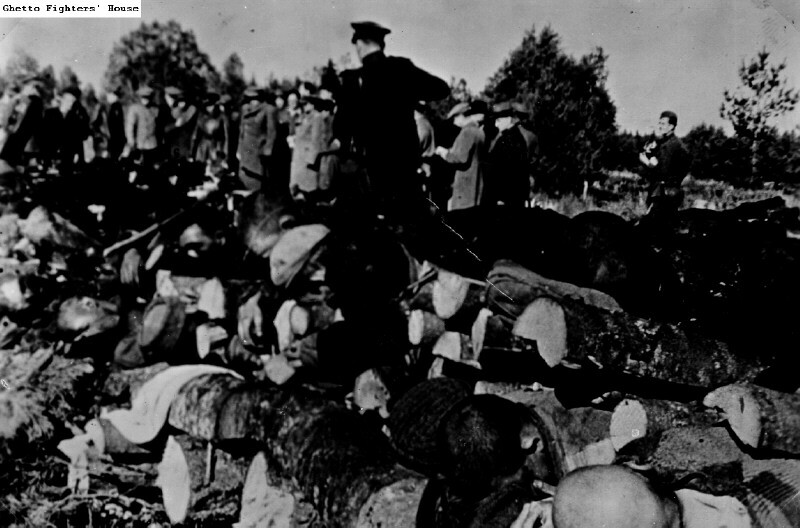 2.100 A Soviet investigative commission inspecting the Klooga camp, standing beside a pyre stacked with the corpses of inmates. 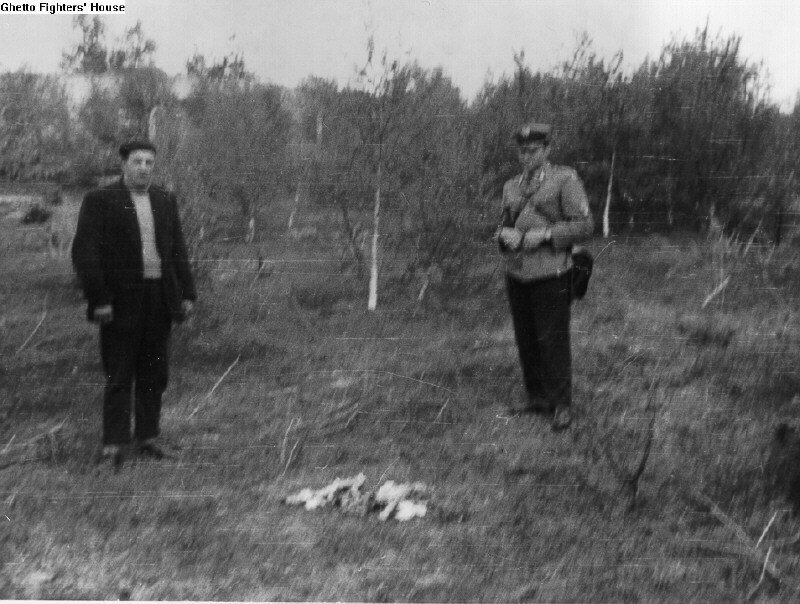 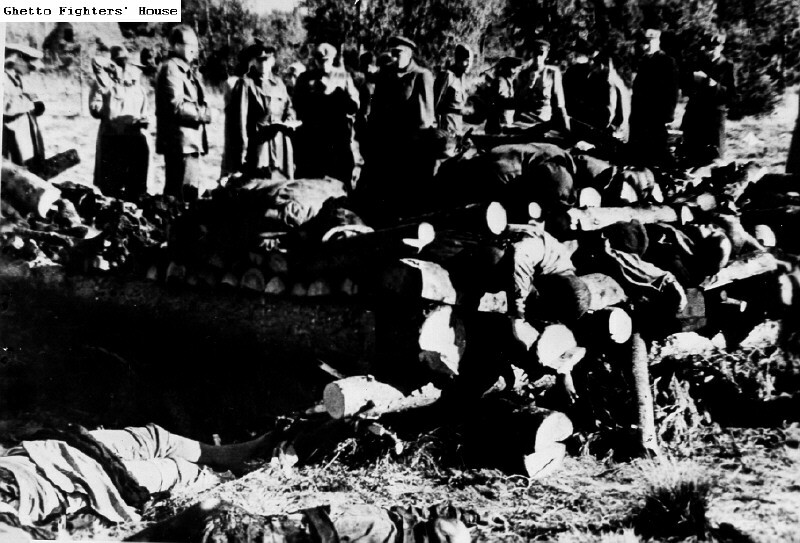 2.101 A Soviet investigative commission inspecting the Klooga camp, gathered beside a pyre on which the corpses of inmates had been prepared for burning. 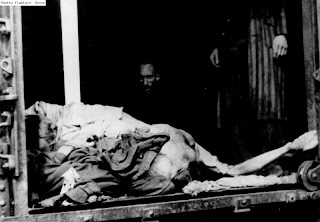 2.102 A woman's corpse in the Klooga camp. 2.103 German POWs assigned to a work detail, bringing corpses of Klooga camp inmates for burial. 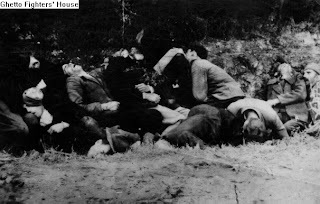 2.104 A row of bodies of Jews killed in a pogrom in Sisak, Croatia. 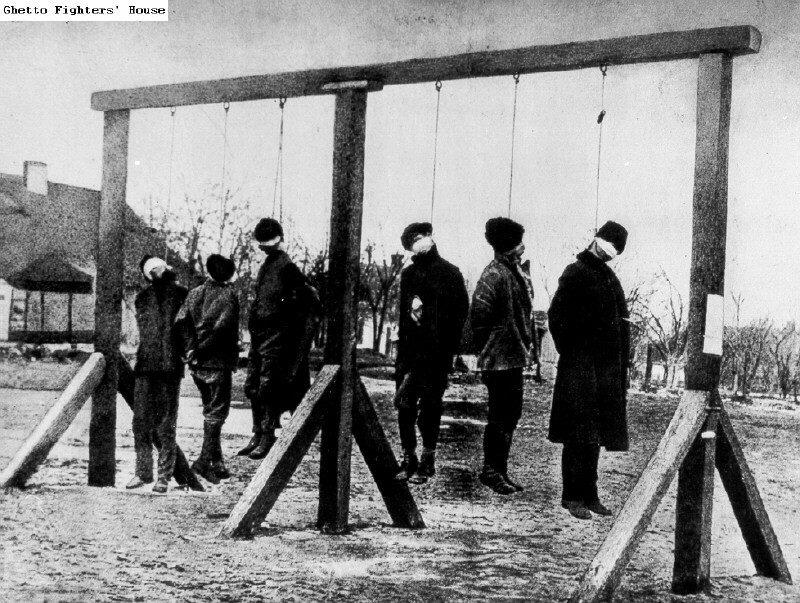 2.105 A row of gallows on which Soviet hostages were hanged by the German army. 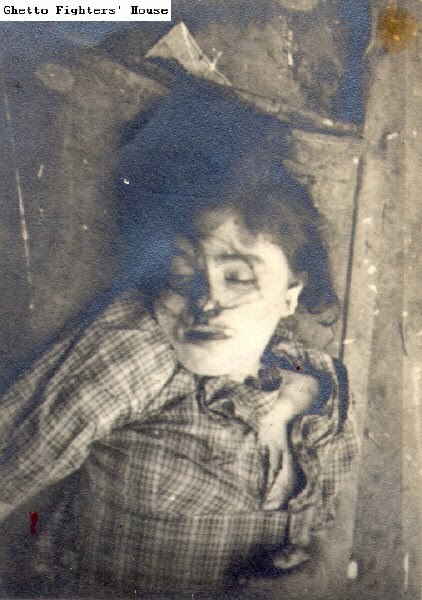 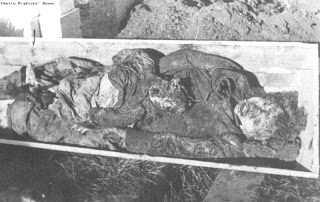 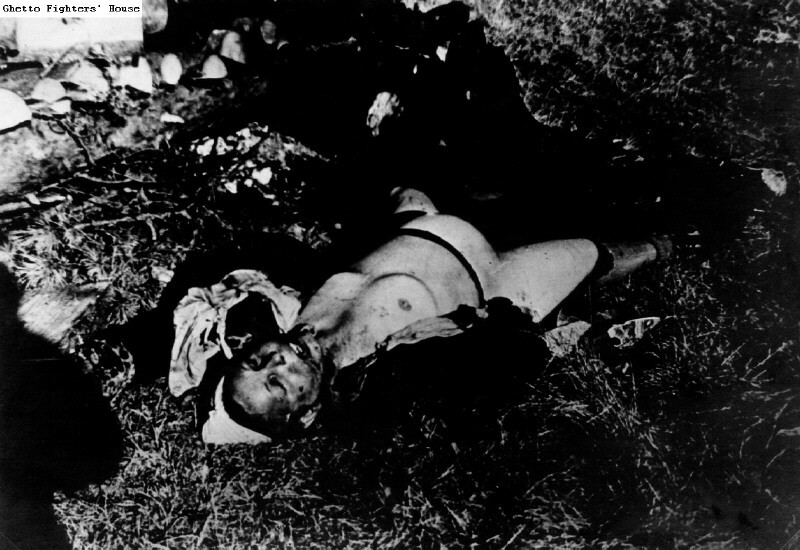 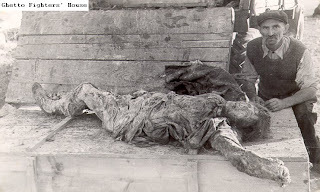 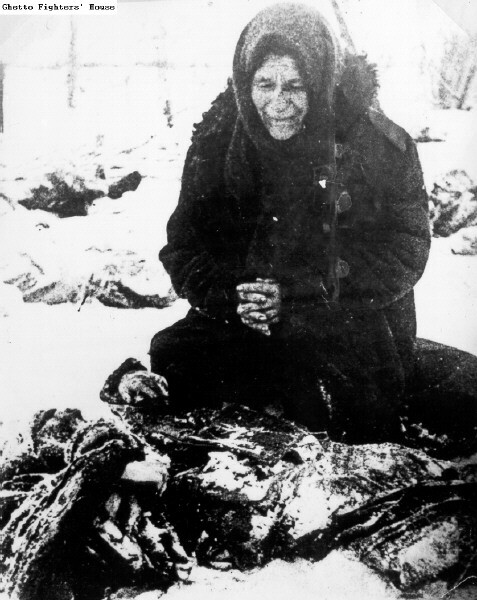 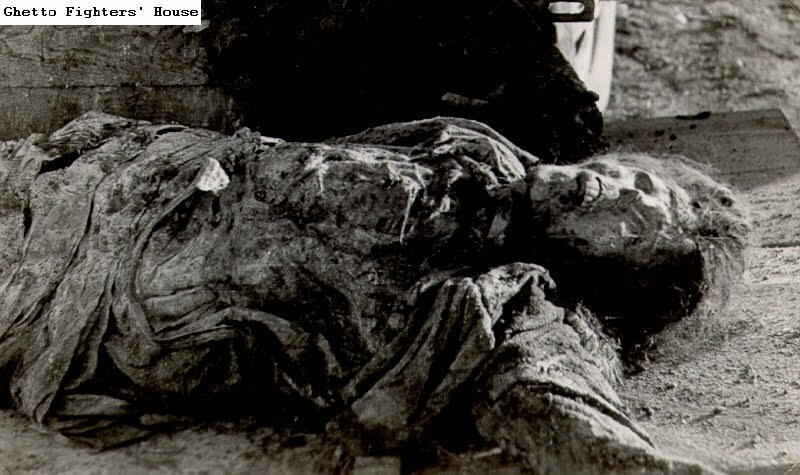 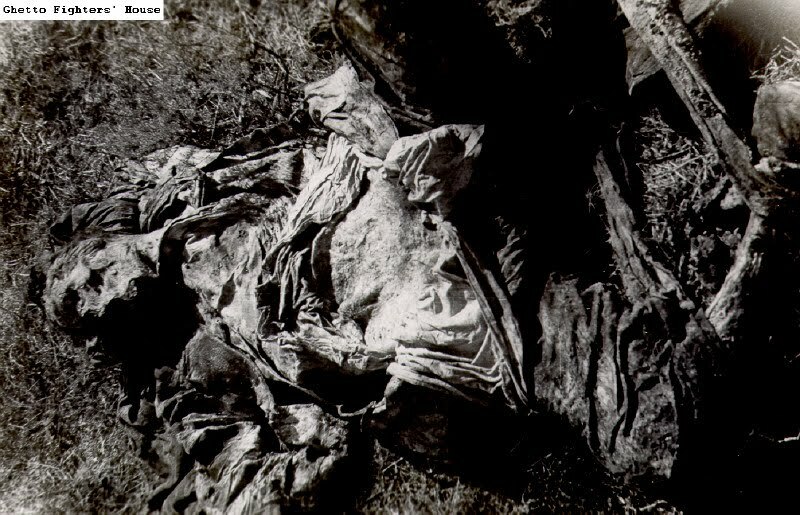 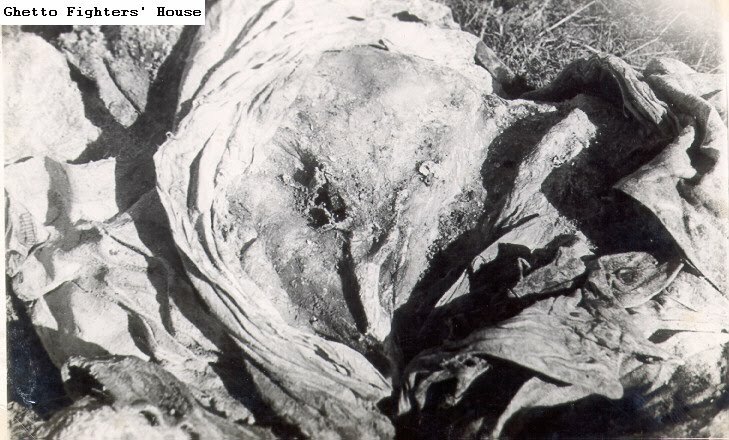 2.106 A Russian woman beside the body of her husband who was killed by the SS in Gerasimov, a village in the Rostov area. 2.107 A soldier of the Soviet Red Army in a Nazi camp following its liberation, standing beside a wagon loaded with corpses. 2.108 A wagon loaded with bodies, beside the crematorium in the Terezin (Theresienstadt) ghetto. 2.109 Exhumation of the remains of victims of the Terezin (Theresienstadt) ghetto. 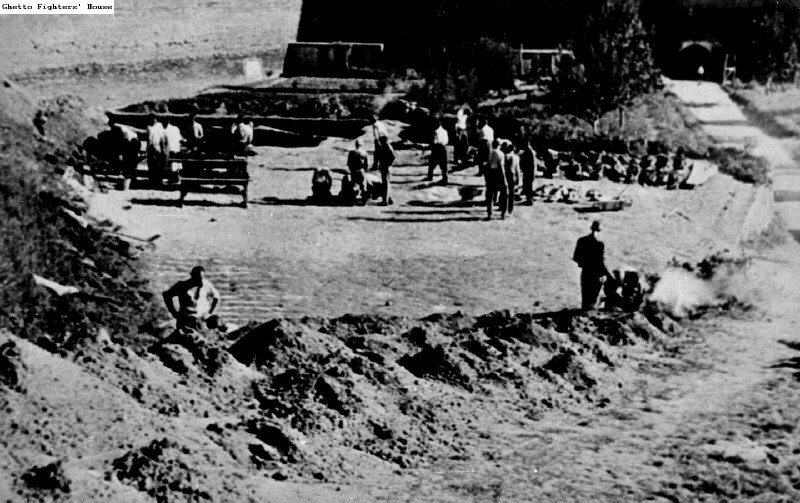 2.110 Exhumation of the remains of victims of the Terezin (Theresienstadt) ghetto. 2.111 Exhumation of the remains of victims of the Terezin (Theresienstadt) ghetto. 2.112 Exhumation of the remains of victims of the Terezin (Theresienstadt) ghetto. 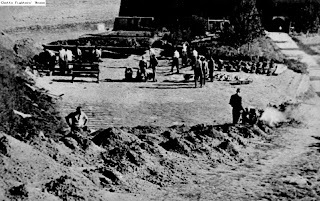 2.113 Exhumation of the remains of victims of the Terezin (Theresienstadt) ghetto. 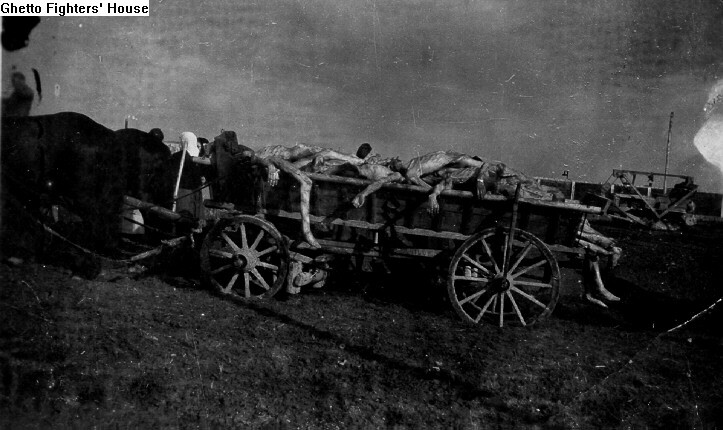 2.114 A wagon loaded with bodies. 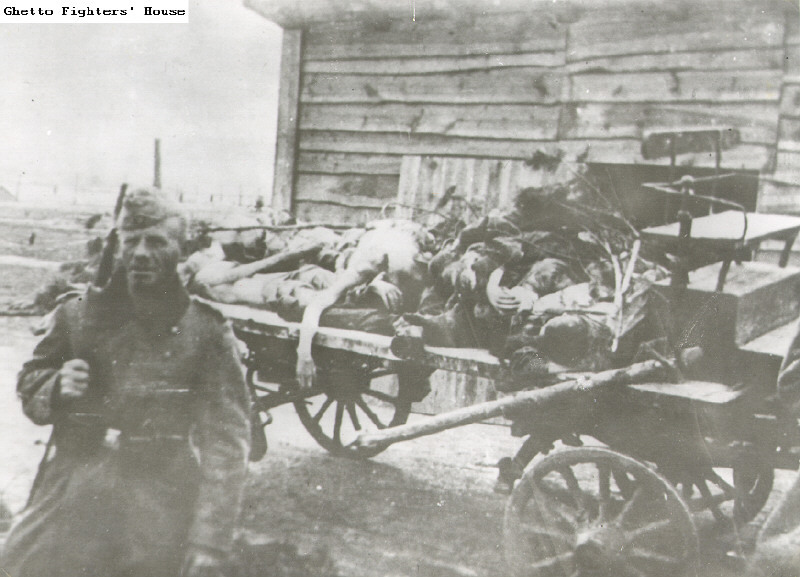 2.115 A wagon loaded with the bodies of murdered Jews, with an armed German soldier standing beside it. 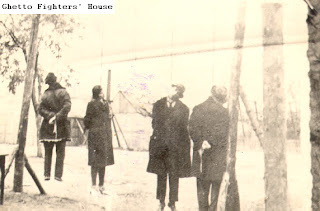 2.116 A young woman and two boys standing opposite a gallows upon which two men have been hanged. 2.117 An exhumed body about to be being taken for proper burial. 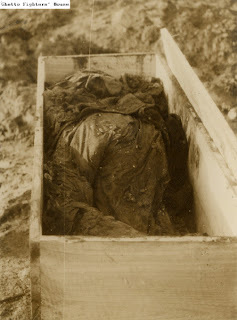 2.118 An exhumed body about to be being taken for proper burial. 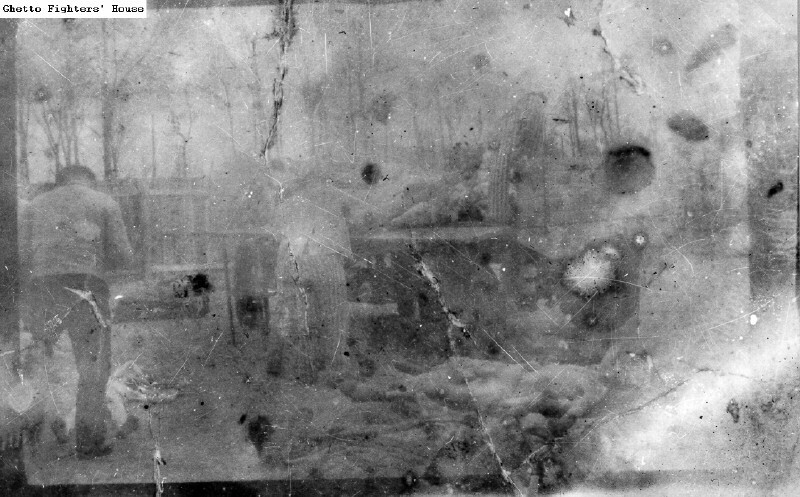 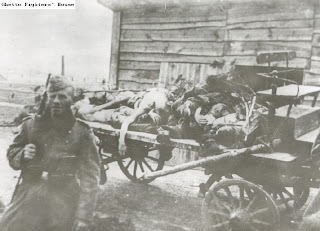 2.119 An SS officer looking at a wagon piled with bodies. 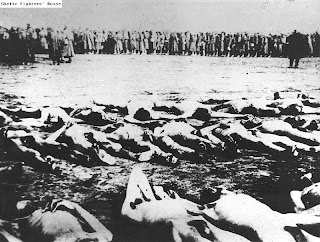 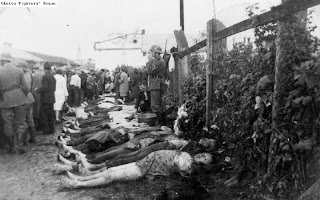 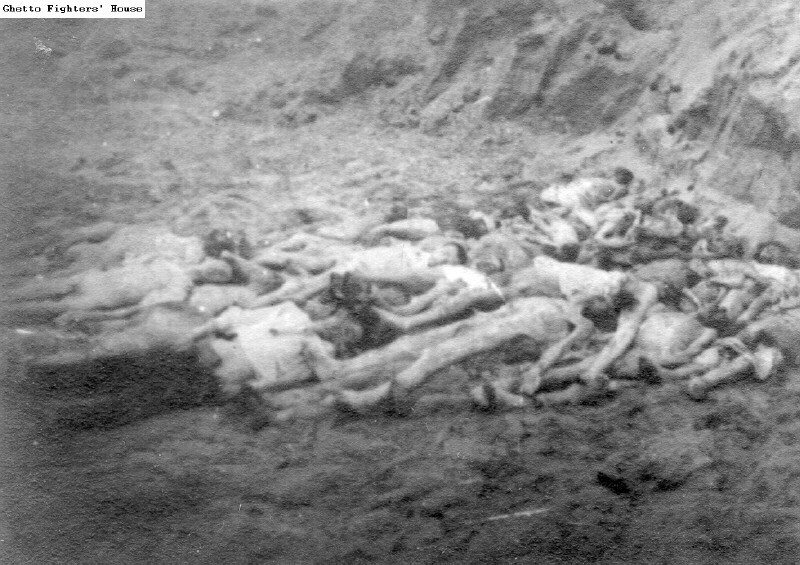 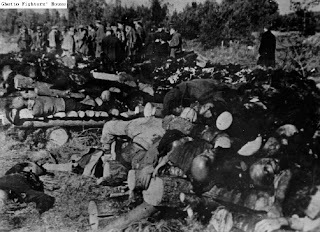 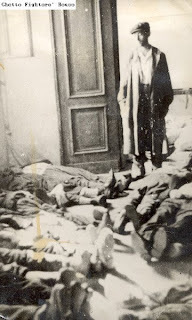 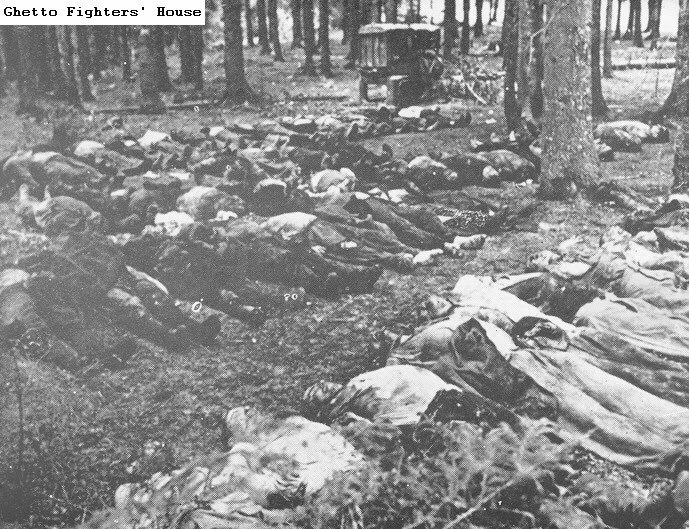 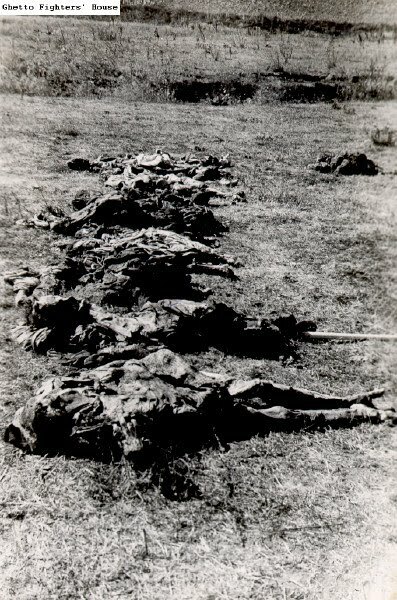 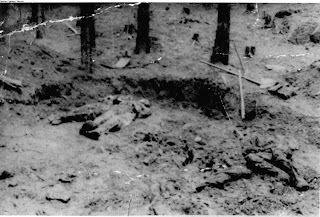 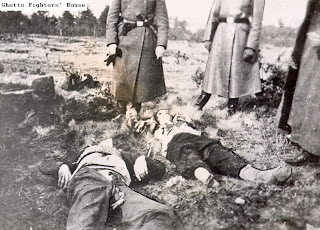 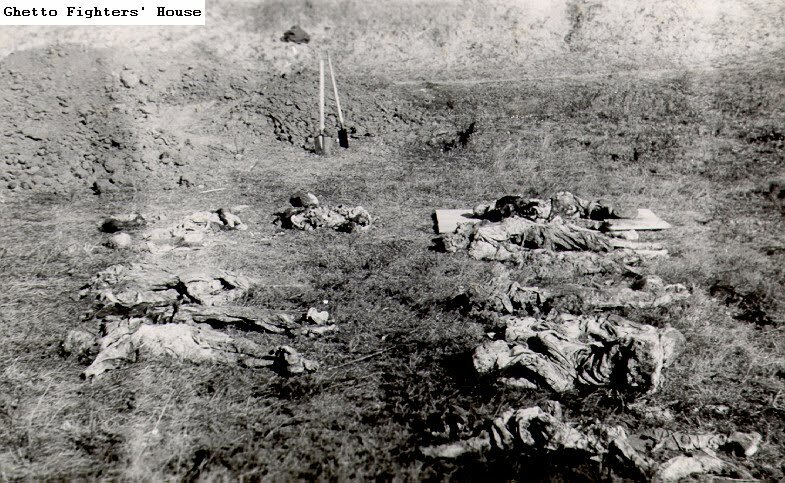 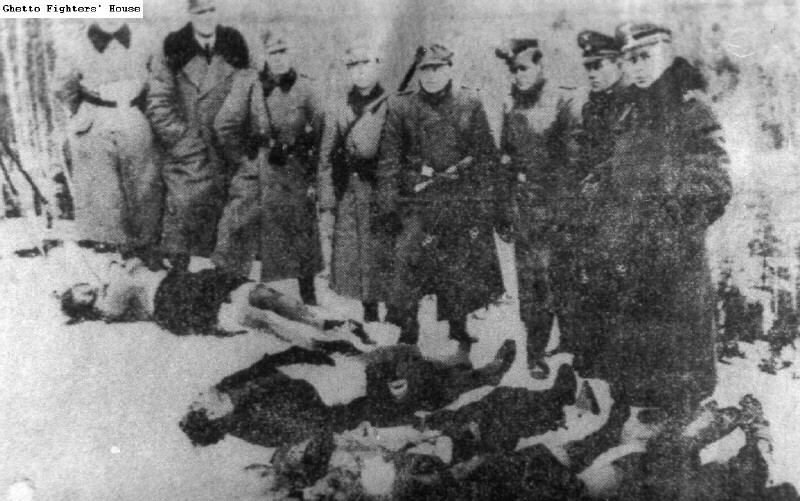 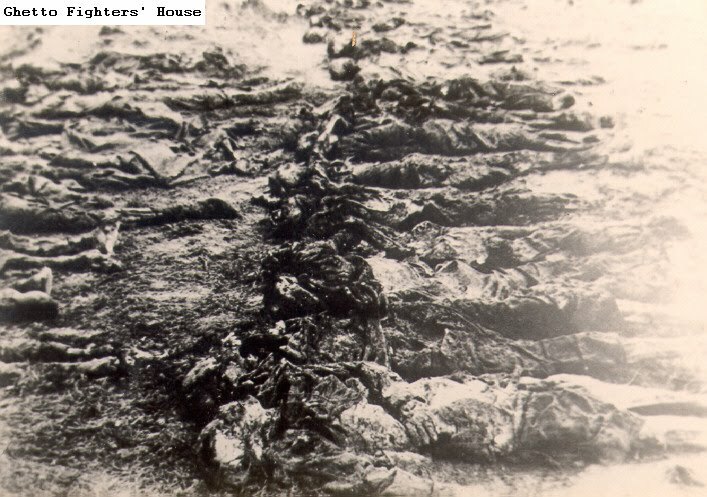 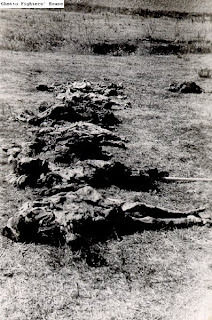 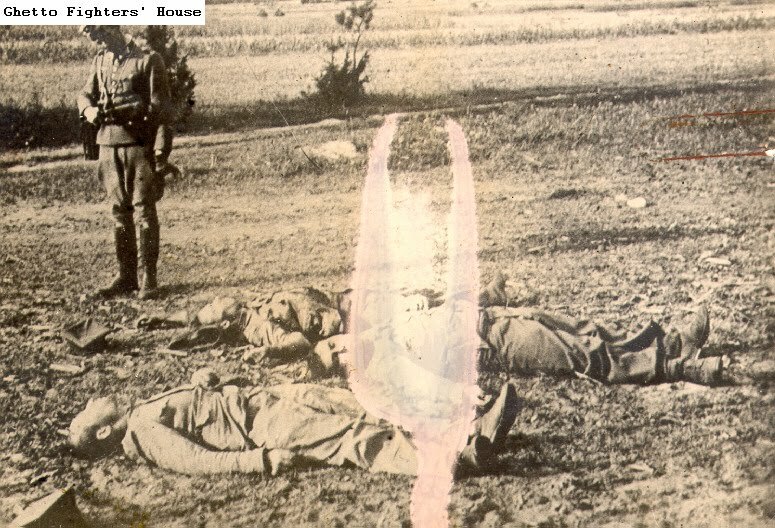 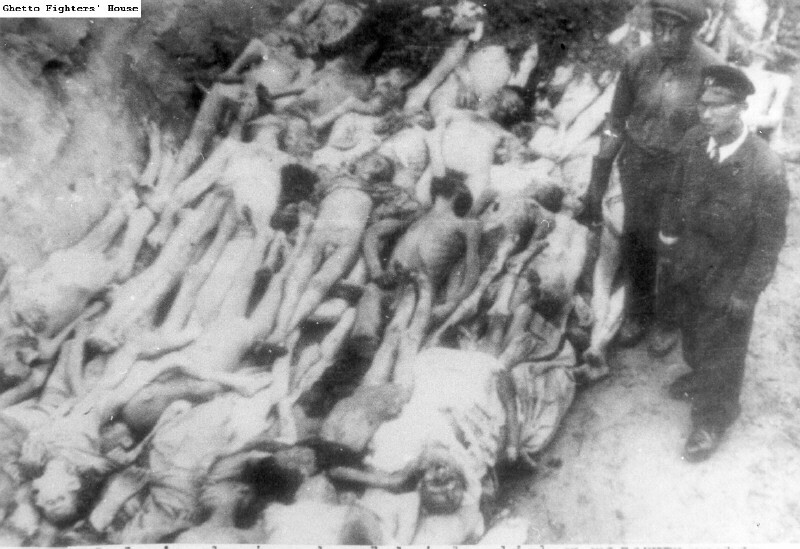 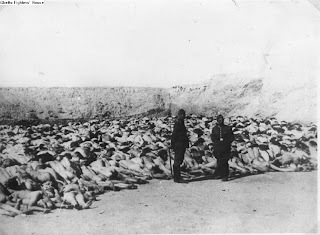 2.120 Armed German soldiers standing beside the bodies of Opoczno Jews they had killed. 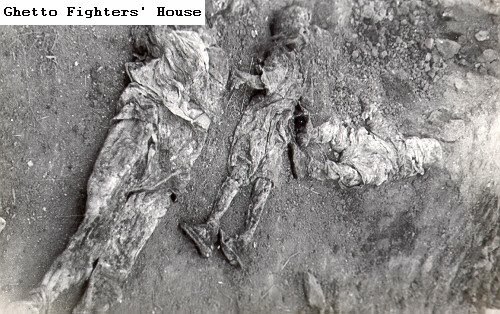 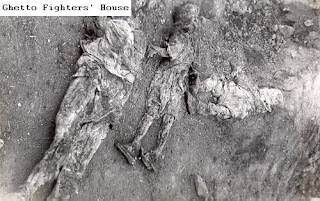 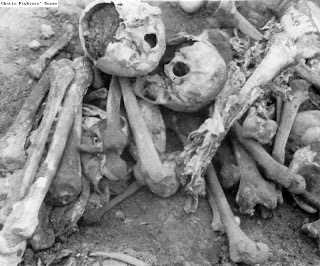 2.121 Bodies and partial remains that had been exhumed from a grave at an execution site. 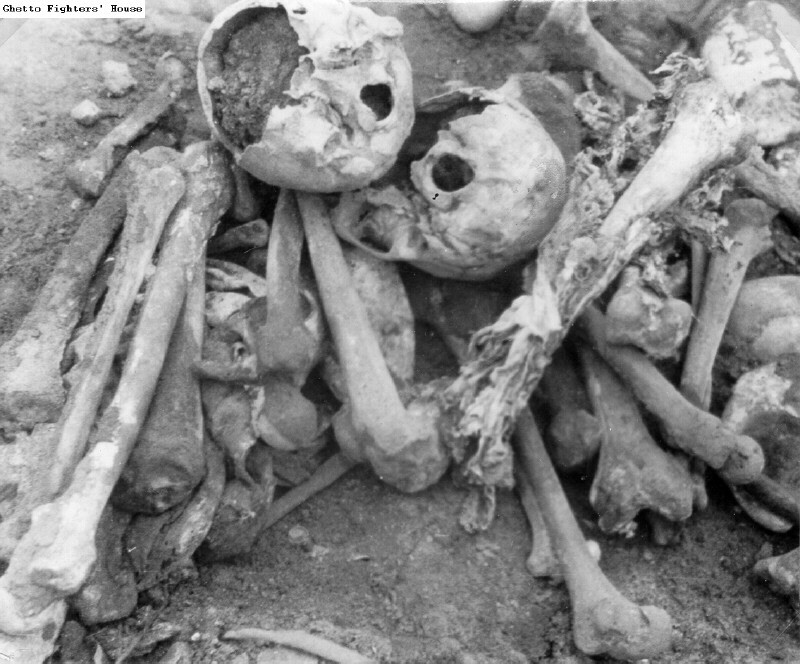 2.122 Bodies and partial remains that had been exhumed from a grave at an execution site. 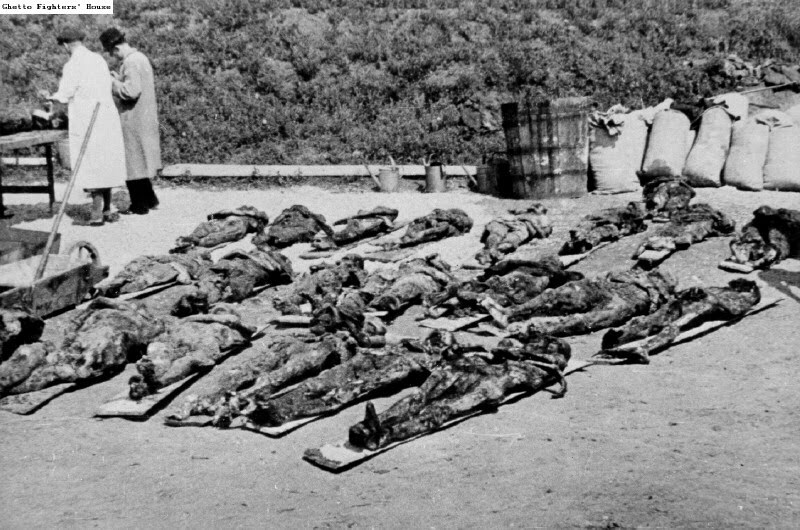 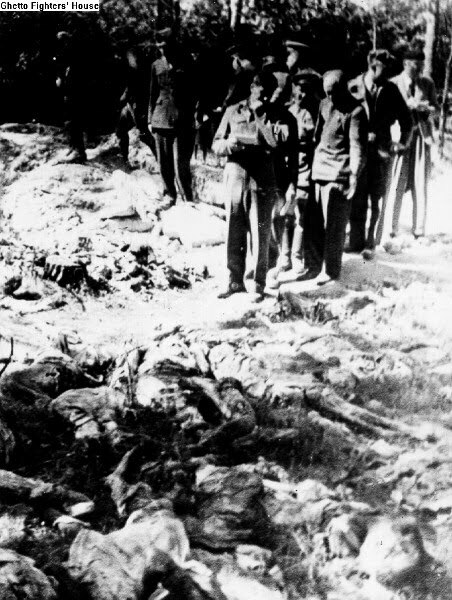 2.123 Bodies at a mass extermination site. 2.124 Bodies at a mass murder site in Poland. 2.125 Bodies at the Ponary mass extermination site near Vilnius (Vilna). 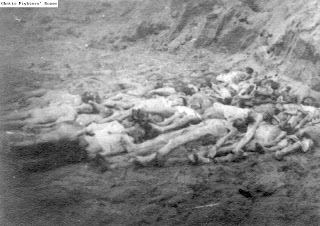 2.126 Bodies at the Ponary mass extermination site near Vilnius (Vilna). 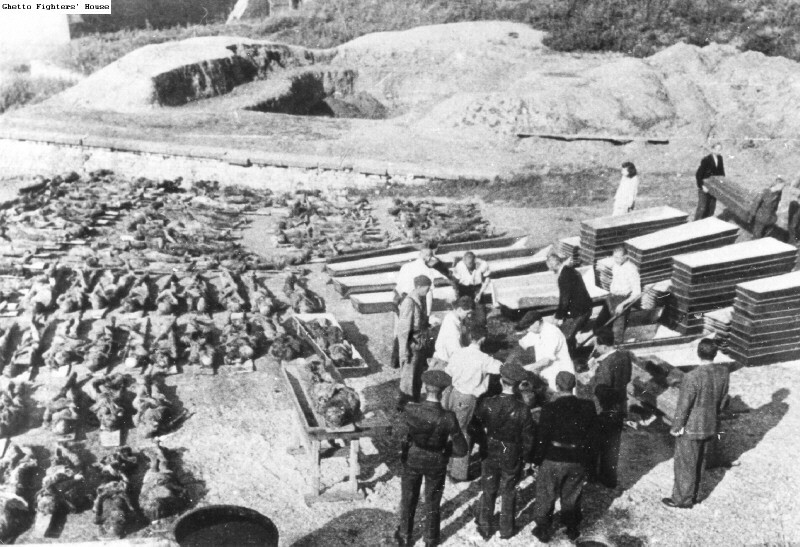 2.127 Bodies exhumed at a mass murder site. 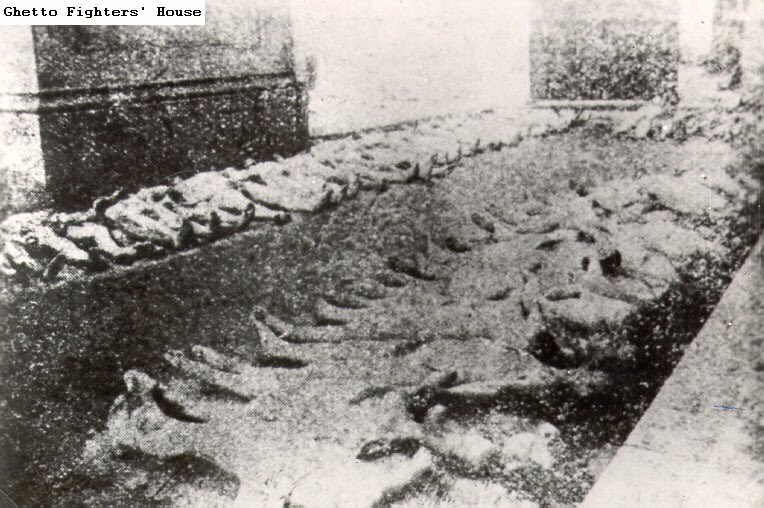 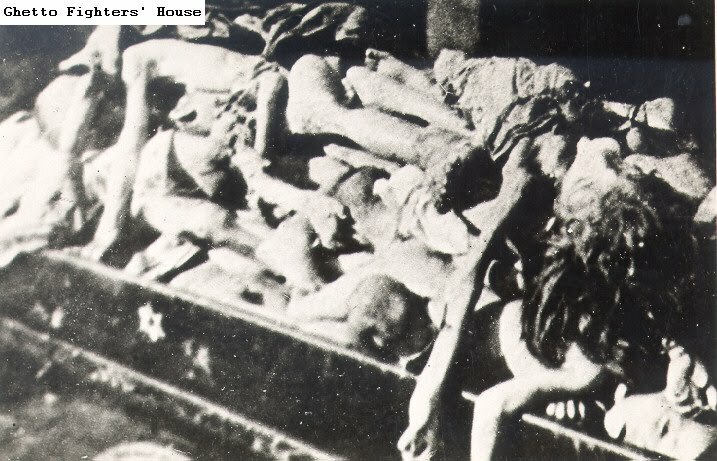 2.128 Bodies in a train that arrived at the Bohusovice railway station. 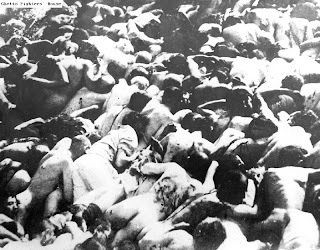 2.129 Bodies of Jews in the Budapest ghetto. 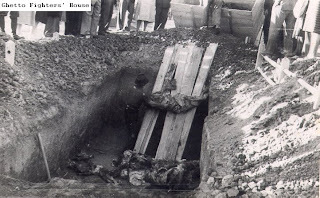 2.130 Bodies that had been exhumed, being taken for proper burial. 2.131 Bodies that were exhumed, apparently at an execution site. 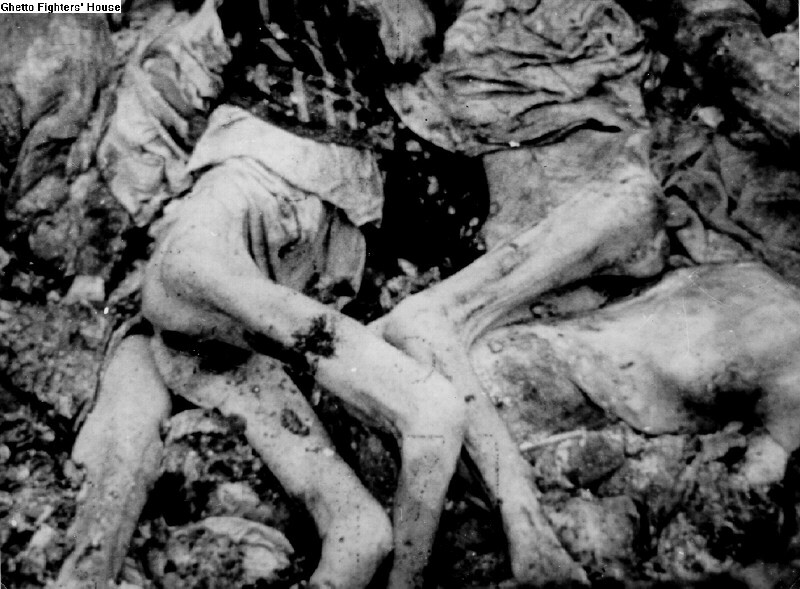 2.132 Children killed in Yugoslavia. 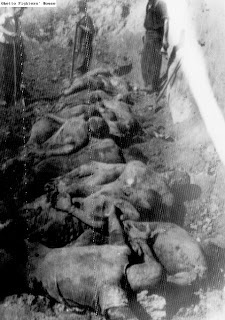 2.133 Corpses in a settlement that was demolished. 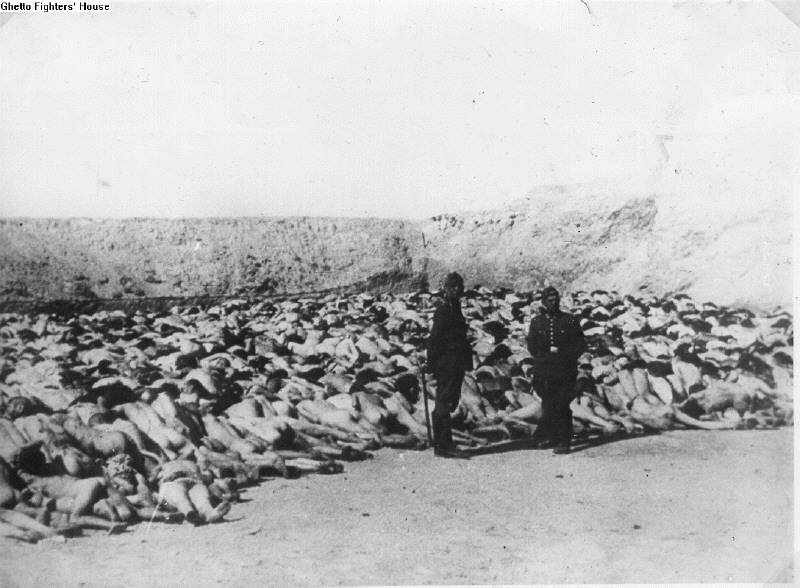 2.134 Corpses on the ground at a mass execution site. 2.135 Eight Jews hanged on a gallows in the Zdunska Wola ghetto. 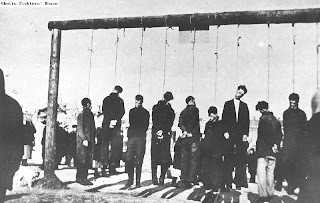 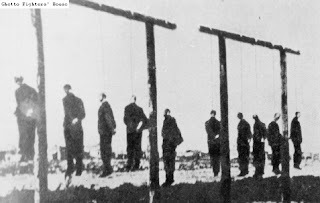 1.136 Fifteen Polish civilians hanged on a gallows in Radom. 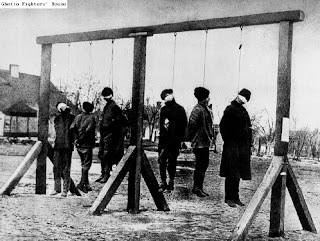 1.137 Five men who were hanged on electricity poles on a street in a town in the East. 2.138 Four men who were hanged on improvised gallow, in the East. 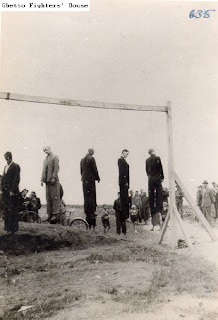 2.139 Four Polish civilians who were hanged in Michalkowice. 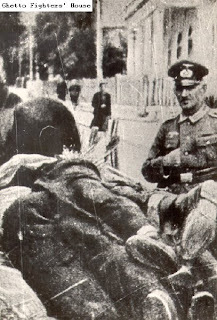 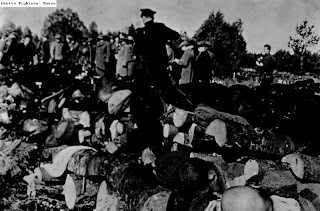 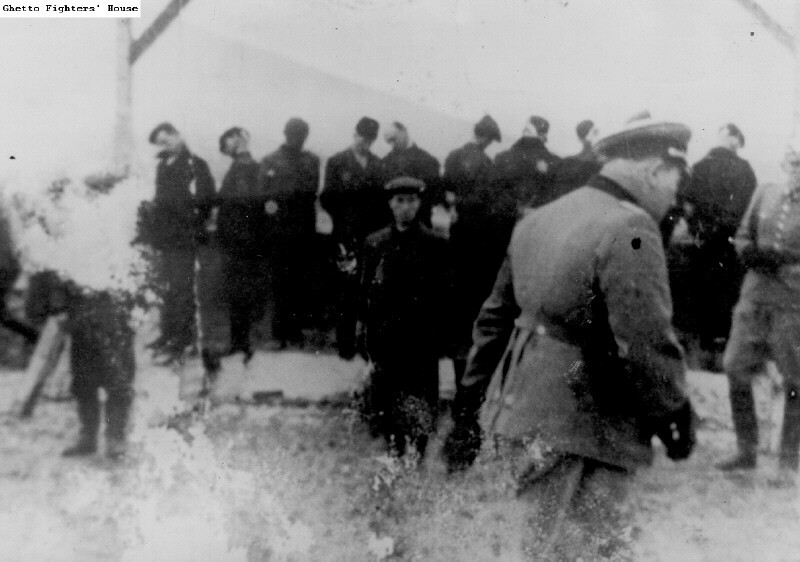 2.140 German officers standing beside the bodies of civilians. 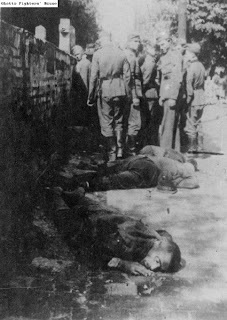 2.141 German soldiers after shooting civilians. 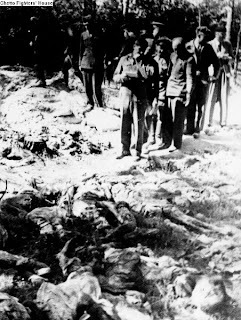 2.142 German soldiers beside the bodies of men hanged in Yugoslavia. 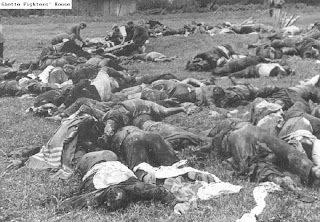 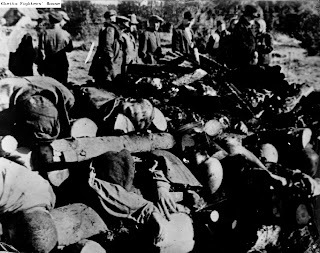 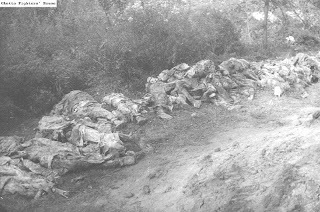 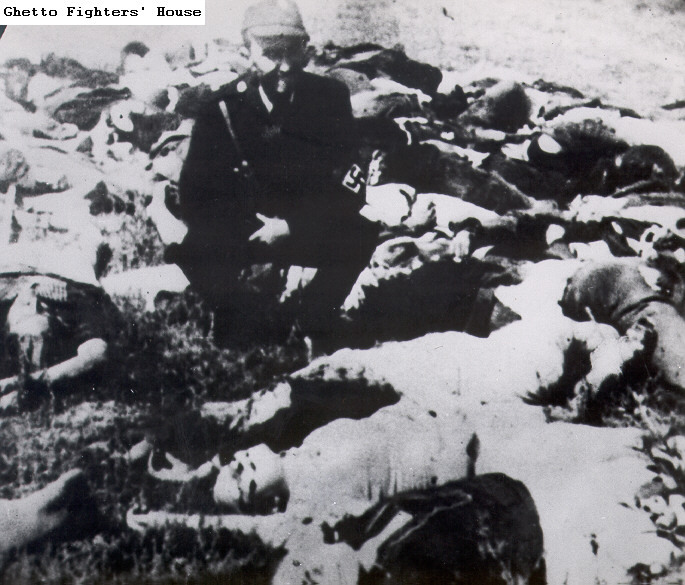 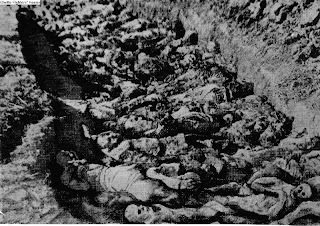 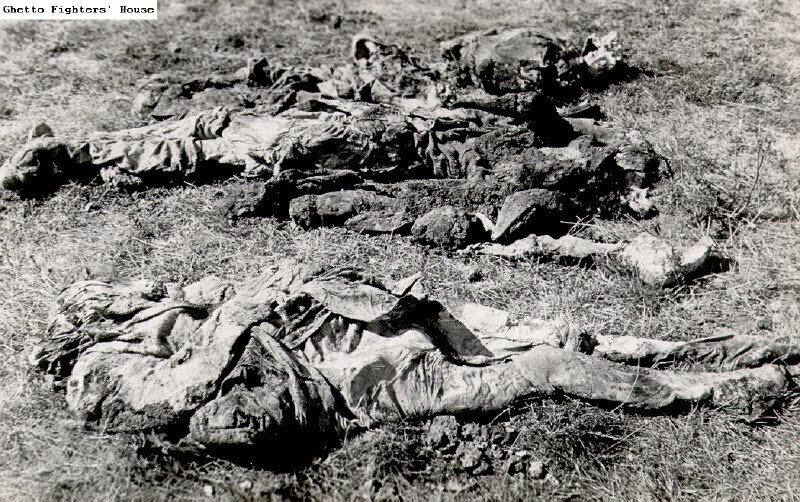 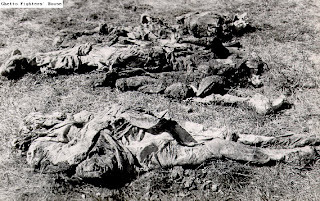 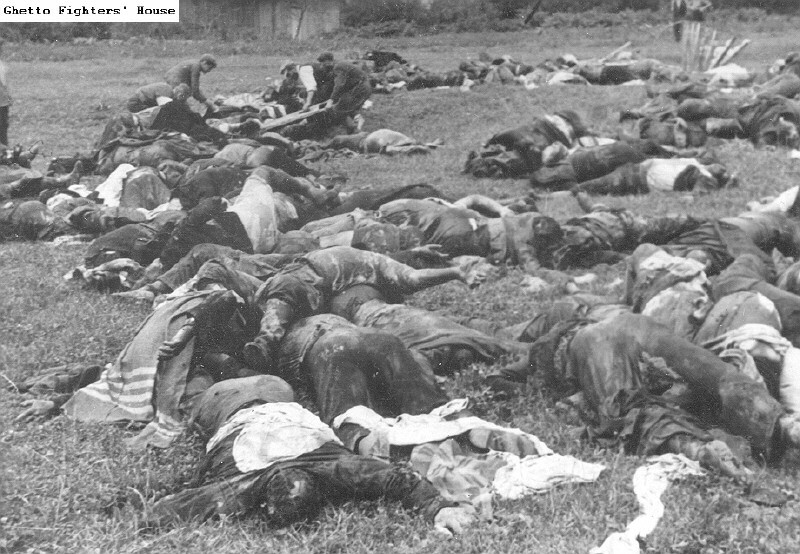 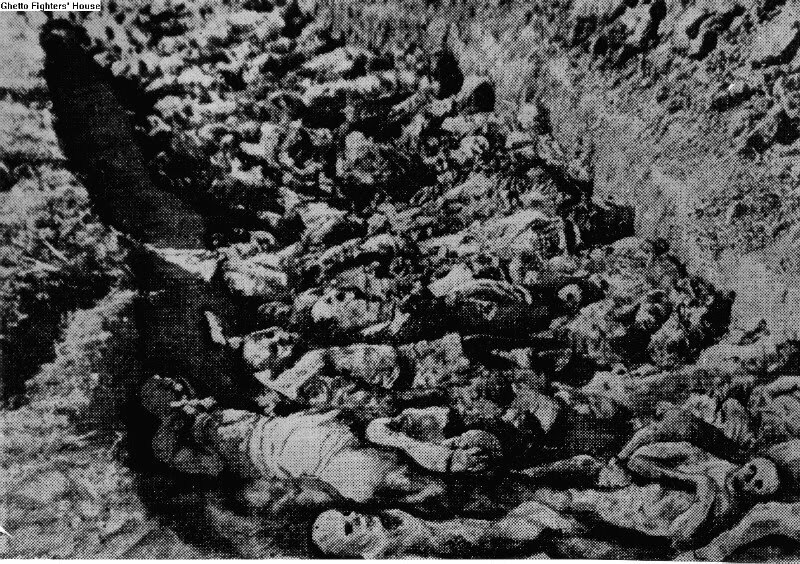 2.143 German soldiers beside the bodies of Yugoslav civilians killed in Pancevo. 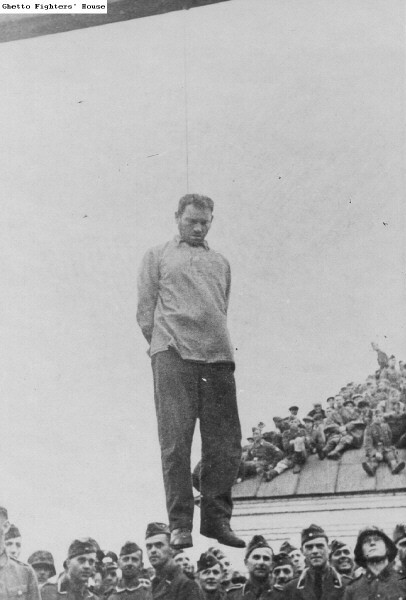 2.144 German soldiers hanging a partisan in Vitebsk. 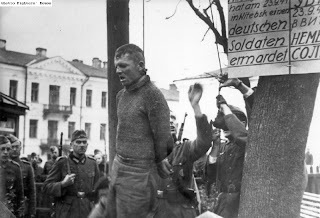 2.145 German soldiers hanging a partisan in Vitebsk. 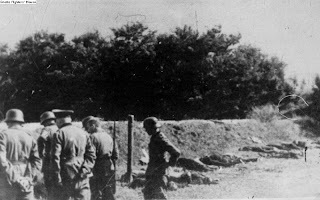 2.146 German soldiers looking at the bodies of Jews hanged on a tree in the area of Lvov. 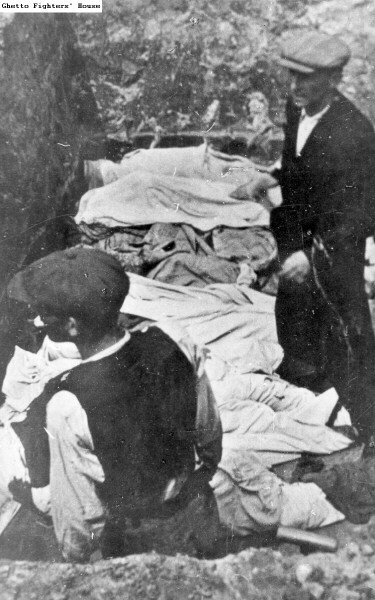 2.147 Inhabitants of the Lvov ghetto viewing the bodies of seven members of the Judenrat who were hanged. 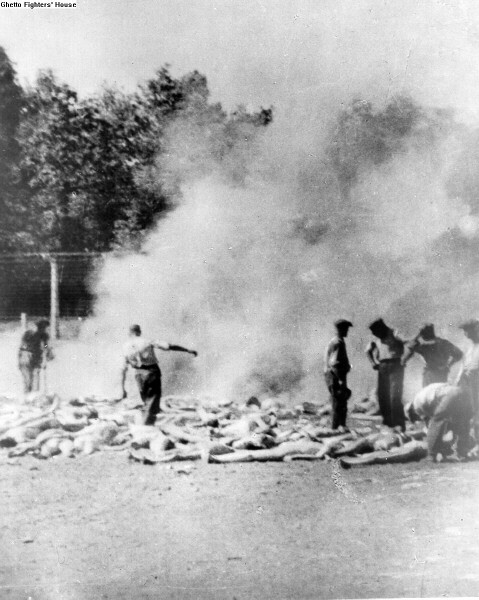 2.148 German soldiers standing beside the bodies of Jews at the Jajinci extermination site near Beograd (Belgrade). 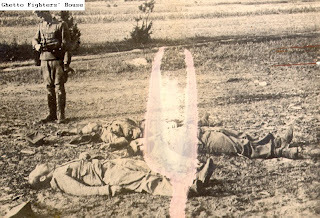 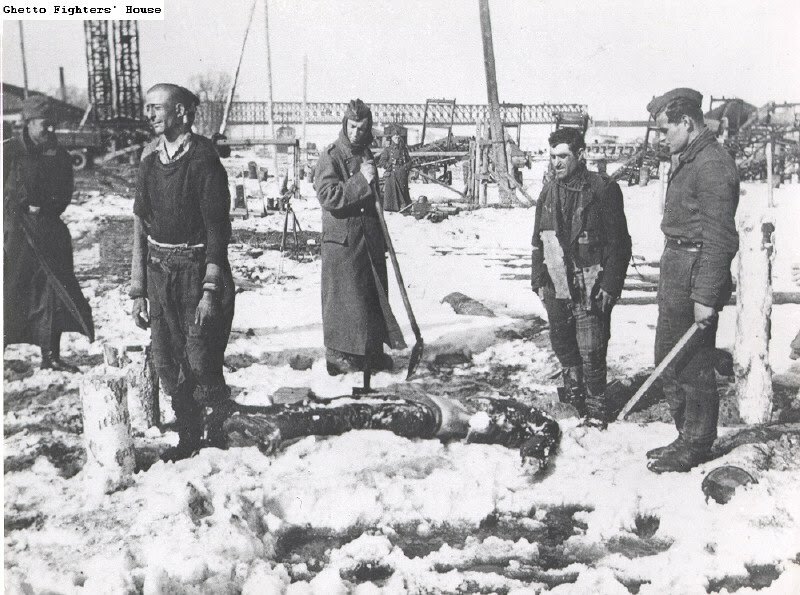 2.149 German soldiers standing beside the body of a Jew whom they beat to death. 2.150 Jewish gravediggers digging a grave for Jews who were executed in Bochnia. 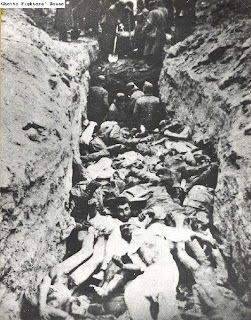 2.151 Jews burying the bodies of Jews from Iasi (Jassy) who died during a deportation by train. 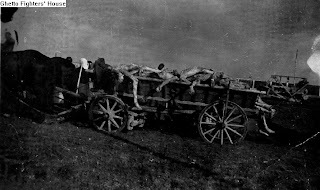 2.152 Jews loading bodies onto a wagon, apparently in the Treblinka camp. 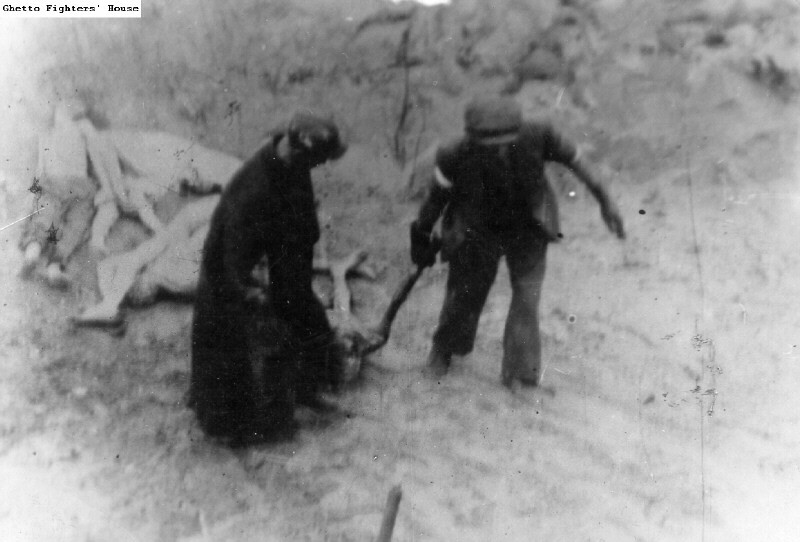 2.153 Jews of the Zolochev (Zloczow) ghetto being brought to the mass killing site beside the village of Jelichowice. 2.154 Jews standing on the verge of a pit at the extermination site in Liepaja, Latvia. 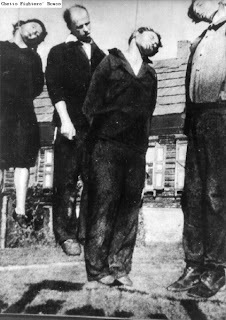 2.155 Jews who were shot during an aktion (mass roundups for deportation) in the Wegrow ghetto in May 1943. 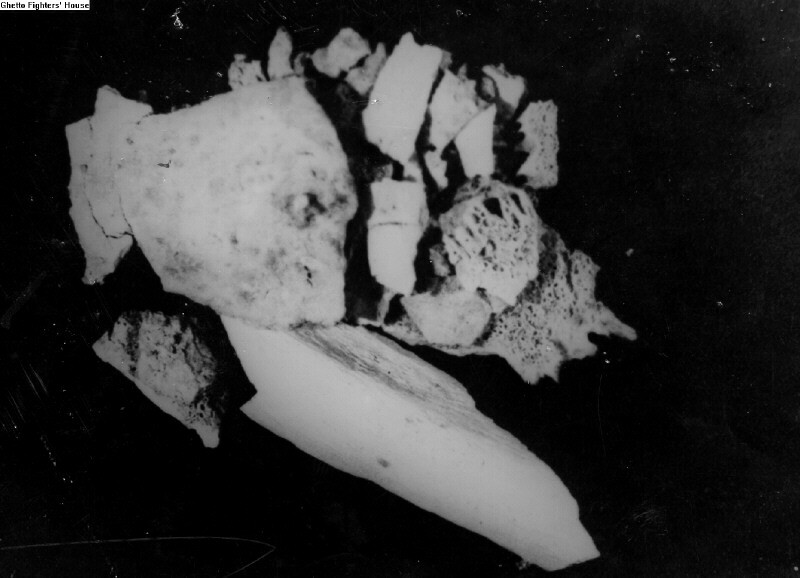 3.1 Bones that were exposed at a mass extermination site. 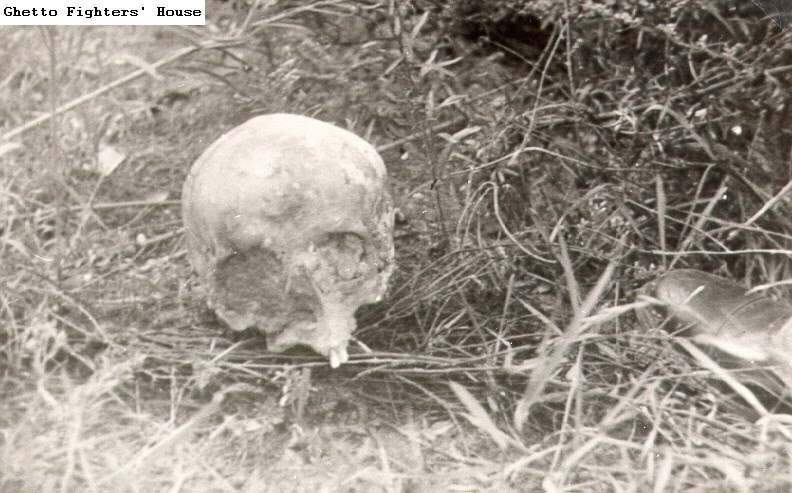 3.2 A skull exposed at a mass extermination site. 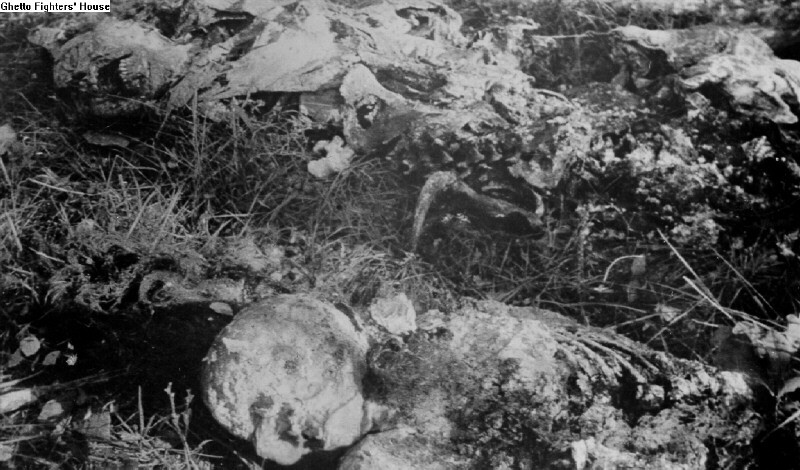 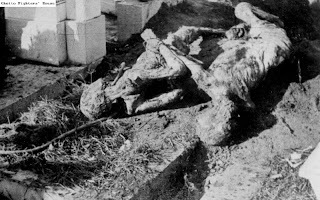 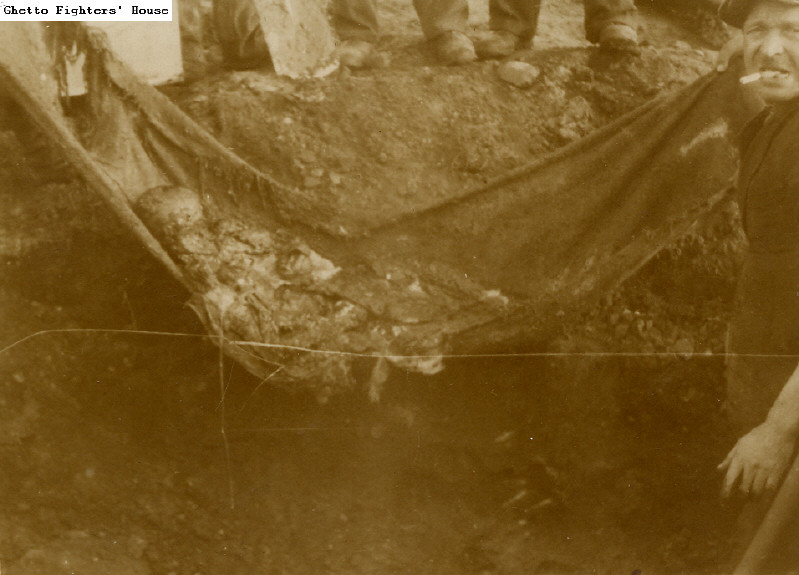 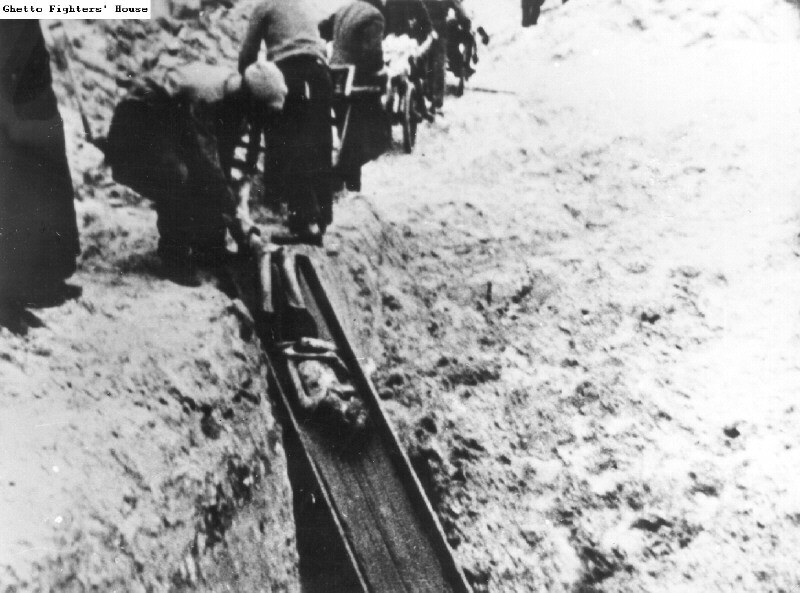 3.3 Human bones exposed in Babi Yar in Kiev, Ukraine, after a flood in 1961. 3.4 Human bones exposed in Babi Yar, Kiev, Ukraine, after the flood in 1961. 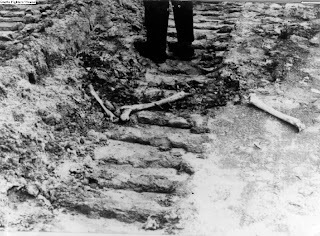 3.5 The remains of Jewish victims in the Sajmiste (Zemun) extermination camp in Beograd (Belgrade). 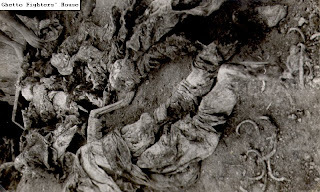 3.6 The bones of victims of the Birkenau camp. 3.7 A Jew in Zychlin, holding a human skull and bones. 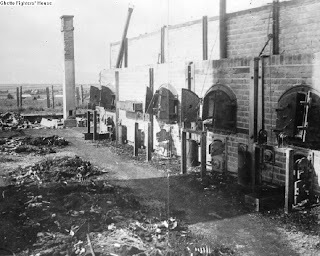 3.8 The crematorium in the Majdanek camp. 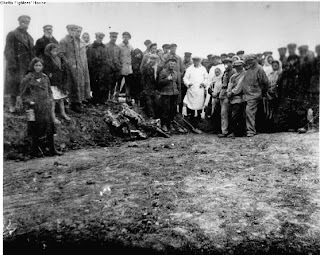 3.9 Soldiers and officers of the Soviet Red Army in the Majdanek camp following its liberation, standing beside the remains of corpses lying next to the camp's crematorium. 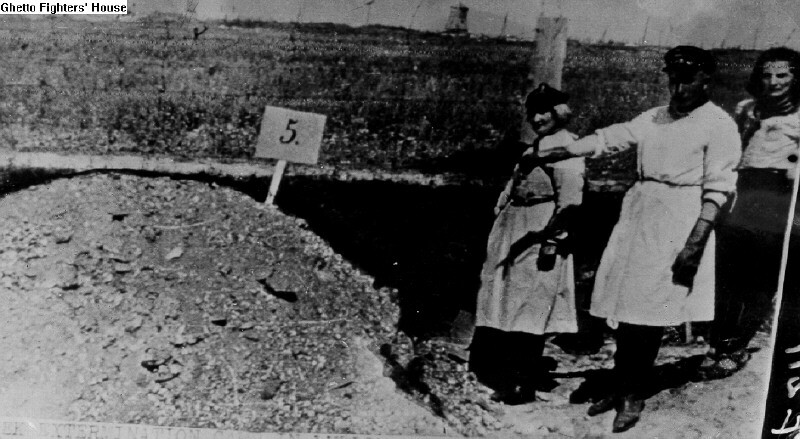 3.10 The area of the crematorium in the Majdanek camp. 3.11 The remains of corpses incinerated in the Majdanek camp's crematorium. 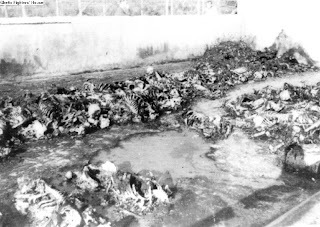 3.12 The remains of corpses incinerated in the Majdanek camp's crematorium. 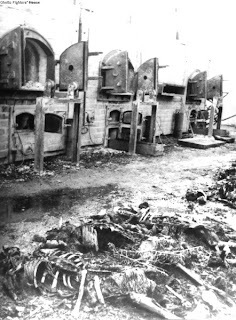 3.13 The remains of corpses incinerated in the Majdanek camp's crematorium. 3.14 The crematorium in the Majdanek camp. 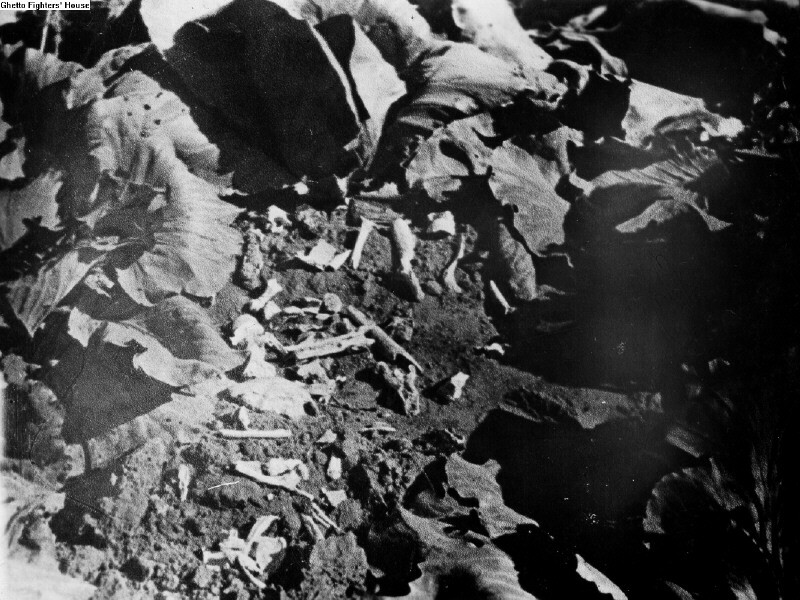 3.15 The bones of victims killed in the Majdanek camp. 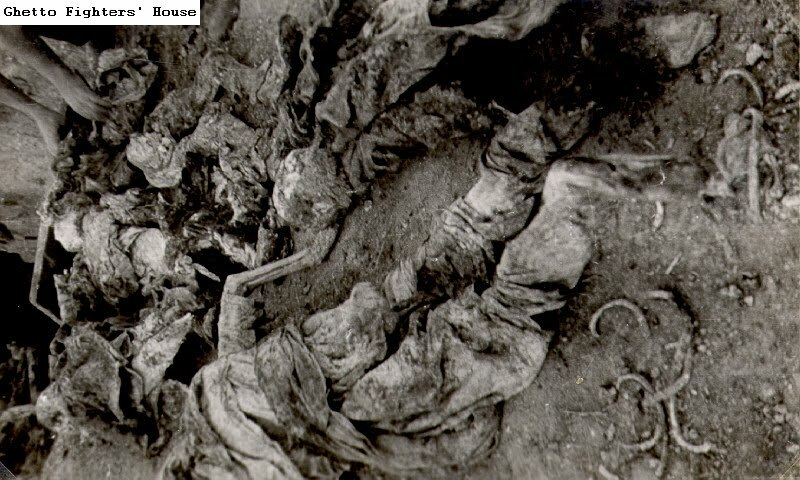 3.16 Bones of victims of the Majdanek camp, in a cabbage patch. 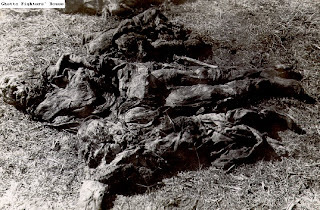 3.17 The bodies and partial remains of victims of the Majdanek camp. 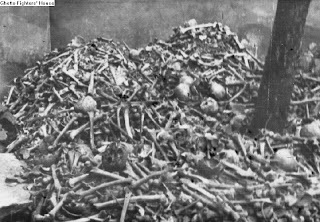 3.18 A heap of bones and ashes of victims of the Majdanek camp. 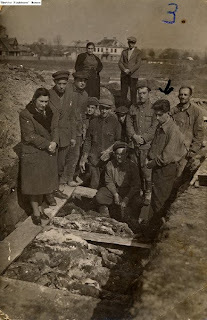 3.19 Civilians and soldiers standing beside a pile of human bones in the Majdanek camp. 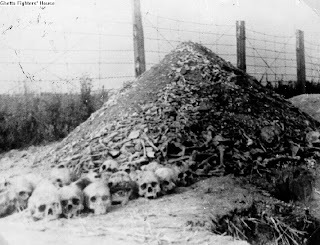 3.20 A pile of bones and skulls of people killed in the Majdanek camp. 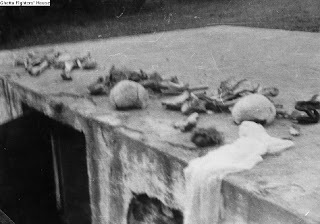 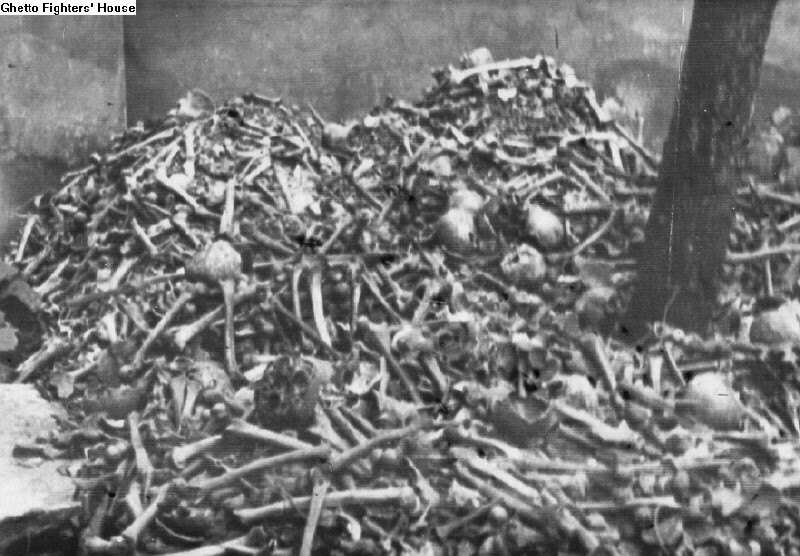 3.21 A pile of bones and skulls of people killed in the Majdanek camp. 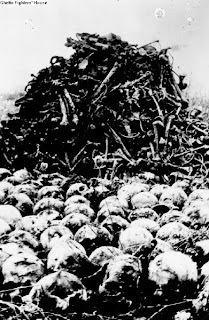 3.22 A pile of bones and skulls of people killed in the Majdanek camp. 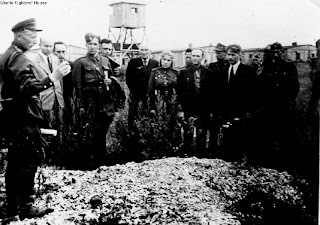 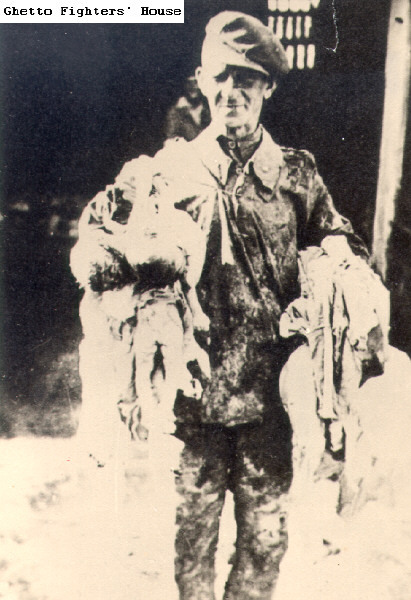 3.23 Civilians in the Majdanek camp standing beside a pile of cremated bones in the area of the crematorium. 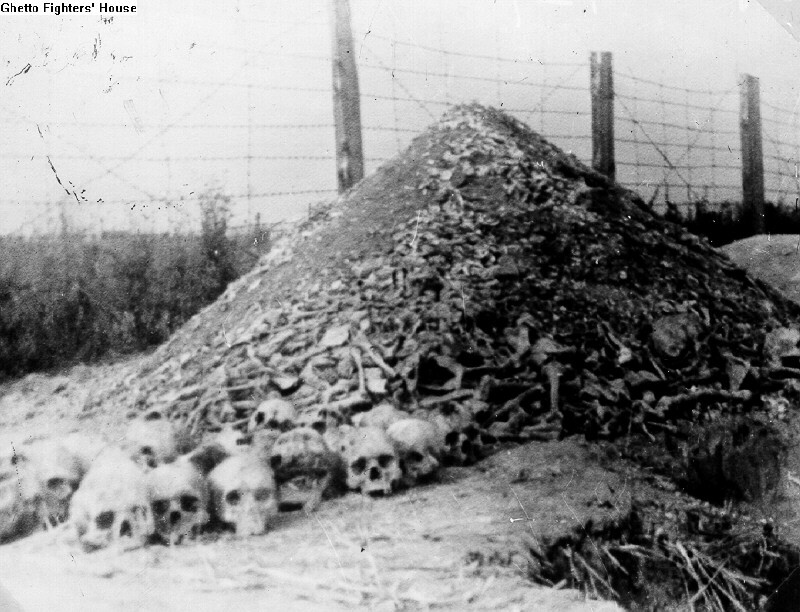 3.24 Civilians and soldiers standing beside a pile of human bones in the Majdanek camp. 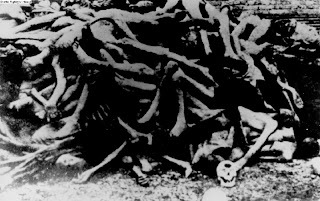 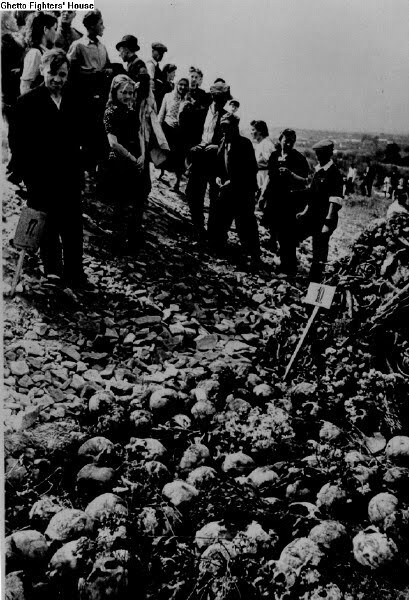 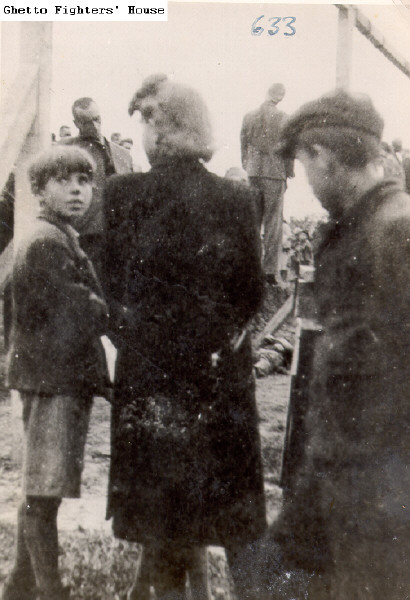 3.25 Polish civilians visiting the Majdanek camp, standing beside a pile of the bones and skulls of people killed there. 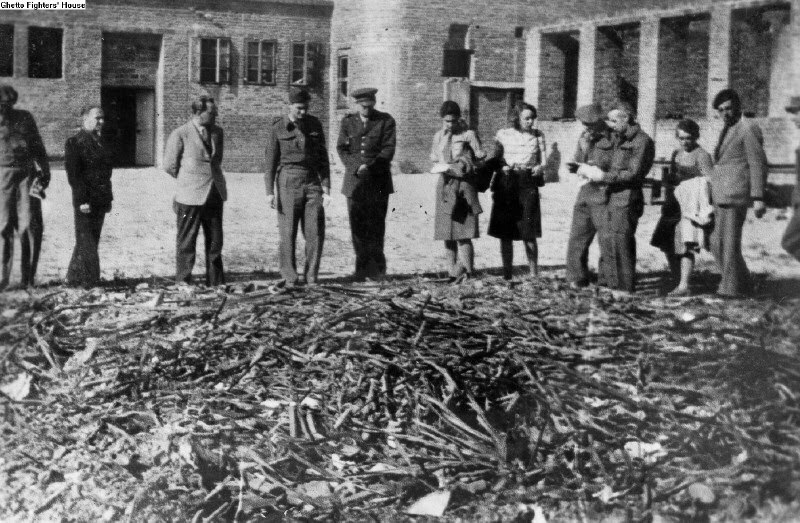 3.26 Polish civilians standing beside a pile of bones of victims of the Majdanek camp. 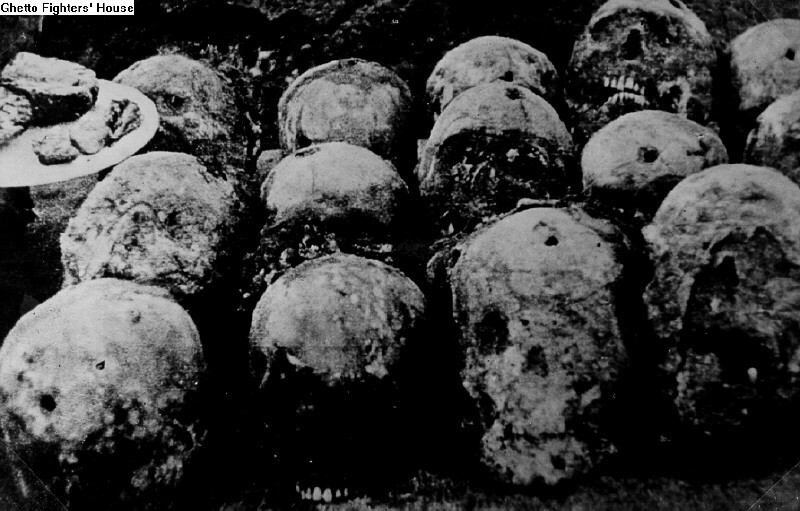 3.27 The skulls of victims of the Majdanek camp. 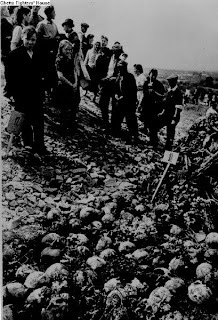 3.28 Civilians and military personnel in the Majdanek camp following its liberation, standing beside a pile of bones and skulls. 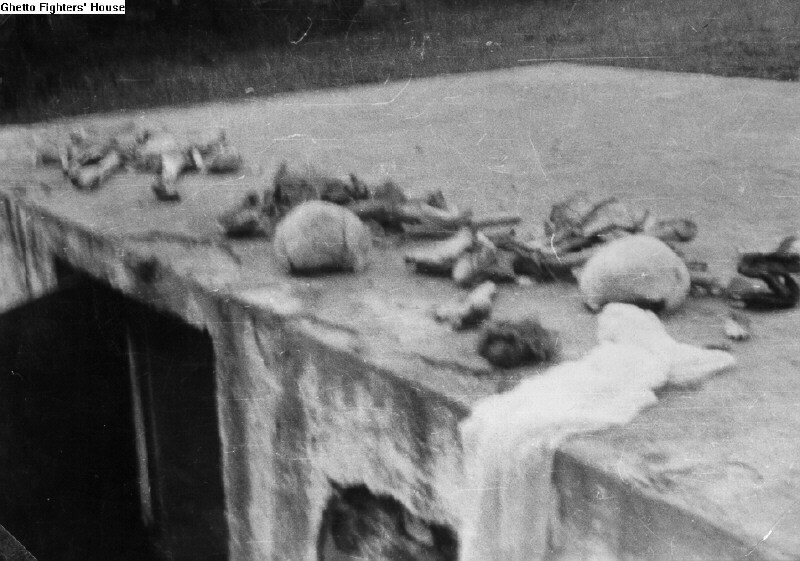 3.29 A pile of bones of victims in the Majdanek camp. 3.30 Members of the USSR - Polish investigative commission in the Majdanek camp, standing beside a pile of bones and skulls of victims killed there. 3.31 Military correspondents standing beside the remains of victims murdered in the Majdanek camp. 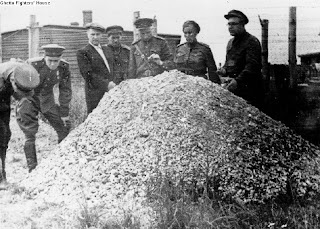 3.32 Soviet Red Army officers standing beside a pile of human ashes in the Majdanek camp. 3.33 A pile of ashes of cremated victims in the Majdanek camp. 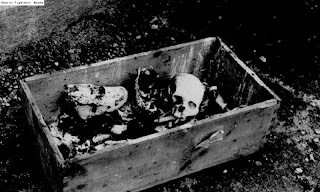 3.34 The skeleton of an inmate killed in the Pionki camp, disinterred following the camp's liberation. 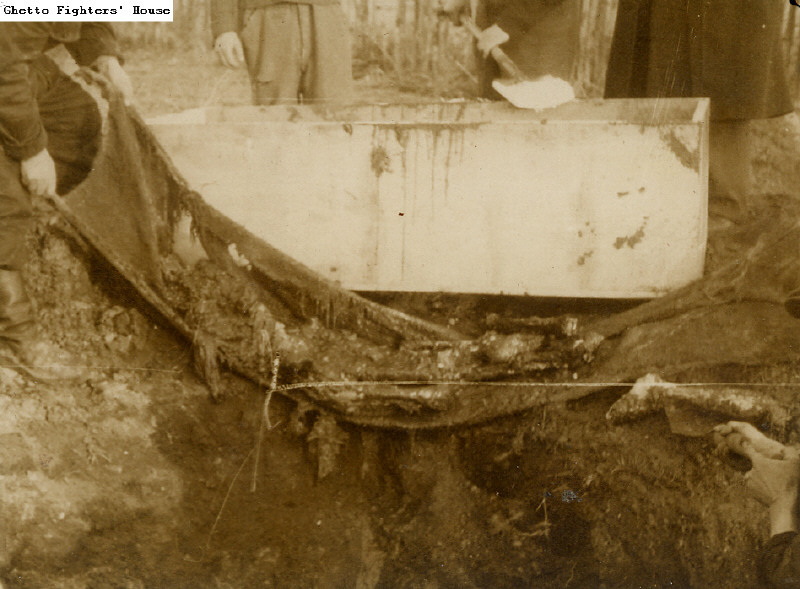 3.35 The bones of Belzec camp victims, exposed after a rainfall in the area. 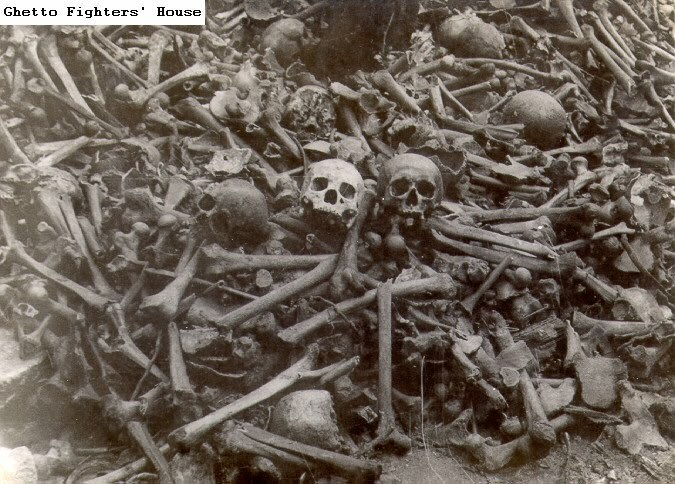 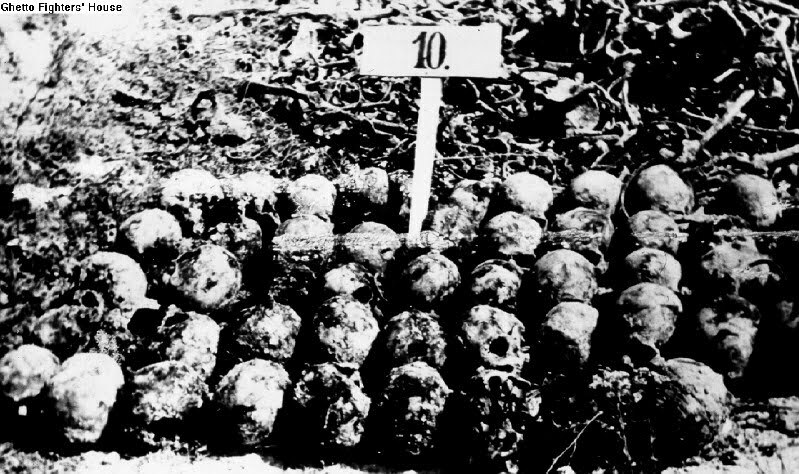 3.36 The skulls and bones of Belzec camp victims, brought to a bunker on the grounds of the camp. 3.37 Hair, bones and ashes found on the grounds of the Sobibor extermination camp. 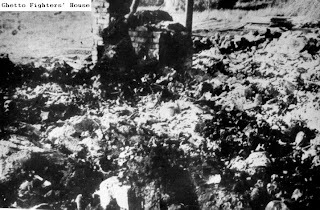 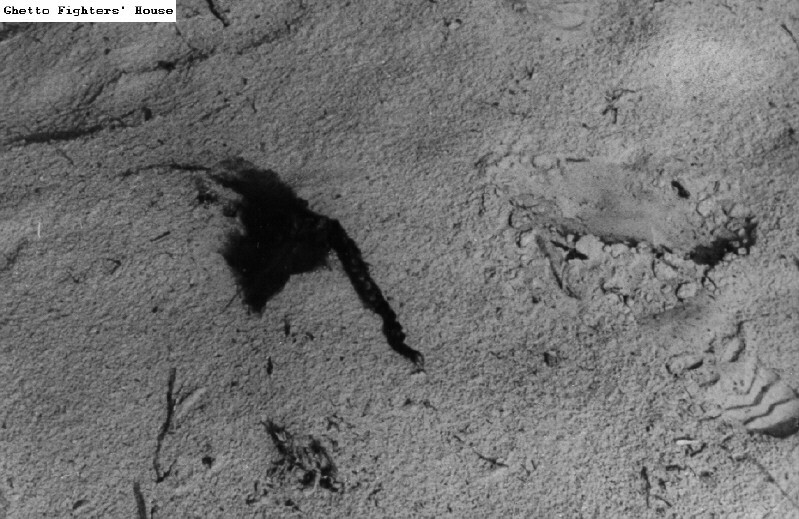 3.38 Hair, bones and ashes in the area of the Sobibor extermination camp. 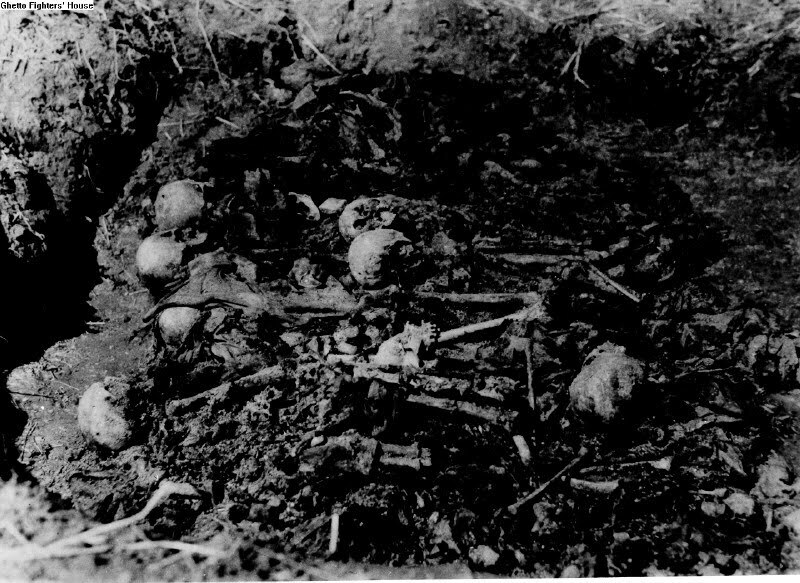 3.39 Skeletal remains at the site of the Treblinka extermination camp. 3.40 Human skeletal remains in the Treblinka camp. 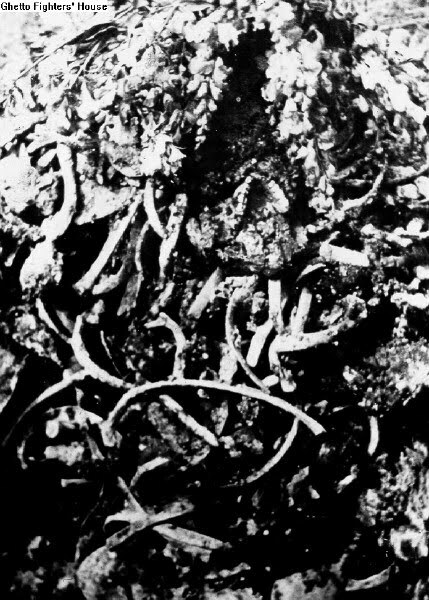 3.41 A heap of ashes in the Treblinka camp. I took some pictures in your post. If a pile of ashes is proof of cremated corpses then in the barbecue down my house somebody has cremated a Jew. Many of the captions are wrong. 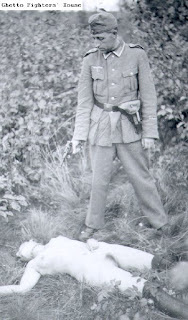 The dead are Germans. 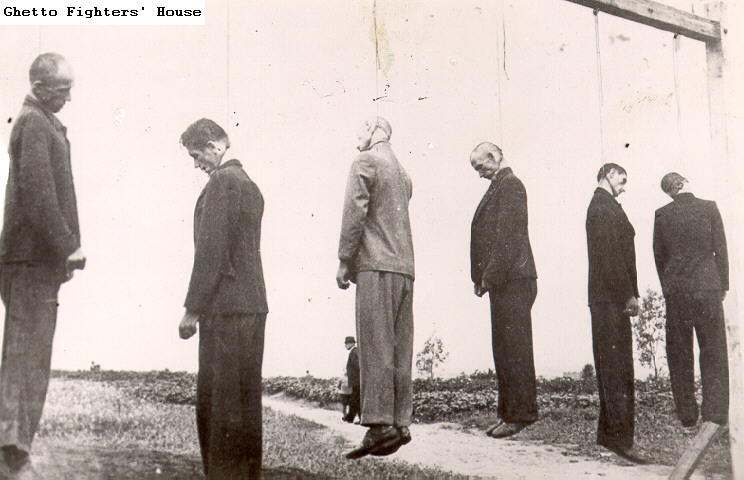 Keep urging on an attack on Iran, you will have a new batch of photos, real ones not fake ones, in color. 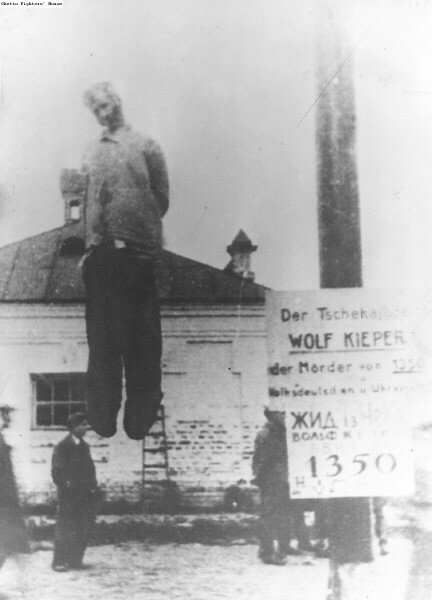 The attack on Russia by Germany was manipulated by some powerful body. 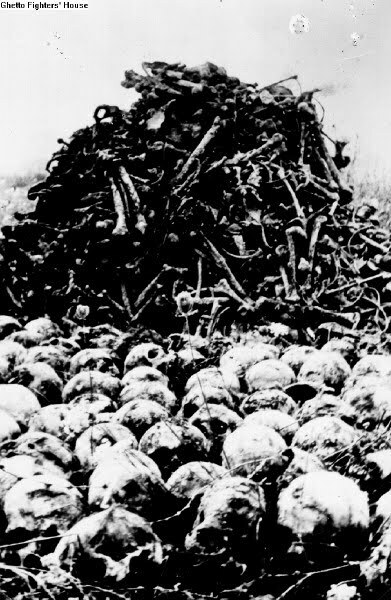 One could assume that those who allowed Germany to achieve such power so soon after WW1, was to eliminate Communism(#1 enemy of the Filthy Rich)& then vilify & eliminate the tool they used. 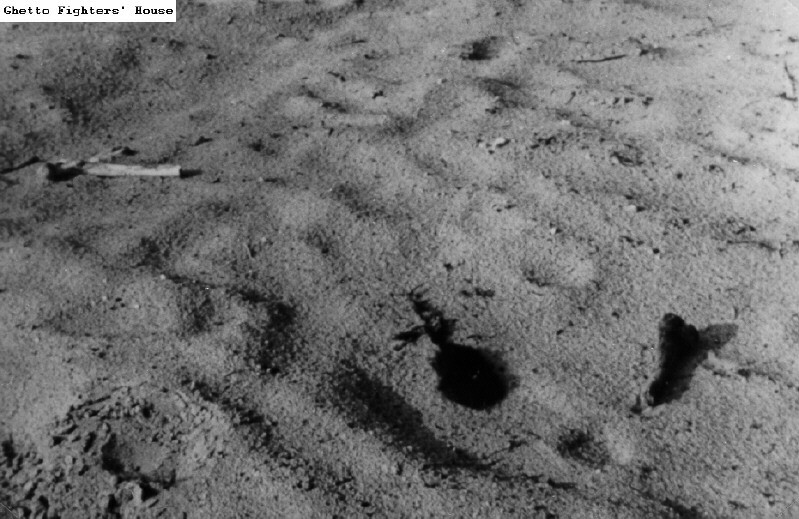 Bobbyclobber's comments are not as dumb as david's, but the only intelligent comments so far are Daniel's. 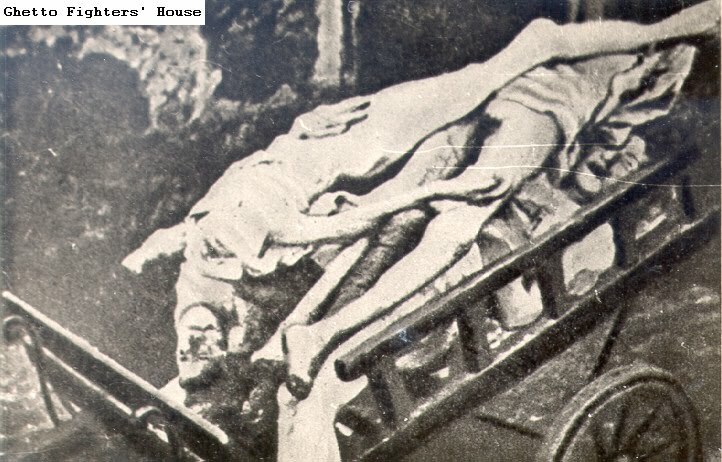 Hhe is reading too much garbage as Viktor Suvorov. 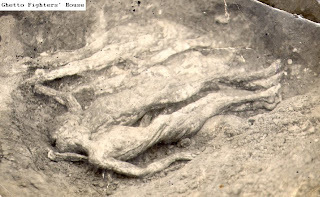 Estou procurando materia sobre Drobitski Yar mas está bem difícil de achar. 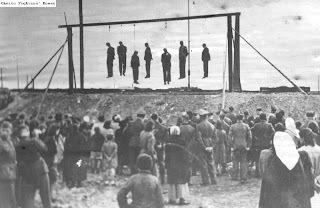 O que achei está muito ruim, nada mais detalhado. I think David has been watching too many Michael Moore nonsense conspiracy movies. 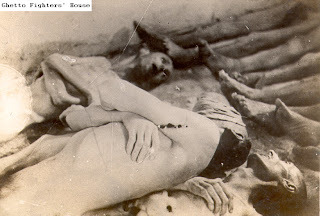 I've heard about people like him that don't believe the Holocaust really happened. 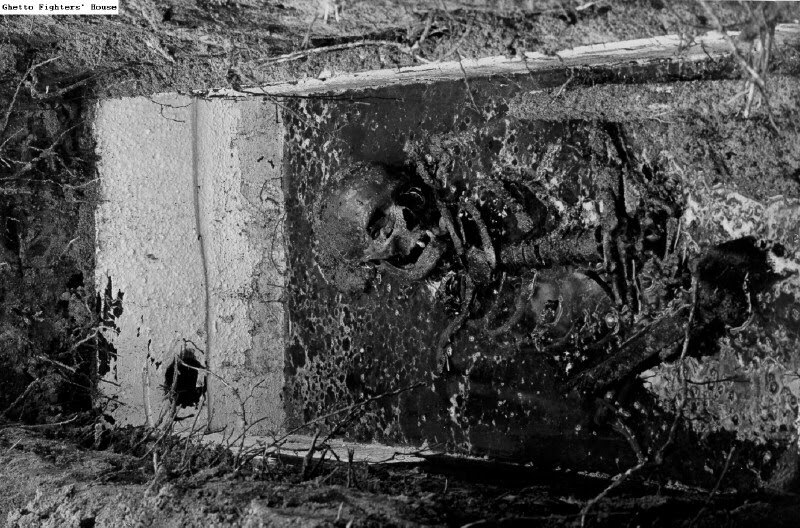 Time for a brain transplant. David, cause you really need one. 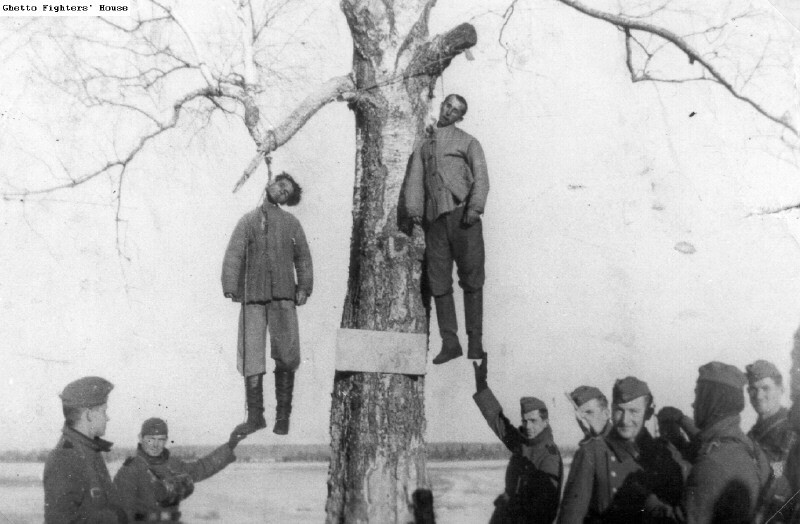 Oh, and too bad you only like your pictures in color, because historical pictures prior to the 1960's were mostly in black & white. How's 3rd grade working out for you? 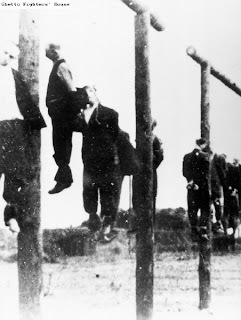 Quit saying JEWS. 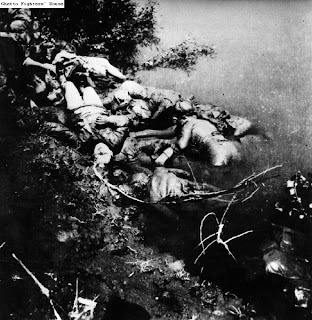 It was blacks, asians, italians...etc. There were no jews before the holocaust. 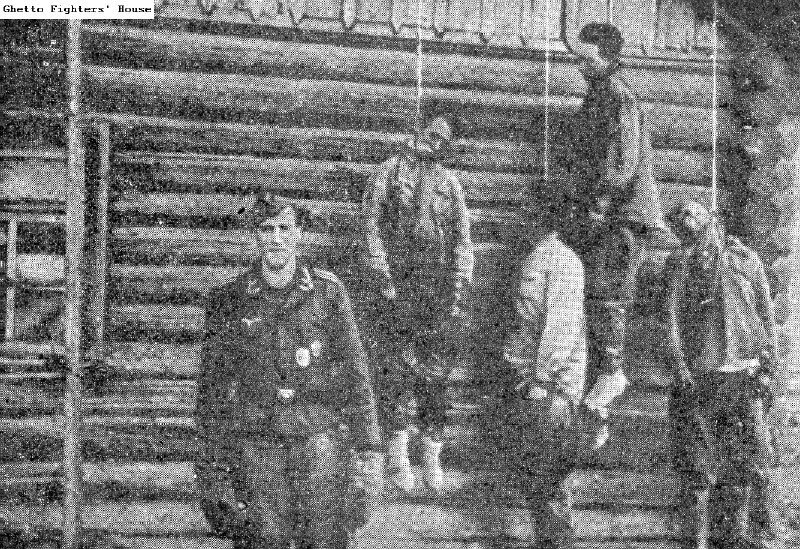 It is just an anagram for the word "hate"
Your comment really should go down in history as the most ignorant thing ever written. 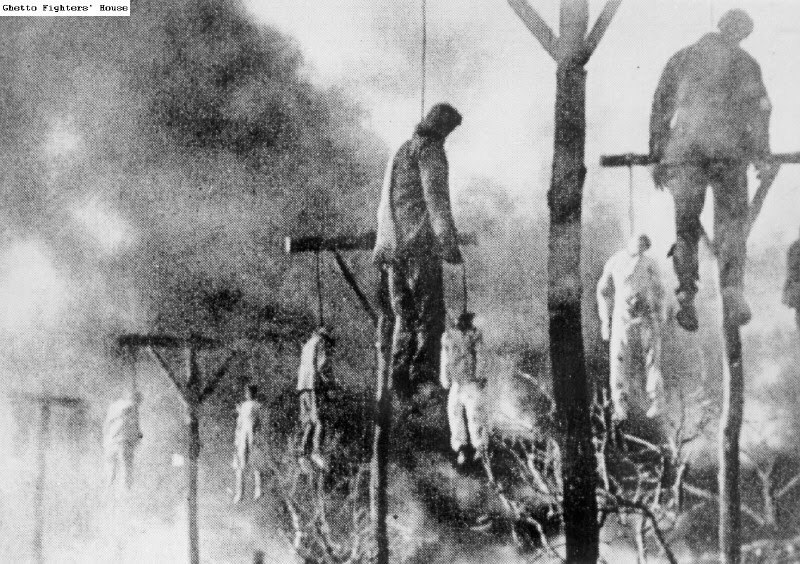 Yes, tell me about the vast amount of blacks and asians in Europe during the time period this took place in. 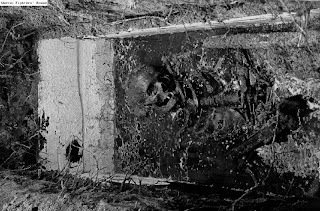 To be honest I don't know why I'm wasting my time writing this, you probably can't even grasp the concept of sarcasm. Robert, Daniel, SC, and Schmatt all probably still believe that 9/11 was done by Bin Laden and Al Qaeda. 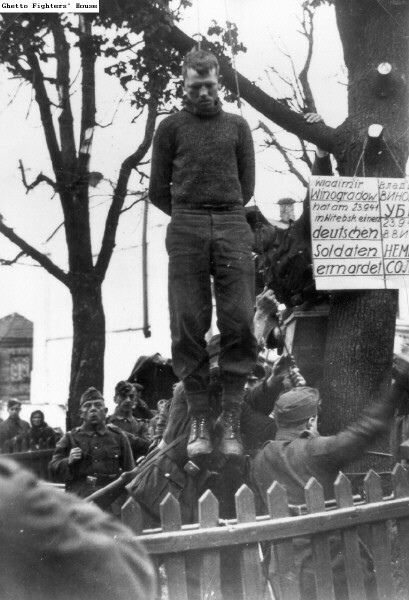 It's crazy there are still people like you out there! 9/11 was perpetrated by the same group who destroyed Russia in the 1900's (20+ million murdered), China in the 1900's (50+ million murdered), has terrorized Palestine for the last century, and who continues to spread terror around the world today. Do some honest research and you will easily find the connections. 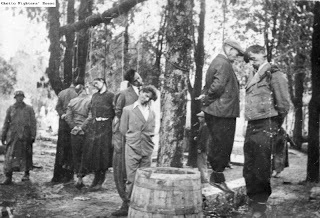 Yes, this same group lied about the Holocaust...and WWI...and Pearl Harbor...and Vietnam. 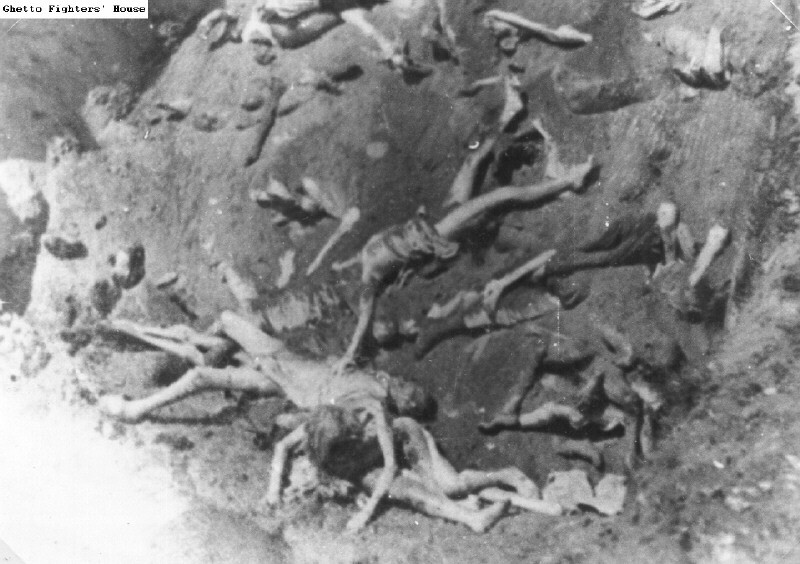 Nobody denies that there are war crimes and that people are killed. But the fact that these photos are all labeled with the same 'JEW' title without a shred of support is very concerning. It's time to do a little work to learn the truth instead of effortlessly sucking on whatever statements people throw at us.